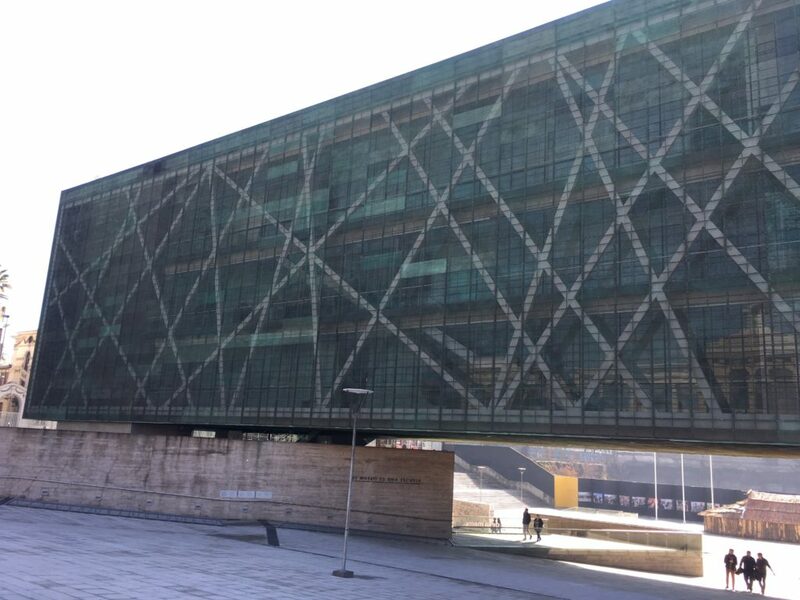 After our day wandering around Santiago, it was time to check out from the W and head to the airport. We were fortunate that the hotel agreed to a 5pm late checkout, meaning we could stay around most of the day before heading to the airport. A bonus nice touch, at the reception they were offering champagne not only to customers checking in, but also to those checking out. Nothing super high quality, but a classy touch! 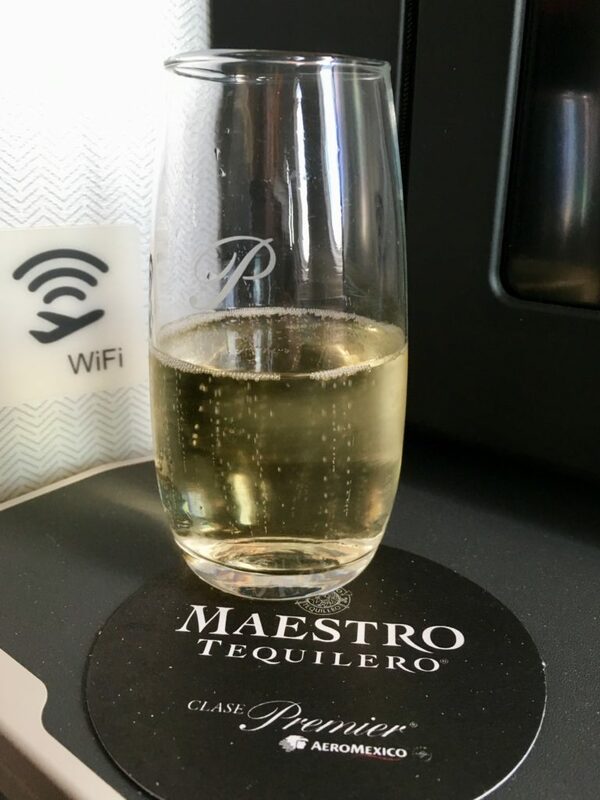 We had been able to check in with Aeromexico on the app, so headed straight through to immigration and security which had hardly any line and off to the Delta Skyclub to spend the hour or so before it would be time to board. 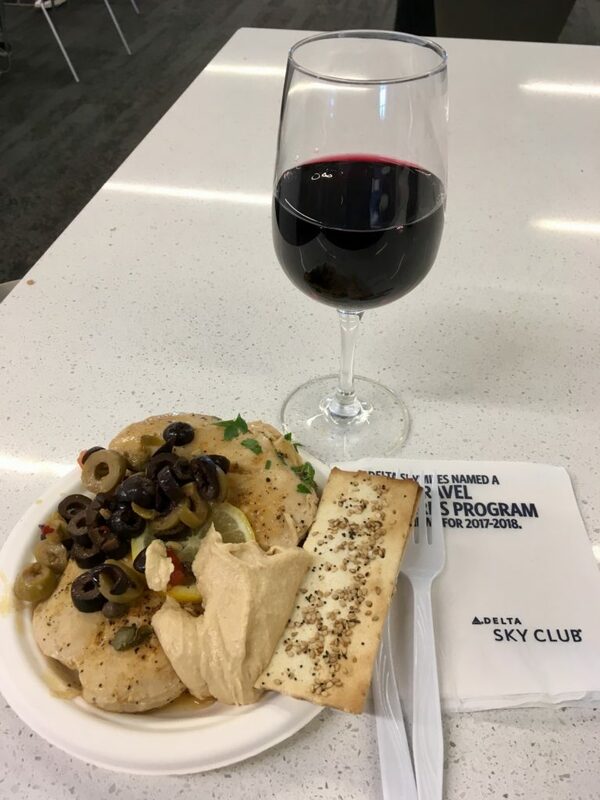 The Delta Skyclub, unfortunately, is one of the more dismal ones I’ve encountered. It’s in the basement at tarmac-level (ie, below boarding/jetbridge level) and was pretty small and cramped. Almost every seat was taken, and it only thinned out a slight bit in the time we were there. 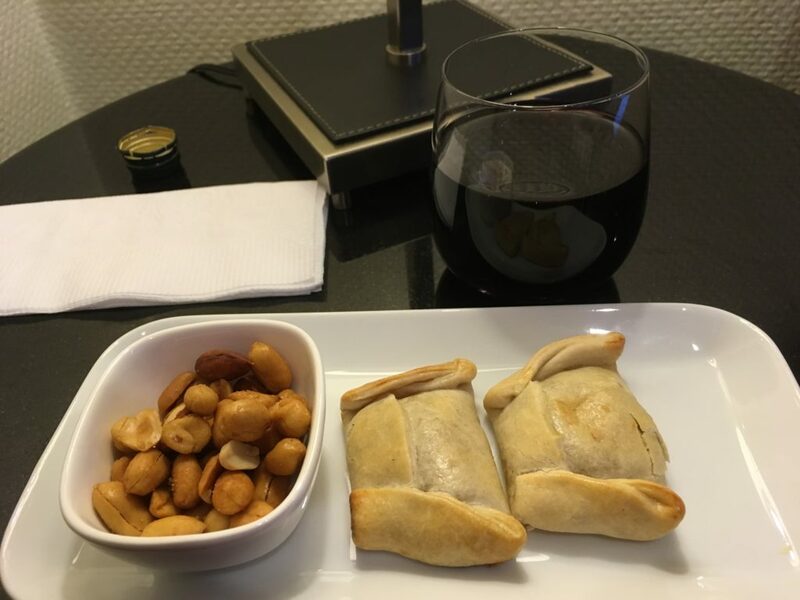 A glass of respectable Carmenere and some empanadas and nuts were marginal at best…but it wasn’t terrible either. Adequate, but nothing I’d ever go out of my way to spend time in. Off to the gate, where a huge group of gate lice had formed, and people were clearly in a grumpy and agitated move. To the point I had one guy shove me out of the way because it was very important for him to board first. Um, dude, the priority boarding line was more of a scrum, and since we’re all in this together…I don’t think those five seconds you saved were worth being nasty to people. Very proud of the example you set for your kids. Heh! 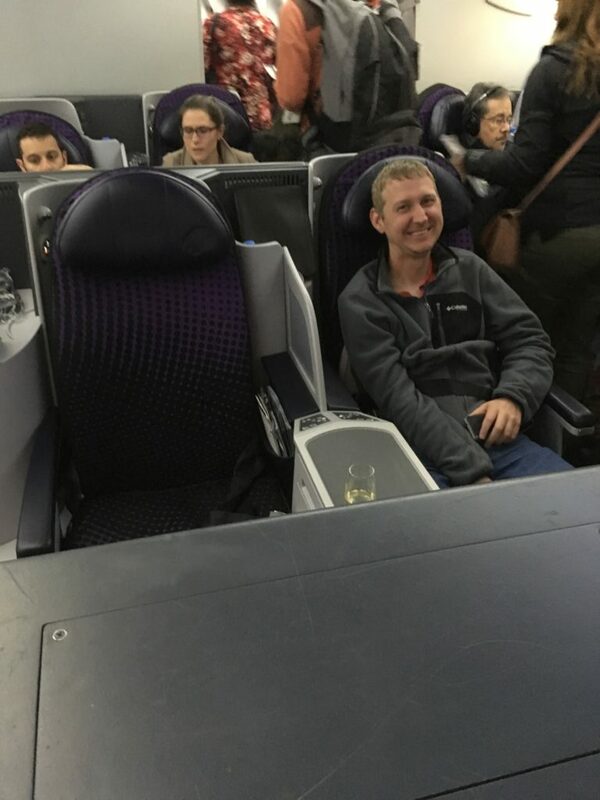 The 2x2x2 seating, being modelled by Phil during boarding. 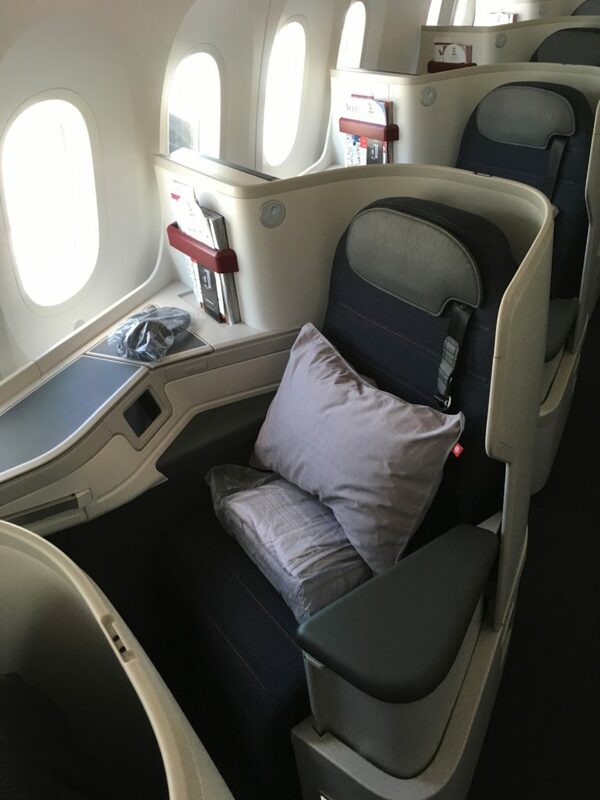 Not bad, but certainly not as nice as the 1x2x1 seating in the same plane! Despite being a late flight, the crew was pretty slow to spring into action. 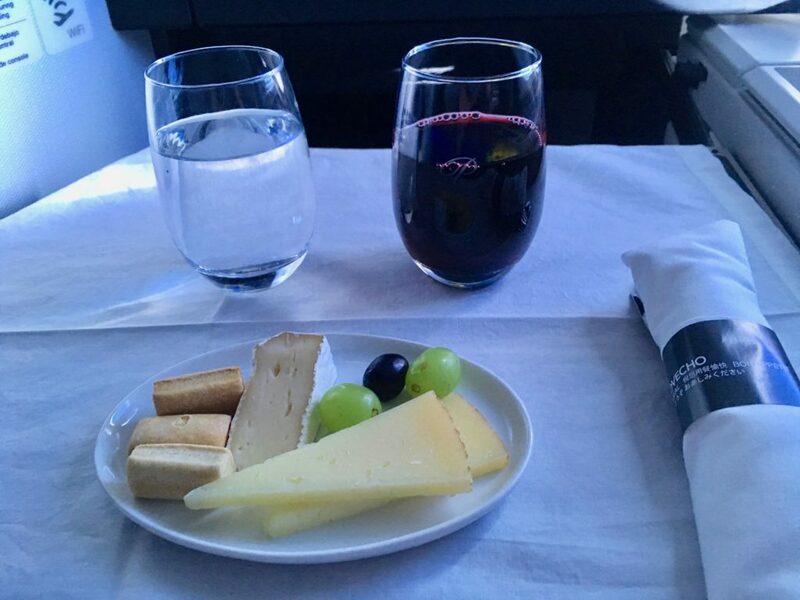 The wait, however, was rewarded with cheese as a starter again. It’s going to be really hard to go back to United and their semi-warm nuts. I’m also super fussy on my fruit, but the strawberries were perfectly sweet and delicious, and the whole combo went nicely with a glass of cabernet. I ordered the hockey puck as a main course…I mean grilled chicken…which would have been a terrible miss if not for three things: (1) lots of protein (2) the goat cheese sauce, and (3) the fact I was starving. The salad was also pretty terrible, and the lettuce tasted funny. 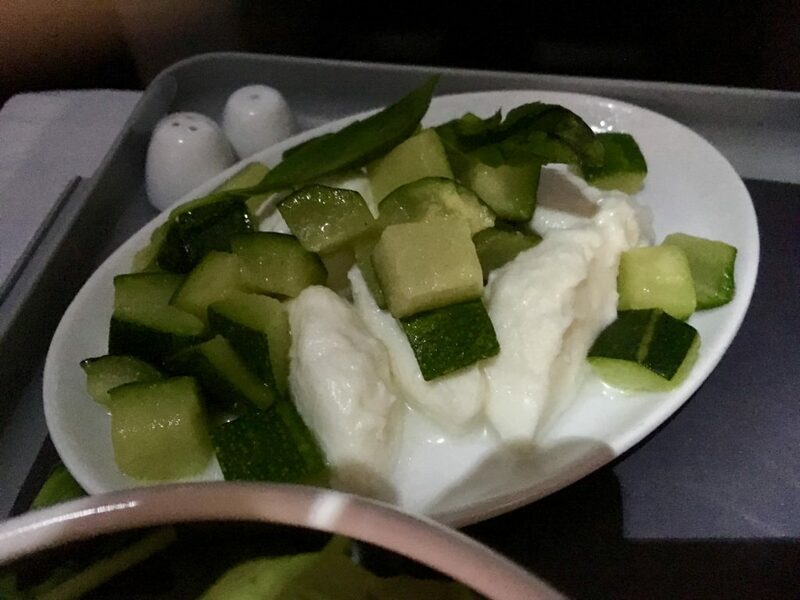 The mozzarella, zucchini, and basic starter was just odd when there was already a salad on the tray, and a cheesy main course. Overall, a pretty disappointing meal. To top that off, this just doesn’t look appetizing at all. 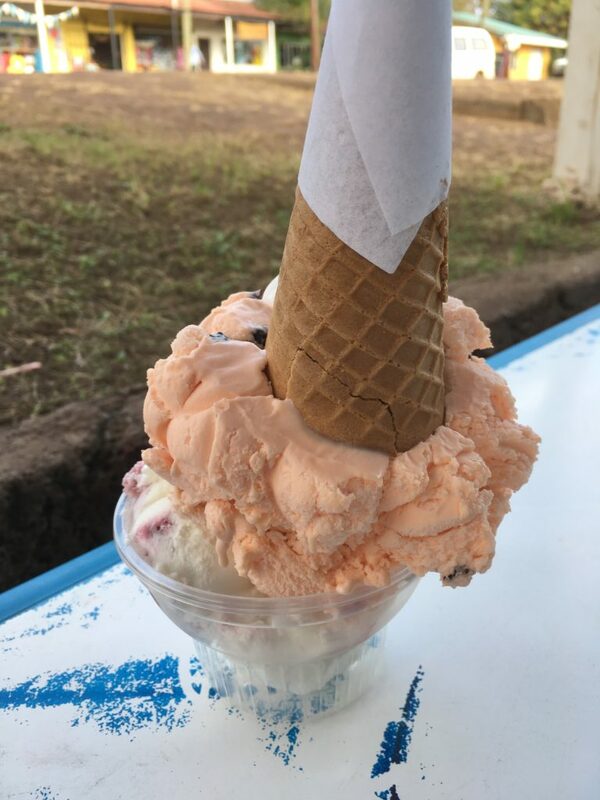 I took one bite and skipped the rest. According to the crew, there was no dessert, despite it being listed on the menu. I don’t think they were being lazy, I think it just genuinely wasn’t loaded at all. Oh well. Got a few hours of pretty decent sleep, and soon we were descending into Mexico City where we would arrive nearly 45 minutes early. 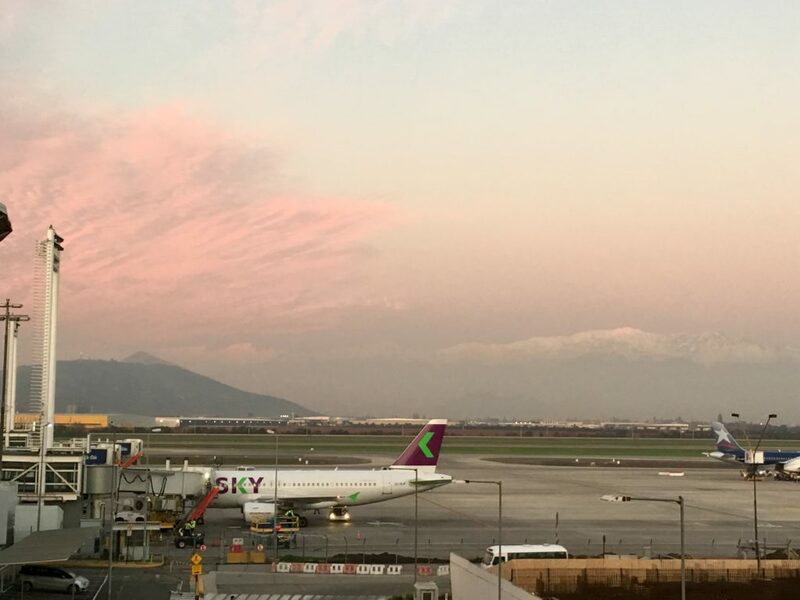 Mexico City is like the US in that international and domestic flights are mixed in the same terminal, so everyone has to go through immigration first. Fortunately, we had plenty of time and the lines at immigration weren’t bad, so it was a pretty painless transit experience. 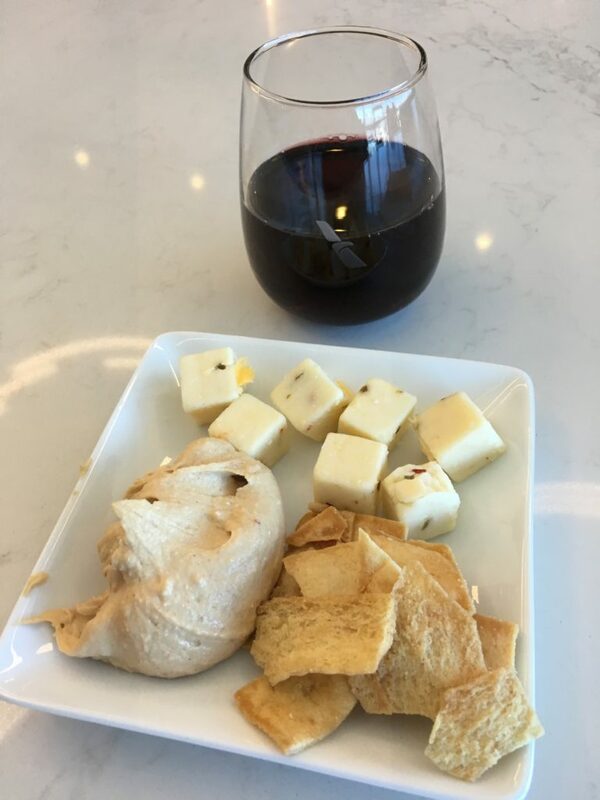 After Starbucks, we headed up to the American Express lounge to relax and wait for our flight as well as shower. When we arrived, I asked about a shower, and the agent informed us there was a two hour waitlist for the shower. Seeing there were less than five people in the lounge, I asked how this was possible. Apparently, the showers are shared between the Platinum and Centurion lounges, and Centurion members don’t get priority. 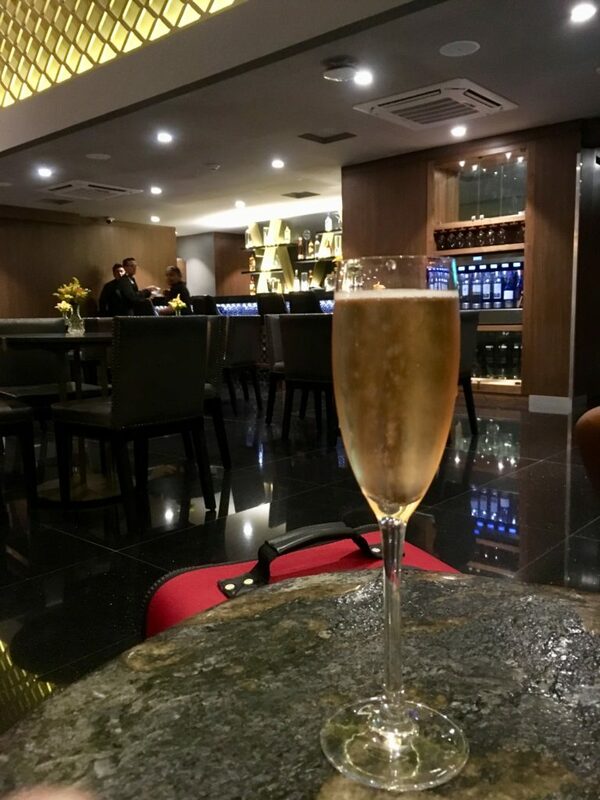 With all the money AmEx has been sinking into making great lounges lately, it’s hugely disappointing that Centurion members often have to wait for a table in US lounges (or get the evil eye if they take one of the reserved tables) and now apparently they have to wait for showers too. What’s the additional benefit of the card then?! Off to the gate, un-showered, where I was just in time for boarding. Said goodbye to Phil who was off to LA, and about five minutes later we started boarding. 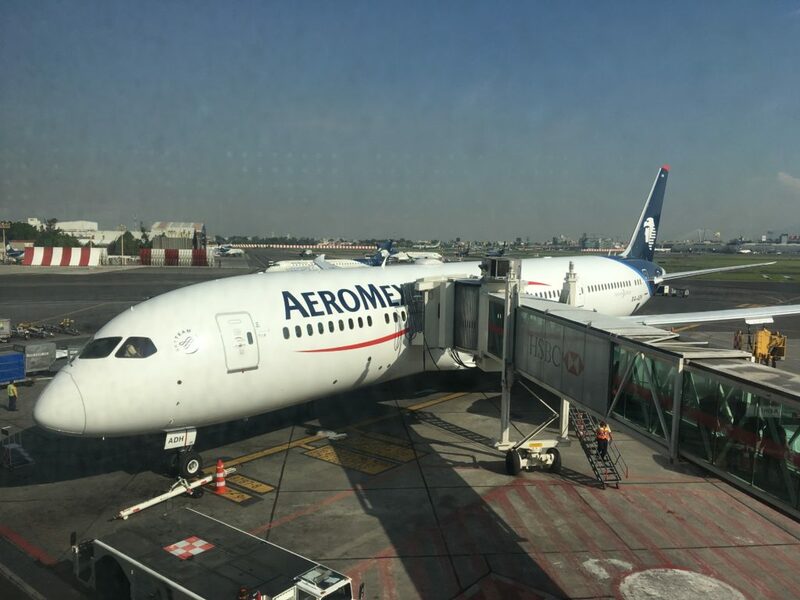 Unfortunately, about three weeks before my flight, Aeromexico had changed the aircraft from a 787 to a 737. Ugh. I mean, not the end of the world at all, but when you book a specific routing because of the aircraft, it’s disappointing when it changes. 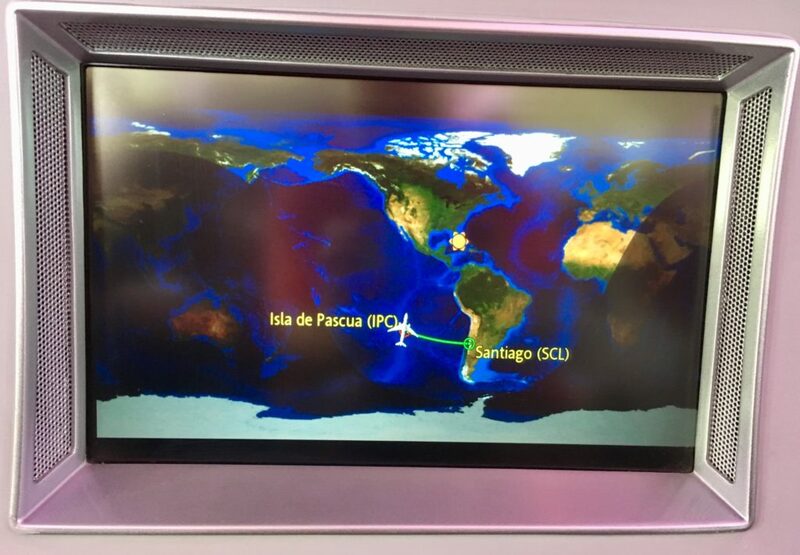 Of the 16 people on the flight, I recognized at least 10 of them from the flight to Santiago. Either lots of people got in on this JFK to Santiago fare, or it just happened to be a super popular routing today. 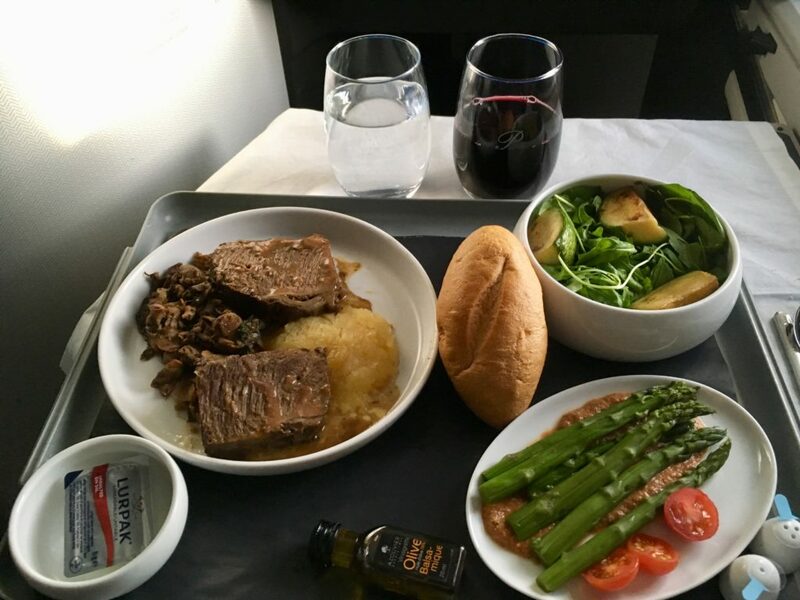 Fortunately, this time, I got my first choice of meals and what was described by the crew as a tamale was reasonable. 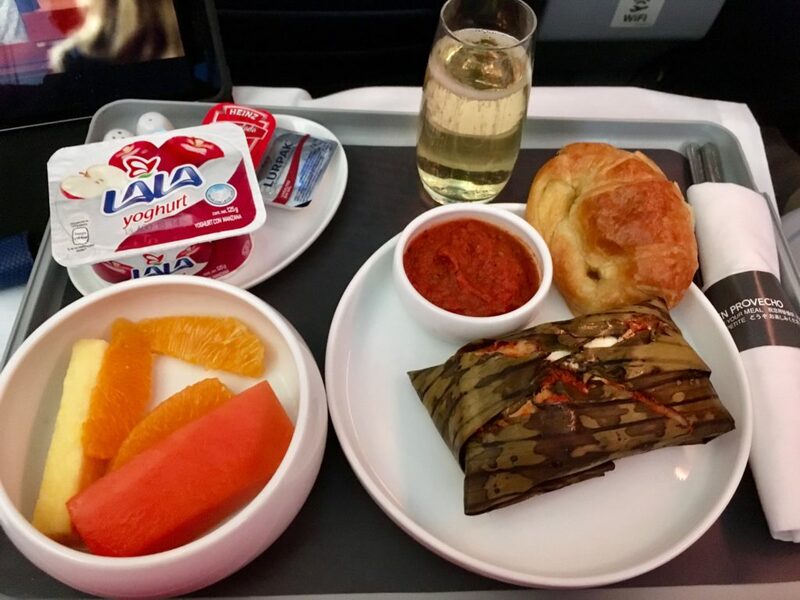 Since vacation was almost over, why not have a champagne breakfast. Reasonable breakfast, and probably the only reason it stood out was the chance to have a unique breakfast option. I feel like in the US it’s always the same nasty eggs or cereal, so the variety was very appreciated. 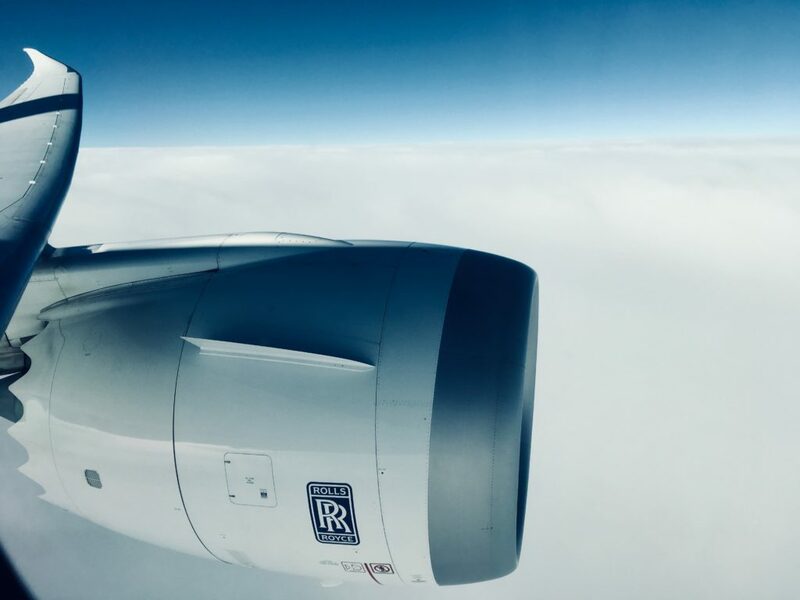 Also, the 787s had the terrible wifi where you paid like $20 and got 50MB, which you can go through in 10 minutes easily – quite a ripoff. On the 737 it was wifi by GoGo, and for like $15 I got unlimited for the whole flight. For a daytime flight, that’s almost enough to make me want to choose the 737 over the 787. Did I mention I’m WiFi addicted? Landed at JFK right on time, and despite JFK tending to be a bit of a nightmare there was no wait at immigration for Global Entry, and I was out and looking for the SkyTrain soon. Boarding for the flight to DC was right on time, and it was nice to have a 737 for such a short hop! 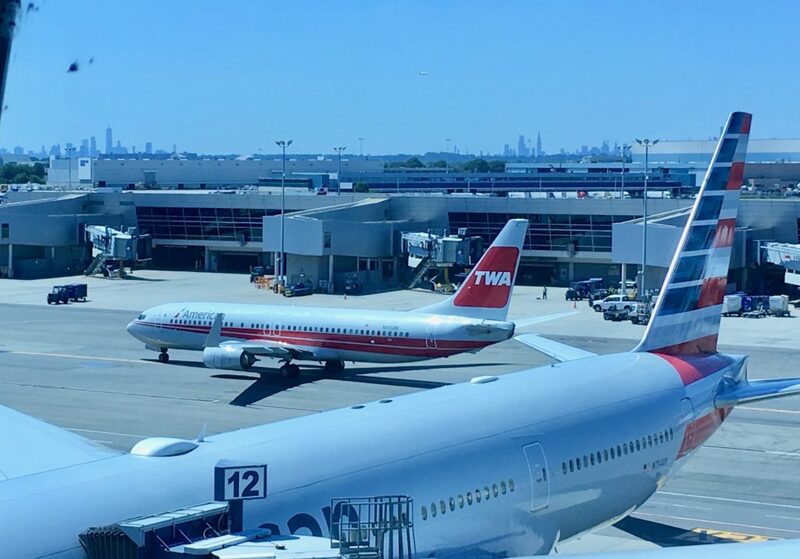 Not just a 737, but the TWA heritage livery plane. As an aviation geek, I love the nostalgia of this. I wish more airlines would do it! Nothing to say about this flight, it was almost 30 minutes early into DC (that happens when you have the rare short taxi at JFK and aren’t #30 in line for departure) and with that the trip was over all too soon. I wasn’t sad, however, knowing I had two more international trips coming up in under a month. I was actually starting to look forward to time at home more than time on planes! That said, be on the lookout for more posts very soon! Had a nice leisurely morning since we were in no rush, and let the host know we wouldn’t need breakfast since we were going out for one last long walk and would just grab something on the way. In a way, I think they were a bit offended we didn’t want to eat breakfast there, but at the same time…it saves them money. I’ve never understood how a hotel/etc is such an important part of the experience that it’s so important – but then again I’m not a big breakfast person. Give me a nice strong cup of coffee and maybe a small roll or such, and I’m good to go. Strolled around the city for a bit, grabbed coffee at Polynesian Coffee and Tea again, and after only two days the proprietor was sad to see us go. 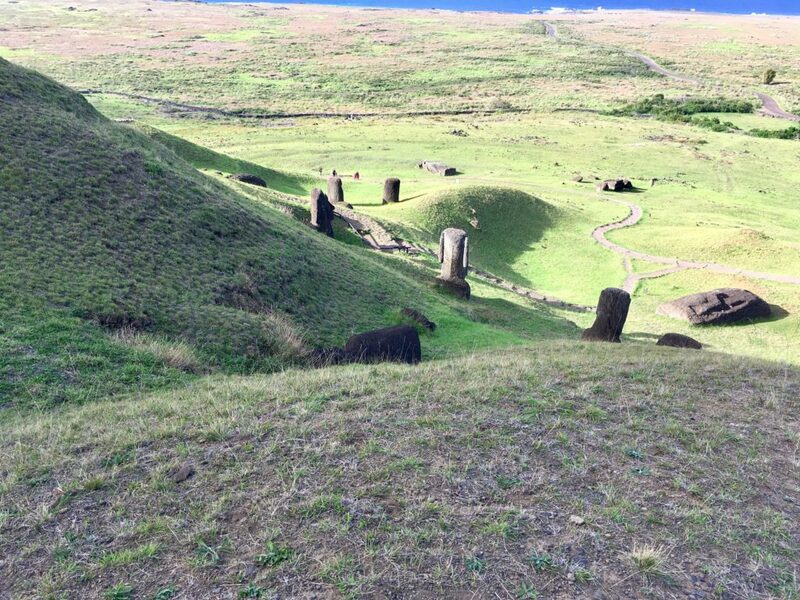 Seriously, if you go to Easter Island and like good coffee, this is the place to go to! Our host dropped us at the airport (after making sure again that everything had been perfect, and nothing was wrong with the breakfast) and gave us leis again as a farewell. 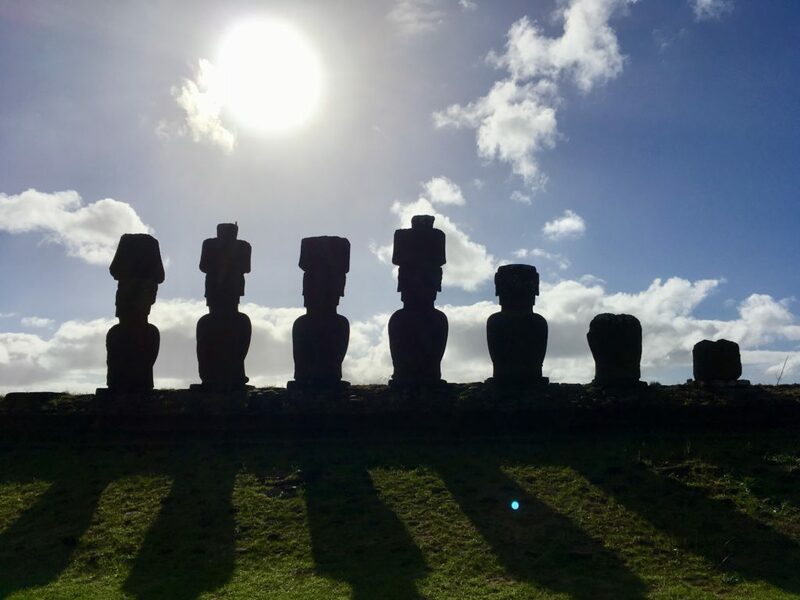 A fantastic island experience that made us feel more like family than hotel guests, and I can’t recommend it enough if you’re looking for a unique experience. I just realized, it seems like I’m gushing about this trip. Maybe that’s because I finally spent four straight nights in the same place on vacation. 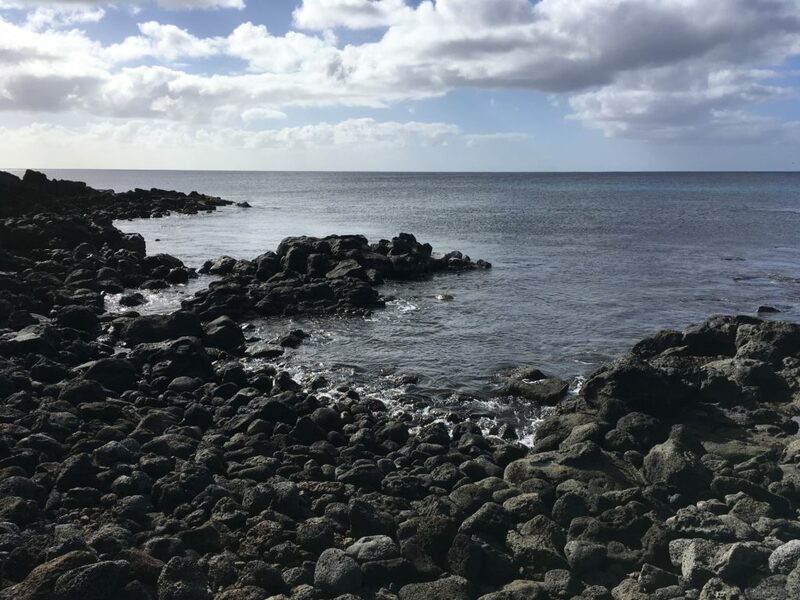 Maybe it’s because we tried a few unique new things and really enjoyed them…either way, it definitely ticked the box of a nice relaxing vacation! Nice quick check-in at the tiny airport, and grabbed a shot of our plane from the other side of the fence while waiting to be let through into the secure side of the airport. I’d say the departures hall but, well, it’s not so much a room as just the open air on the other side of the security screening! In the security line is when I realized I still had the key for the geodesic dome. 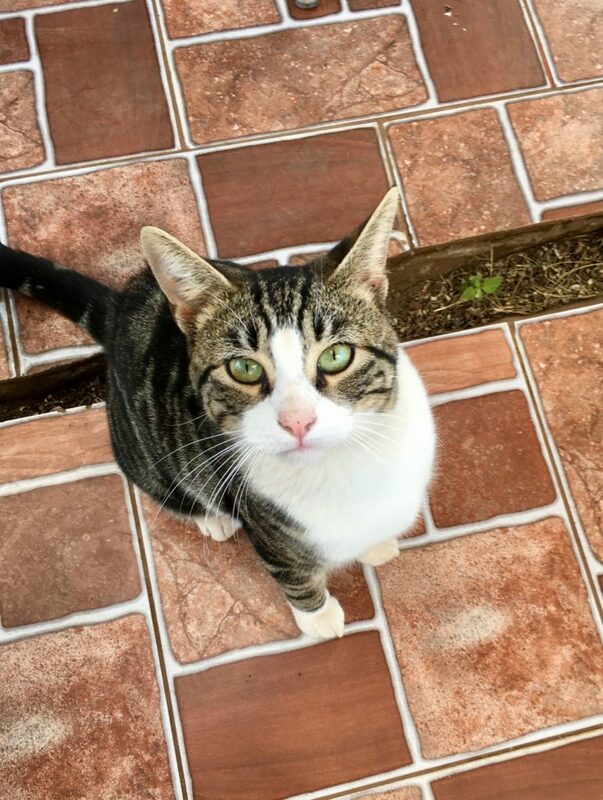 I went up to the coffee shop in the airport, and figuring since it was a small island, I could just ask her to call the owner…and then leave the key with her. She wasn’t able to get ahold of him, but promised she’d hold onto the key until she could get ahold of him and he came to pick it up. There’s something to be said for small places where everyone is like family! 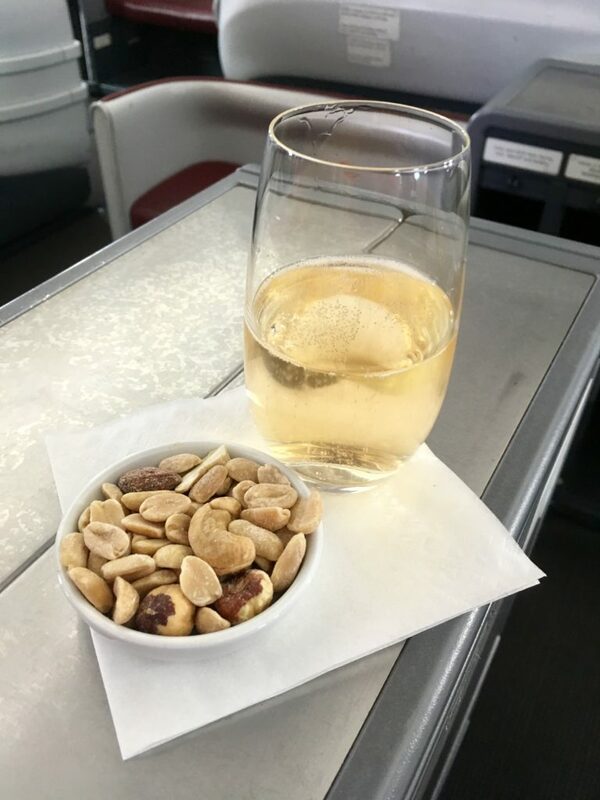 Ooooh welcome aboard and pre-departure beverages offered by a friendly crew…including champagne and mixed nuts…before takeoff! Nothing much to say about this relatively short flight. Domestic flight so we went straight to the taxi area, and probably 10 minutes from the door of the plane opening we were in our taxi. Unfortunately, it was absolutely pouring rain, and there were multiple accidents all over the place, making our drive to the hotel take over TWO HOURS. Yes, I get that it was rush hour on top of it, but what a nightmare experience. We didn’t have much energy at that point for anything other than a quick dinner, so walked a few blocks to Tiramisu which had opened a new room since the last time I’d been there, that was a bit of a bar with 20 craft beers on tap. 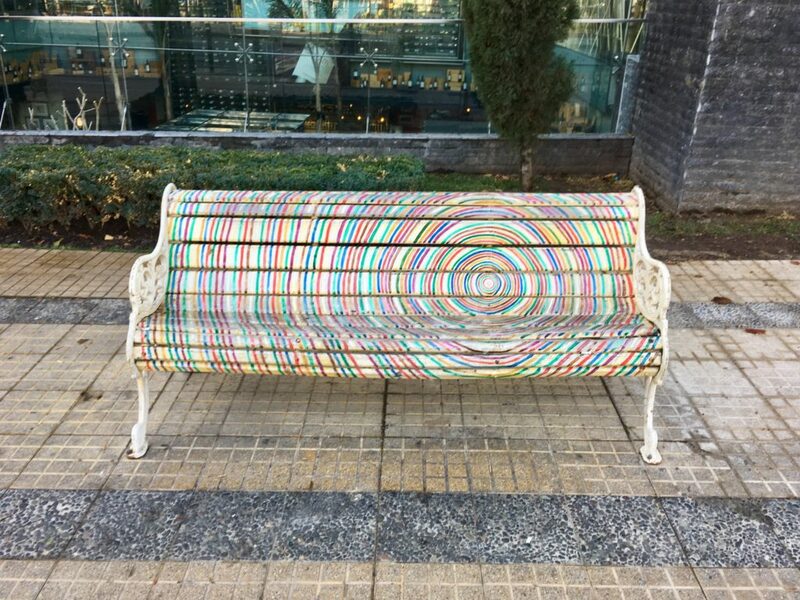 The perfect place to destress after a long taxi ride. 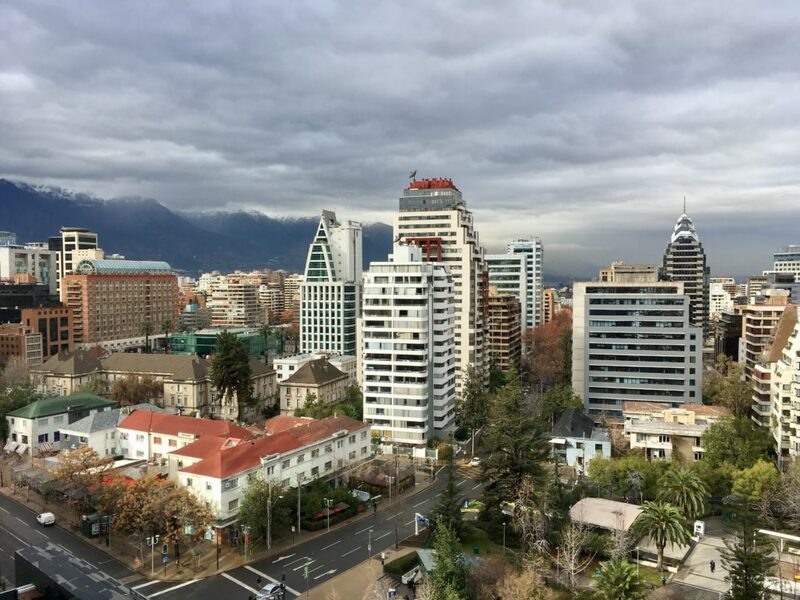 It was a pretty overcast day, so we decided to just take it easy and having a casual day before meeting up with the Free Santiago Walking Tour. 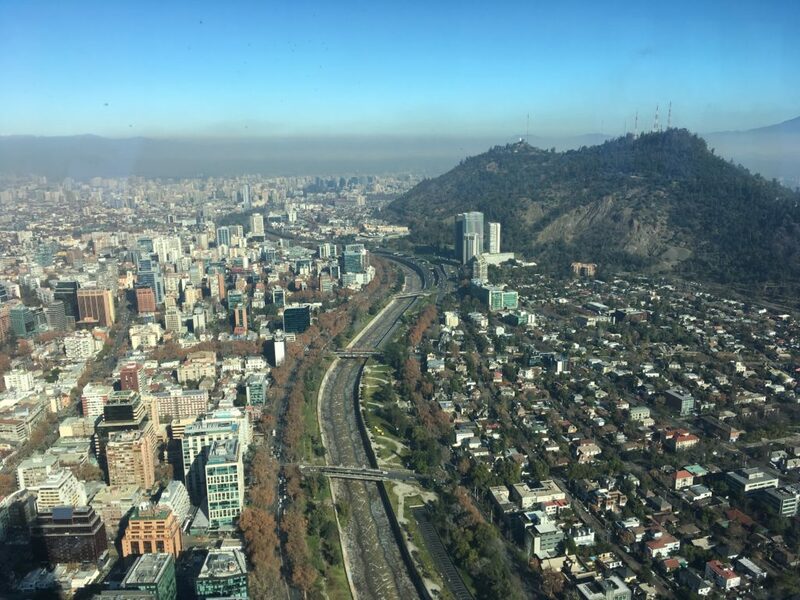 I had done this tour when I was there the previous August and really enjoyed it, but it had also been raining which made it not so fun, and since Phil had never been to Santiago again we decided to go. Not too much to say, but I enjoyed it way more without the rain…and we ended up having the exact same guide which I had had almost a year before! I ended up not taking any pictures, not intentionally, but I think I was just focused on seeing everything I had missed the prior time when I was focused on staying dry and taking pictures. We ended up heading back to the hotel after KrossBar, and grabbed a really quick dinner at Tiramisu again before getting to bed earlyish. We wanted to be up at a reasonable hour to do a bit more sightseeing before we headed to the airport for our flight home. We fortunately had a 4pm checkout, so that would give us time to sleep in a little and still see some things. 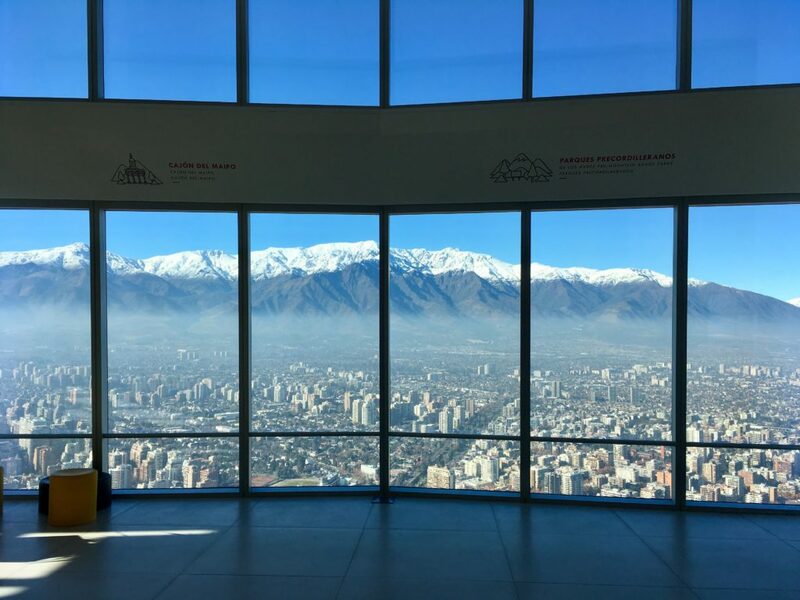 First up was a walk to the SkyCostanera, and a ride up 60+ floors in the escalator to the observation deck. 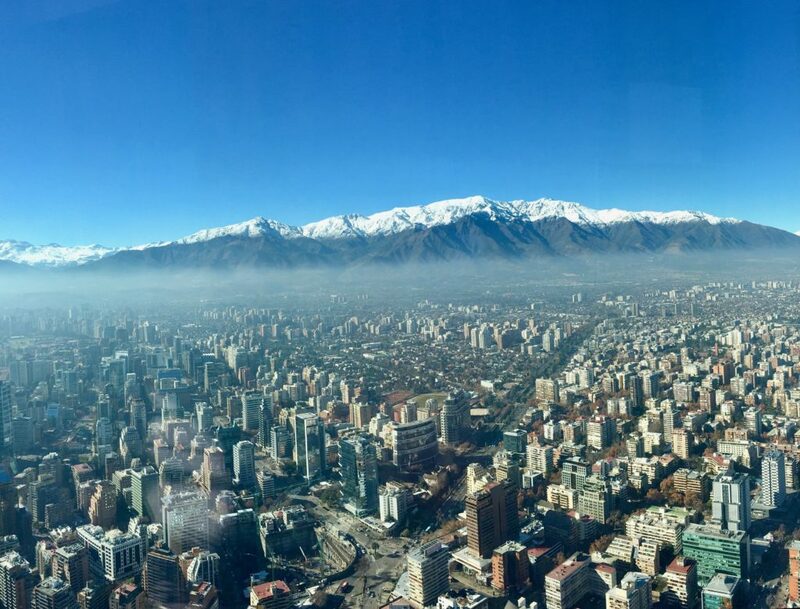 We had one of the supposedly rare crystal clear days in Santiago, and the place was pretty crowded because of it. But look at those views! From the 61st floor you could take an escalator up one more floor to the 62nd floor outdoor observation deck. 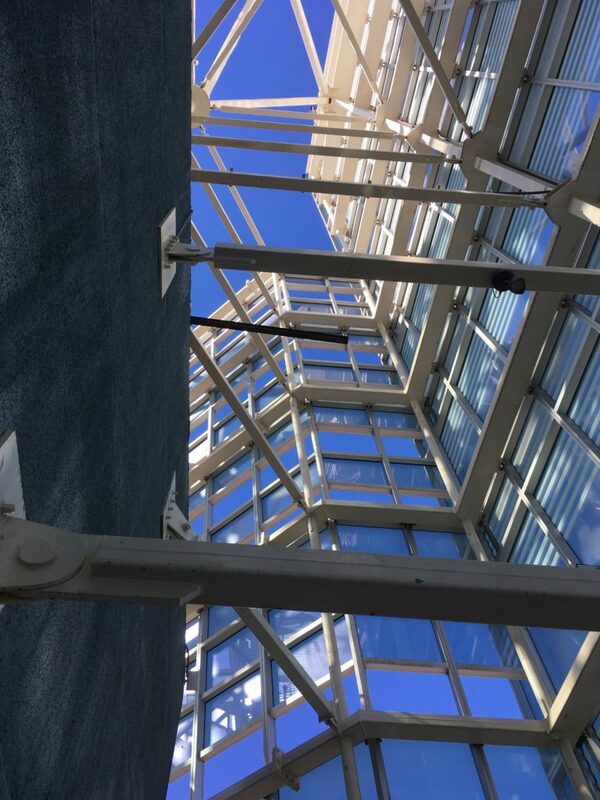 Looking up, nothing but blue sky! In the mall at the bottom was a grocery store, with something I’ve never seen in any other country. 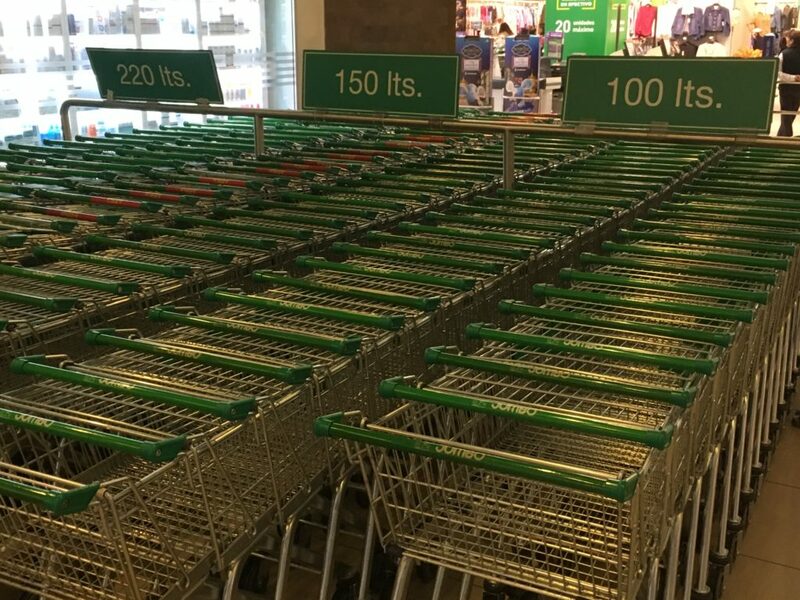 Choose your shopping trolley by volume! 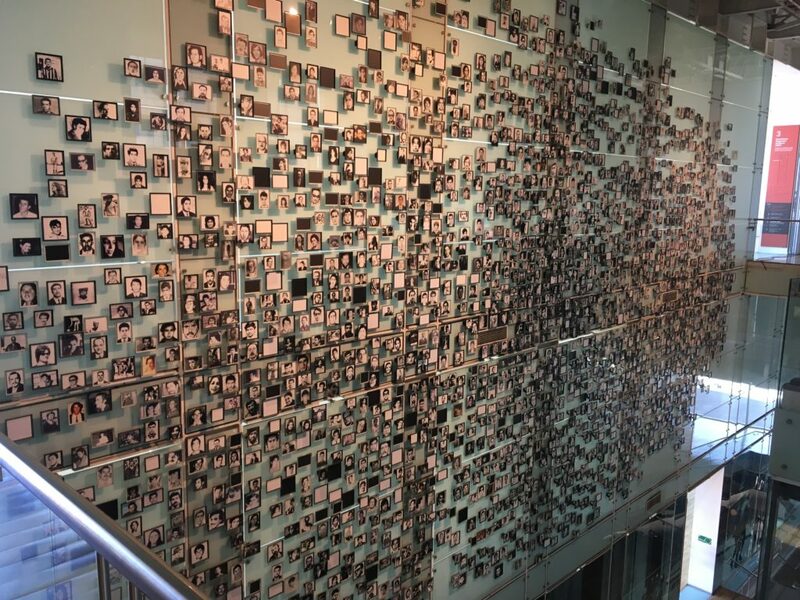 I think the story of the disappeared is one of the earliest political memories I have – thanks to a song by Sting of all people about the mothers who danced alone in the square with pictures of their disappeared loved ones hung around their necks. Out of fear of being arrested themselves for protest, they danced in silence with the photos…which I imagine must have been a terribly powerful sight. 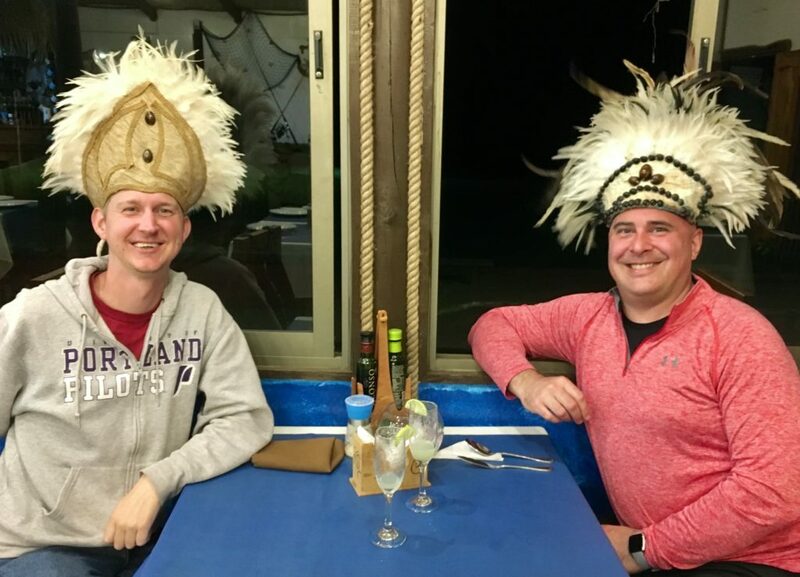 …of course, we couldn’t resist stopping for one last pisco sour, which was by far the strongest and tastiest of the trip…and there might have been a second just to be sure. 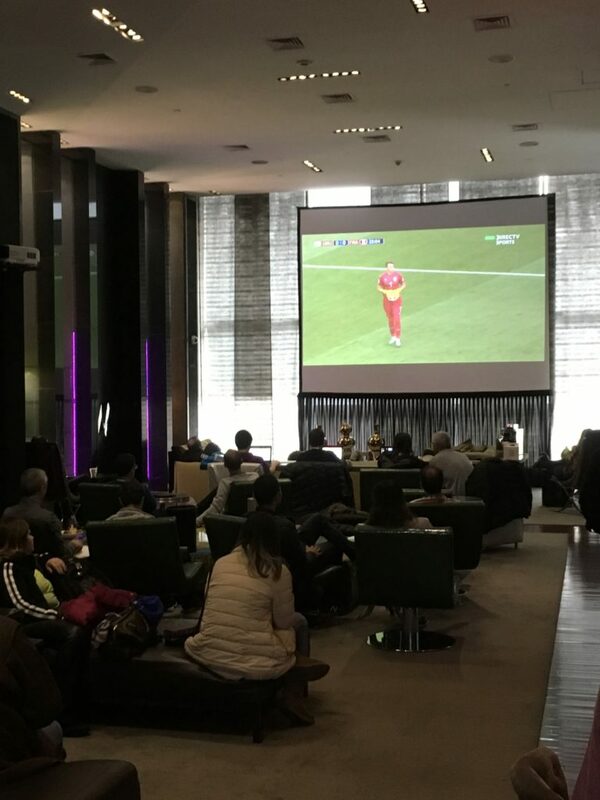 …back to the hotel where the Russia/Croatia game was wrapping up, and a 4pm checkout turned into 5pm…but the W was fantastic about it, and happy to give us the extra hour. Next time, no doubt I’ll be returning here again. Now…off to the airport to begin the long, long trek home! 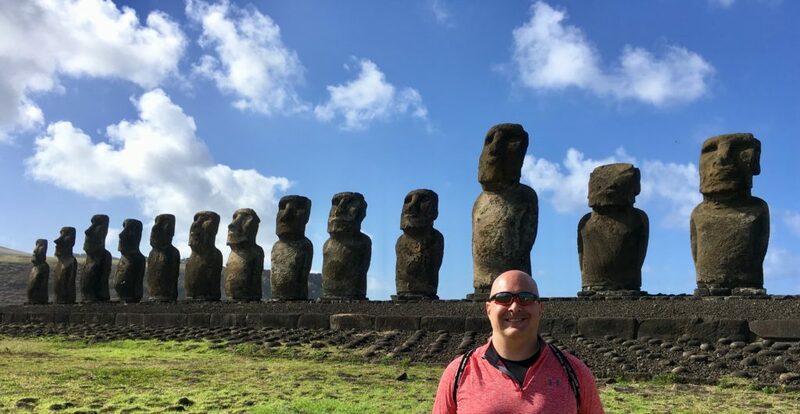 Our last full day on Easter Island, and we were up again for a 9am half day tour. We’d found a rumoured coffeeshop on TripAdvisor that supposedly opened as early as 7am, so decided to stop by on the way to the tour. Polynesian Coffee and Tea turned out not only to be open, but have a super friendly proprietor and brewed a very nice strong double espresso. I would definitely have the energy to power through this tour! Much smaller tour group for the half day tour, only about eight of us, including a couple of people who’d also been on the full day tour before. I made a couple more efforts to engage them in conversation, but it was in vain – they were just completely uninterested. 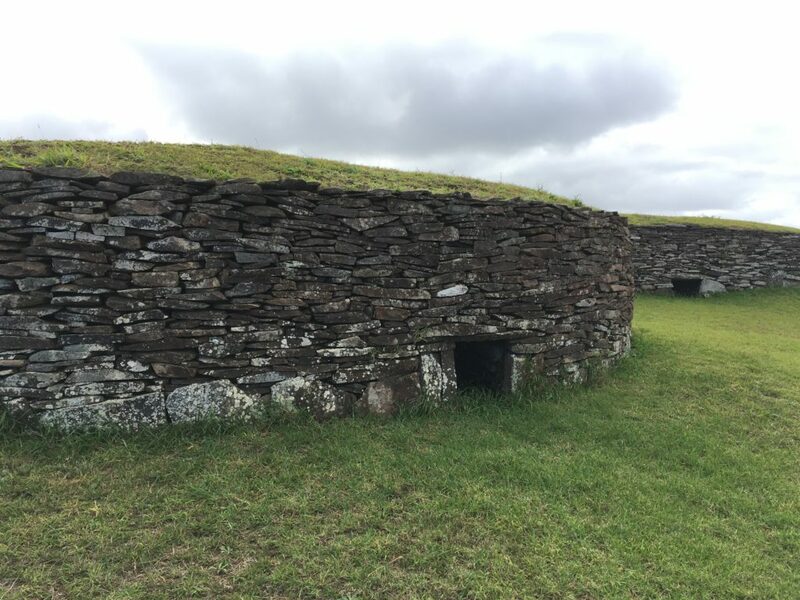 Well, their loss 😉 First stop of the day was on the south side of the island at Ahu Vinapú. 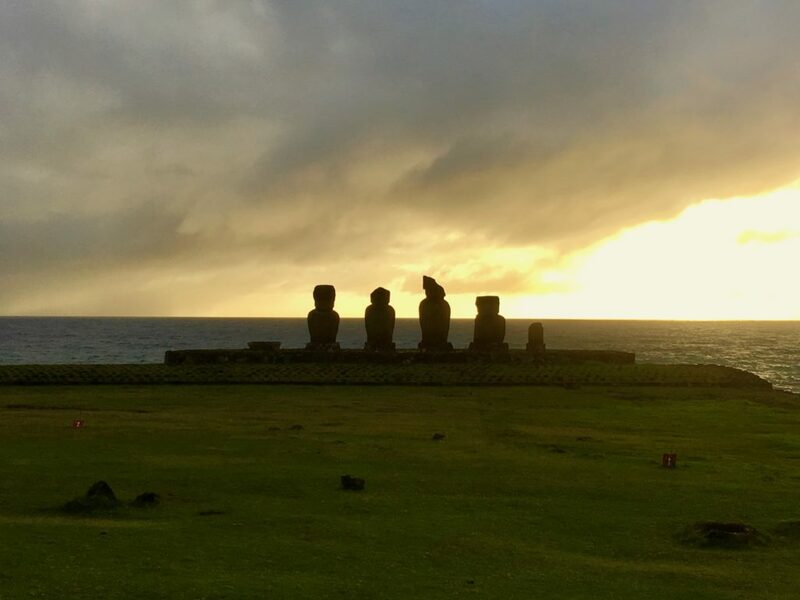 Runs of several moai knocked off a platform…against the ocean. 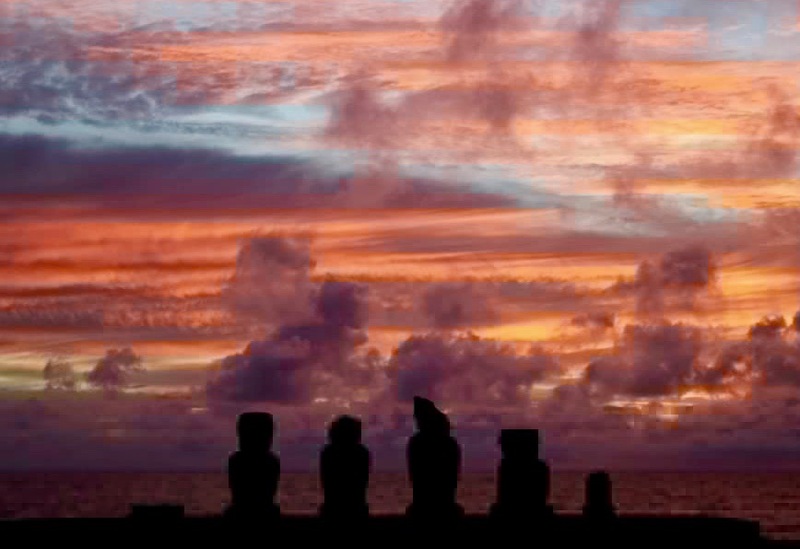 Easter Island sure knows how to make even an amateur photographer look pretty good! 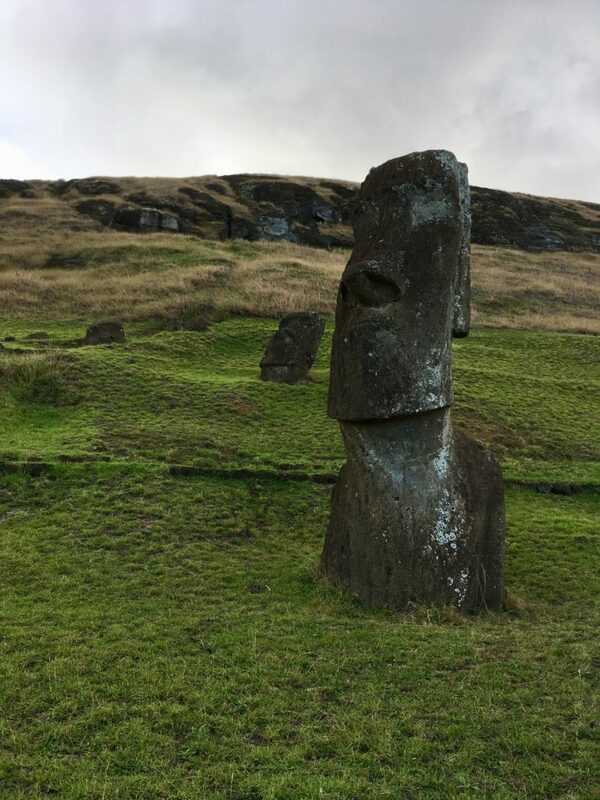 Ruins of the platform, and the head from one of the moai. 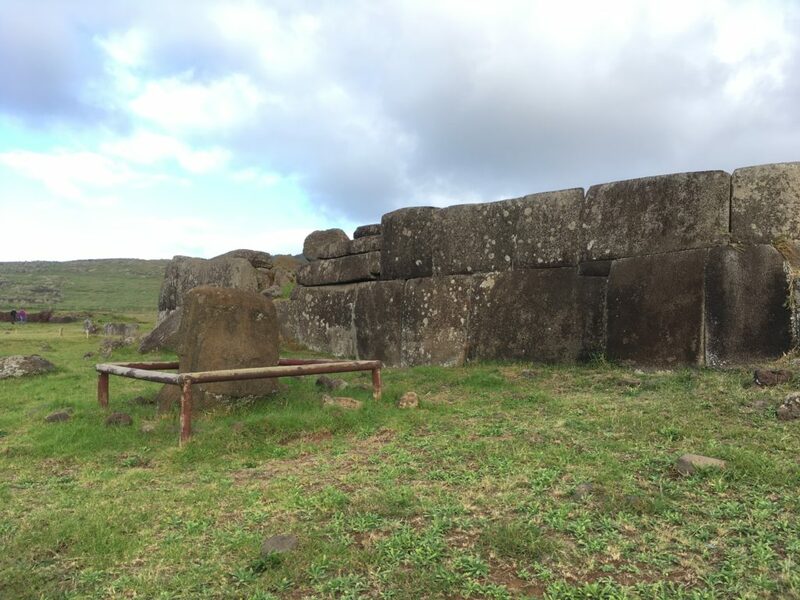 One thing that was different about this site is that the stones on the platform were set absolutely perfectly next to each other with little gap, leaving them to wonder…why. 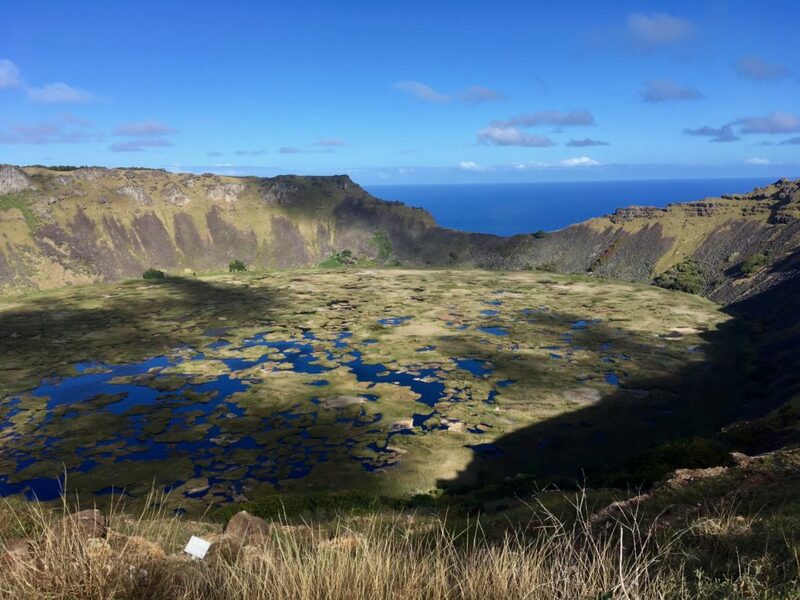 After Ahu Vinapú it was time to drive back up to the crater we hiked the first day. I was really looking forward to this, because it would give us a chance to appreciate it not winded, and in much better light. See what I mean? 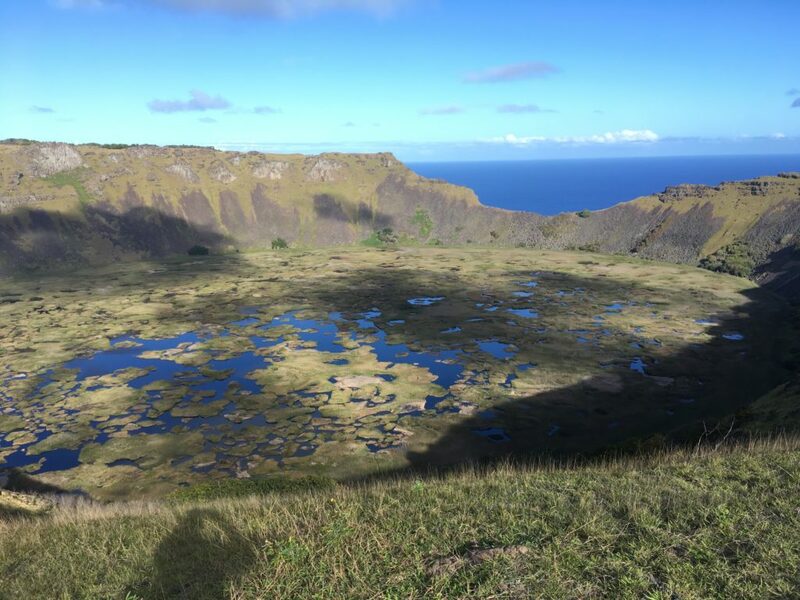 Look at that view down into the crater! First one to bring it successfully back to the main island, their patron (you didn’t think they’d actually get the reward, did you?) 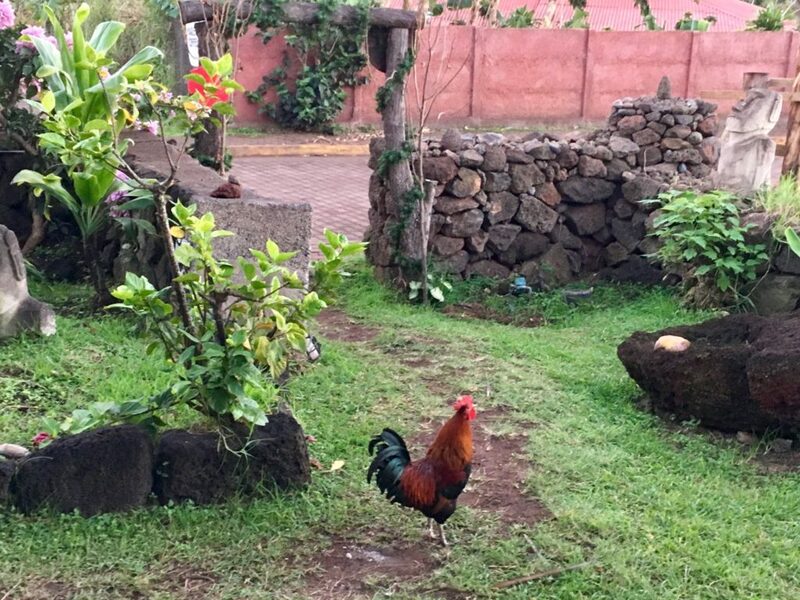 was named the Bird Man for the next year, and basically lived like royalty. Yes, many of them died while attempting it, including falling from the cliffs and being eaten by sharks. 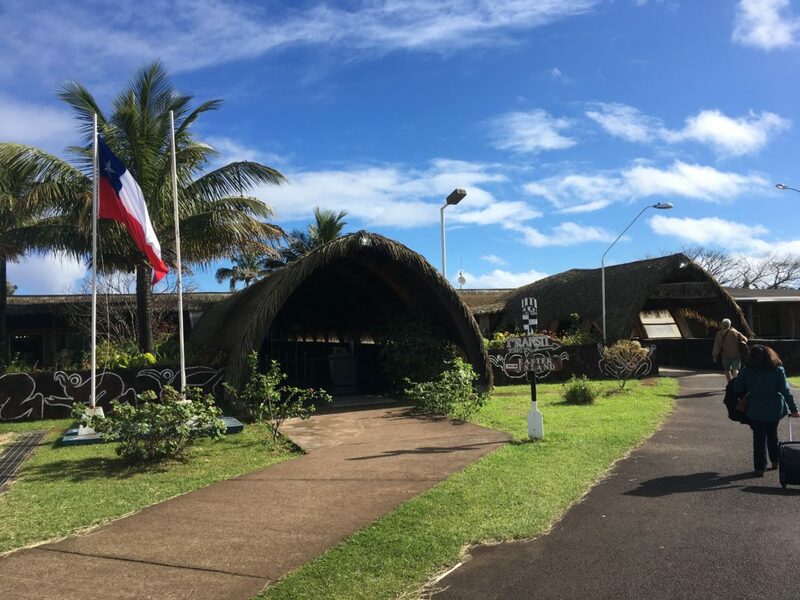 After being dropped off from the tour, we headed across the street and had lunch at what TripAdvisor called the best bargain on Easter Island: a restaurant called “Club Sandwich.” Lots of reviews mentioned they ate here every day because it was such a good bargain. 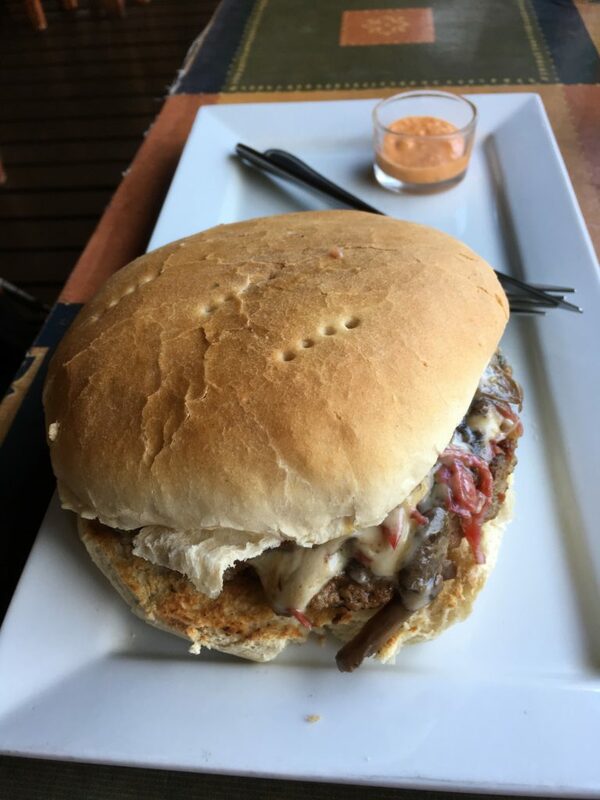 I had the Rapa Nui Burger, which was basically a hamburger with cheese and grilled peppers…sort of like a cheesesteak version of a burger. Delicious, but omg so heavy and filling. 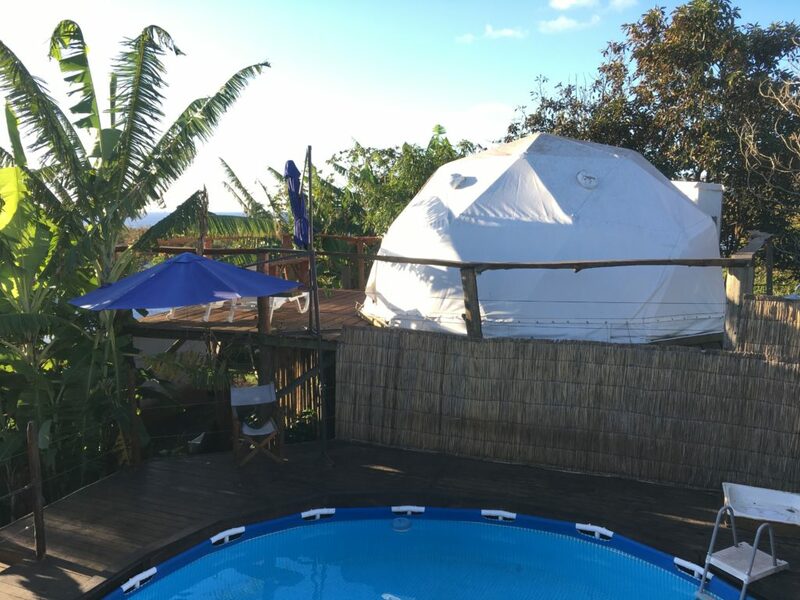 Back to Mama Nui Glamping for a little bit of late afternoon relaxing, and enjoying our geodesic dome one final time. 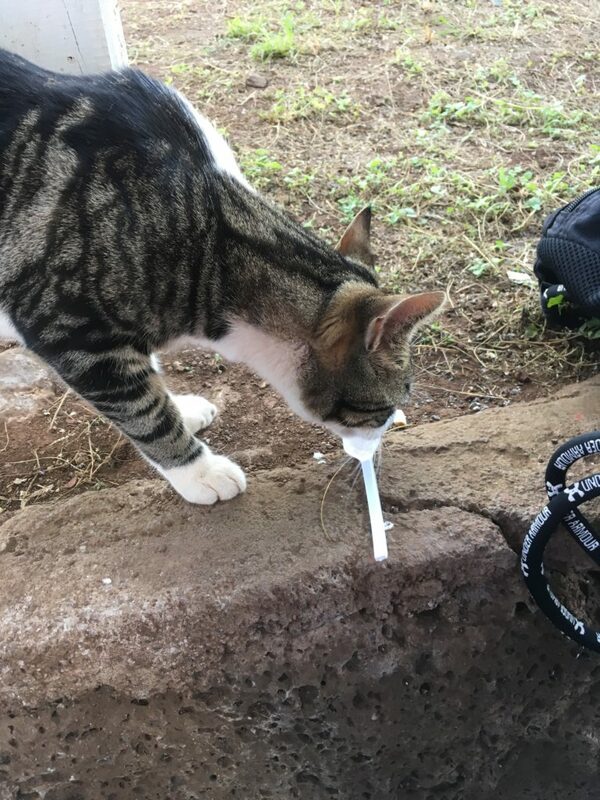 I made a friend who wanted a bit of my ice cream….I was sad I couldn’t take him home! …I’m a sucker for that sad face! 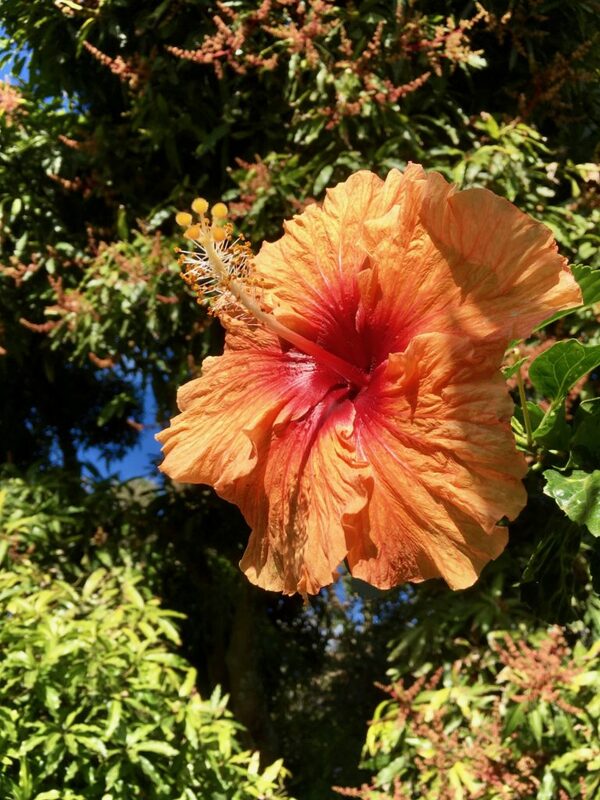 …and Mother Nature cooperated and put on a spectacular show! 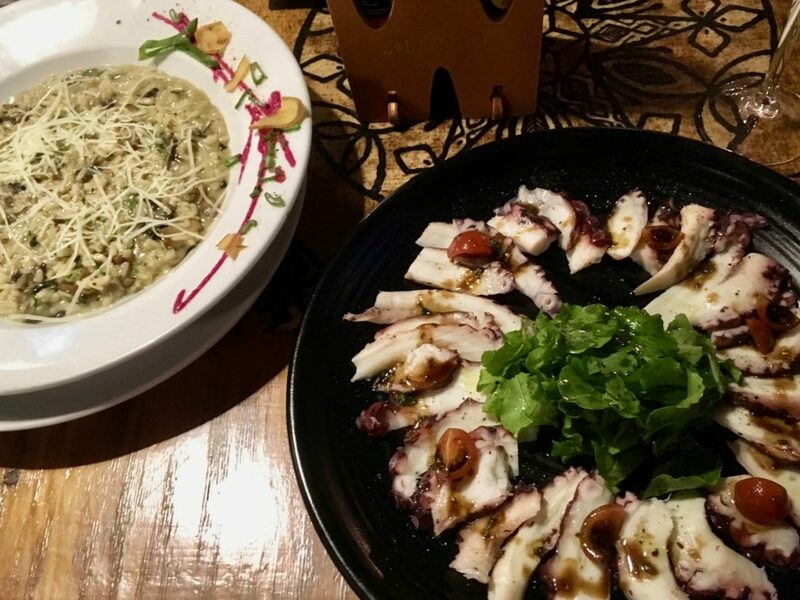 The place we were thinking of eating was hard to find, so we eventually ended up at a different place….which brought me a huge octopus carpacio and bowl of mushroom risotto. Waaaaay too much food today, but delicious! Full and happy, it was back to glamp for one final night before getting ready to fly to Santiago for a few days in a real hotel! With a 9:00am tour, we wanted to get up in plenty of time to get some coffee. Our glamping dome didn’t serve breakfast until 8:30, but was nice enough to pack us some brown bag breakfasts….which contained several rolls and muffins, an apple, several other smaller items….and a can of Marley brand matcha. As someone who doesn’t normally eat breakfast all this fuss was nice, but waaay more food than I’m used to. Another plus to the glamping place: a huge breakfast to start your day off! 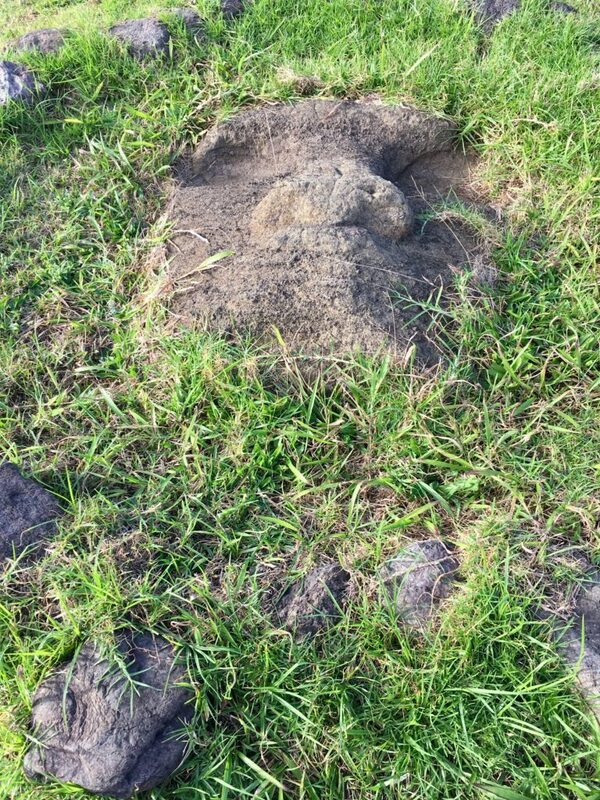 While snacking on it, the offender who tried to wake us up every morning starting around 4am wandered by…. 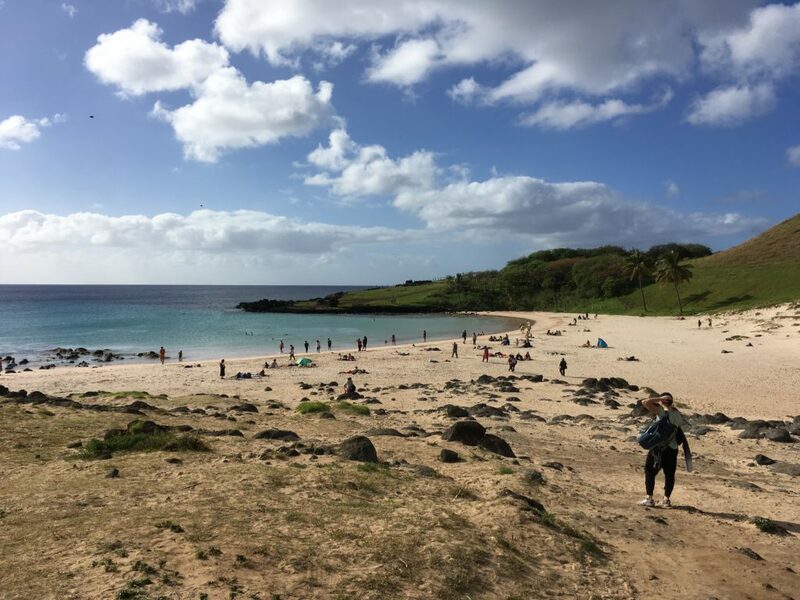 Took the shortish walk to Mahina Tours, where our group was just assembling for the day. We had an actual small bus, and there would be 20 or so of us doing the full day tour. Strange tour group, in that even by the end of the day nobody was the least bit chatty, and meeting other people was quite difficult. 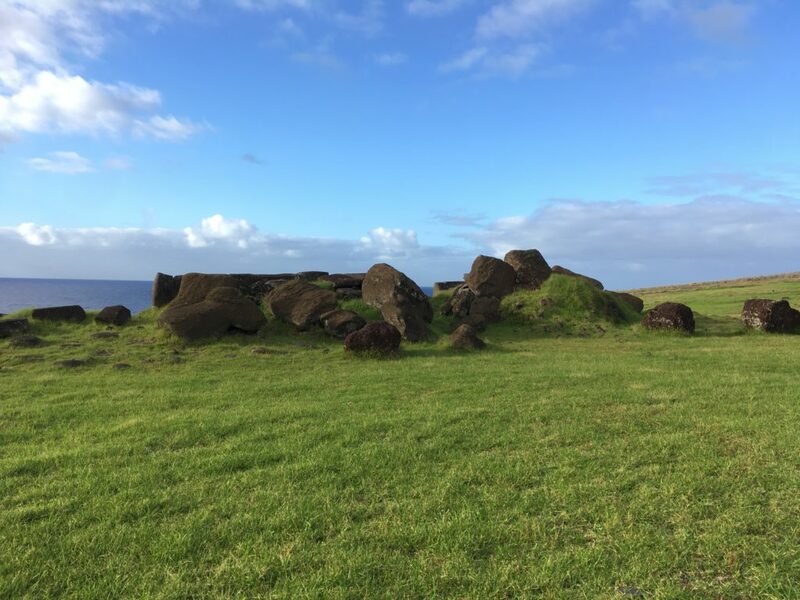 First stop of the day was way off to the other side of the island on the east, Rano Raraku, where the vast majority of moai were carved out of the volcano before being transported to other parts of the island. 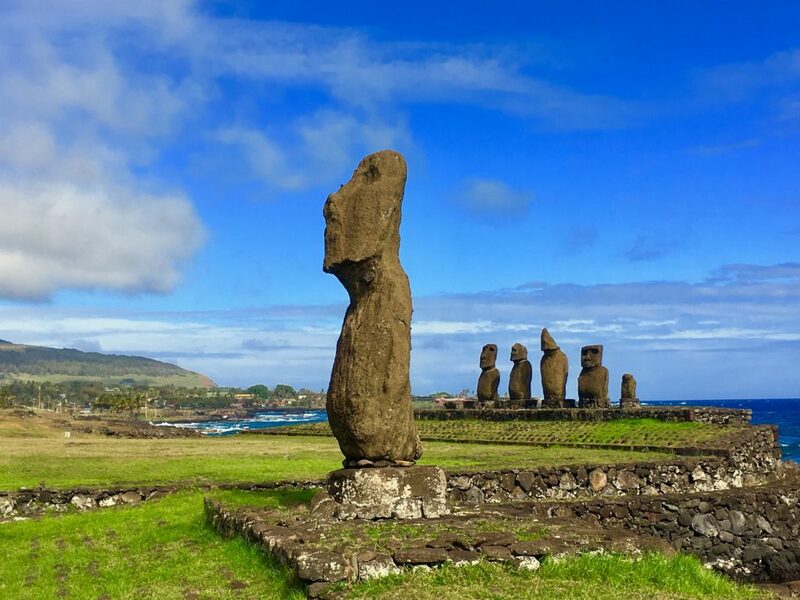 This has been determined by scientists based on their mineral composition being the same as the rock on the volcano, but nobody has any idea how these many ton statues were transported. Personally, I’m buying into the aliens theory. 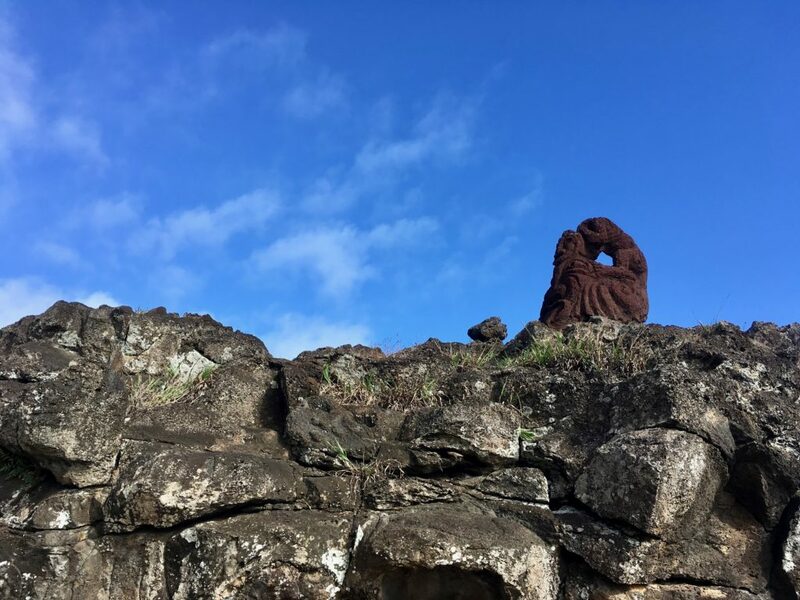 When we got to Rano Raraku, it was off on a guided hike of the moai that were still hanging around the site. 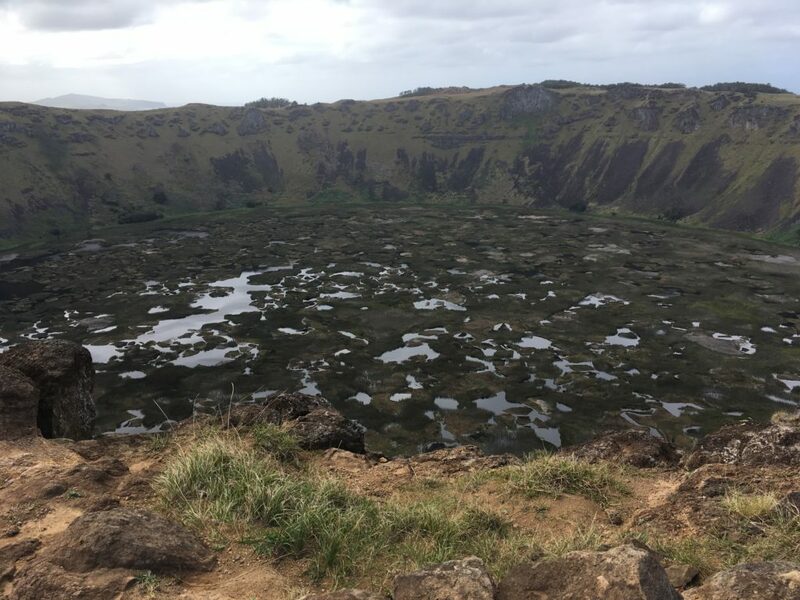 We hiked for about an hour, and our guide for the day gave a really complete explanation in spanish, followed by about 75% of the same information in Spanish. You definitely got a little more out of it if you understood Spanish, but the English part of the tour was great as well. 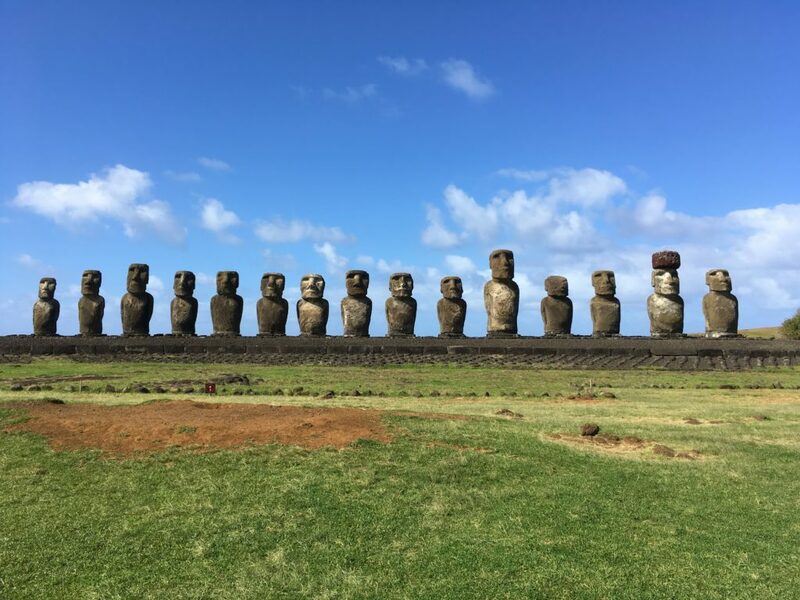 After that it was back in the bus for the short 10 minute ride to the coast, and one of the most impressive lineups of moai on Easter Island: Ahu Tongariki. I really wanted to get a picture with all of them, but despite being there nearly 45 minutes people would go and stand in front for like 10 minutes…and hold long conversations, despite multiple people asking them to move. Every country visited, and I’m still amazed just how many people are so inconsiderate of others. 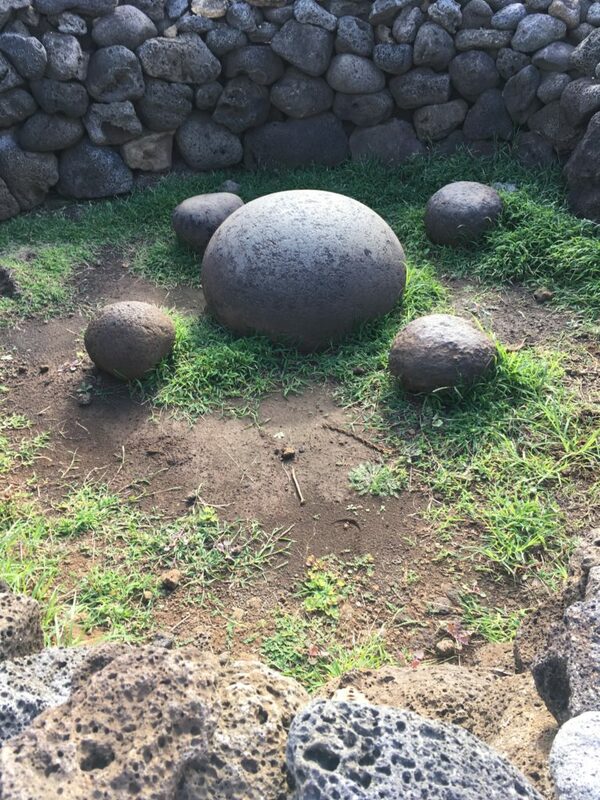 A magnetic rock…don’t ask me…but for some reason they felt it really important to show us. 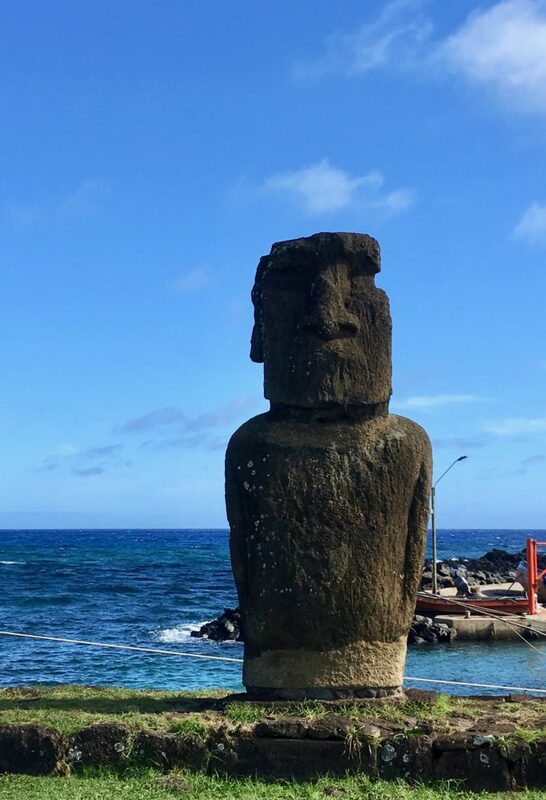 A bit of a let-down after all the moai! The tour was excellent, and since we had no plans the next day we decided to book another half day tour with them the following morning. We hiked back down the beach for sunset, but unfortunately it was super clouded over, so we weren’t able to really get many good pictures. 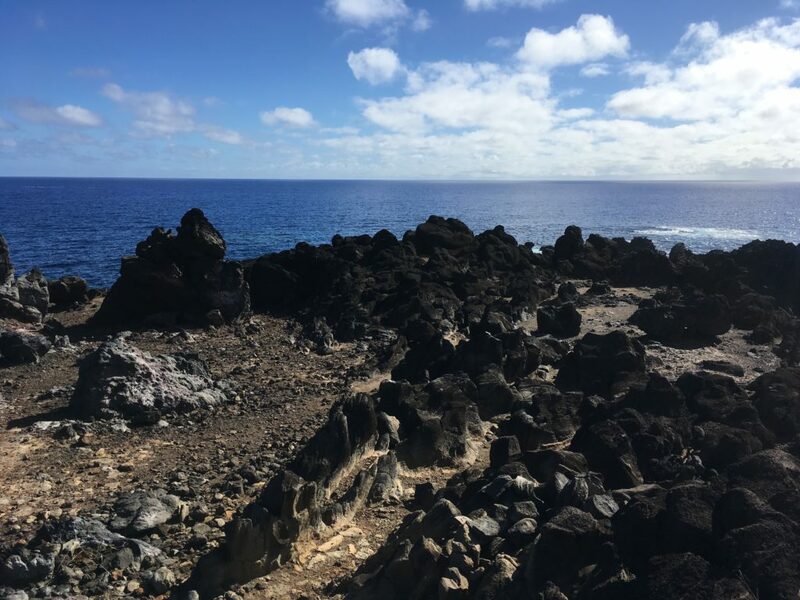 We also hadn’t made dinner plans, so ended up at the highest rated place on TripAdvisor on our walk back: Neptune Island. First, we were a little concerned because the restaurant was empty. Empty as in we were the only people in the huge restaurant the whole two hours we were there. 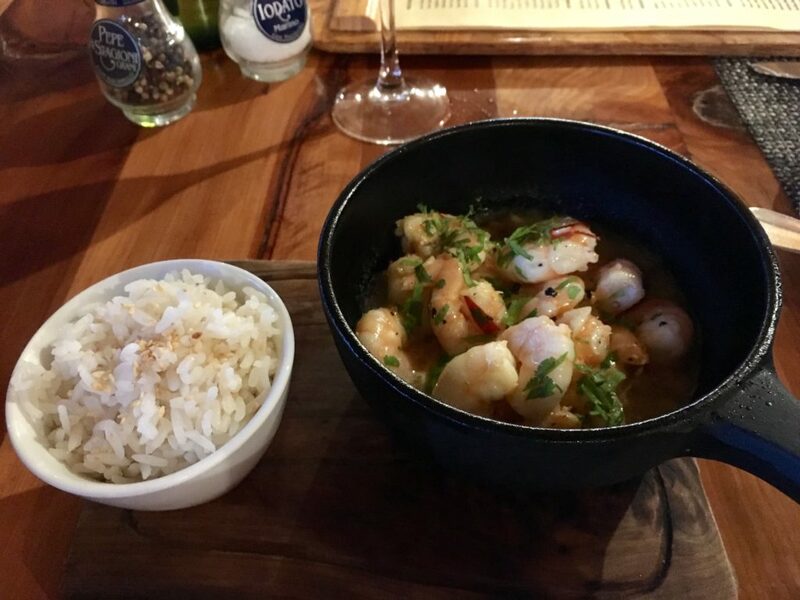 But, the food definitely lived up to its billing. 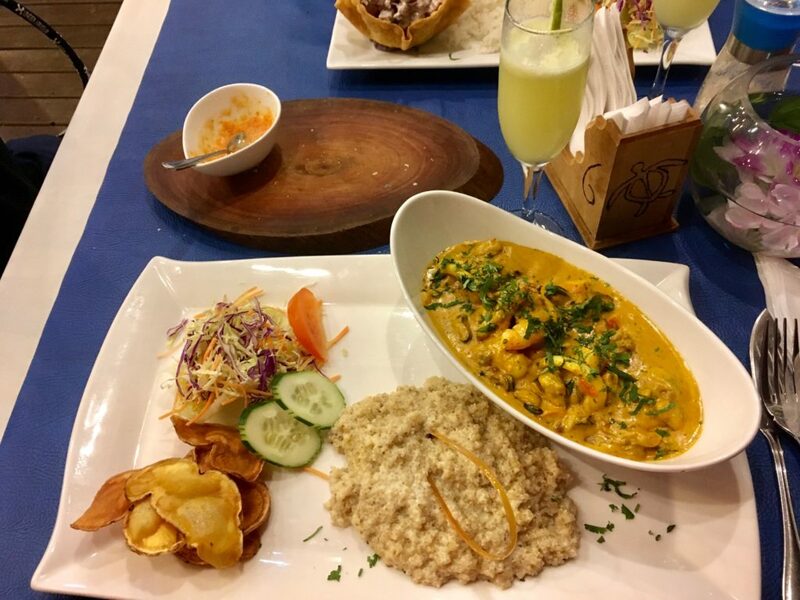 I went with the seafood curry as recommended on TripAdvisor, and it was absolutely amazing…as was the quinoa “risotto.” Both were unique and delicious, and I’m glad we tried it despite breaking the usual rule of don’t eat anywhere that nobody else is! 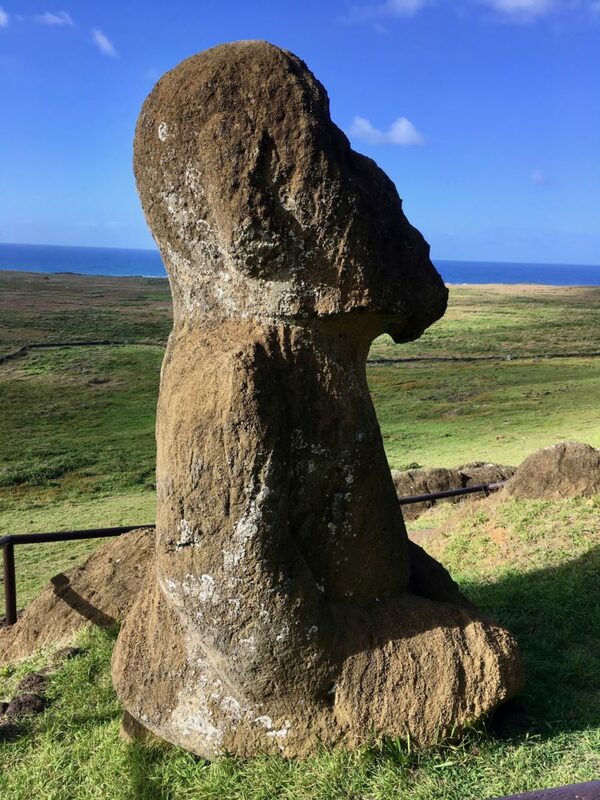 Off to bed…lots of moai and another tour for our last full day the next day! After a wonderful night’s sleep and finally catching up from several short nights in a row (it’s amazing what a night in a geodesic dome can do for you!) we were off to wander around. 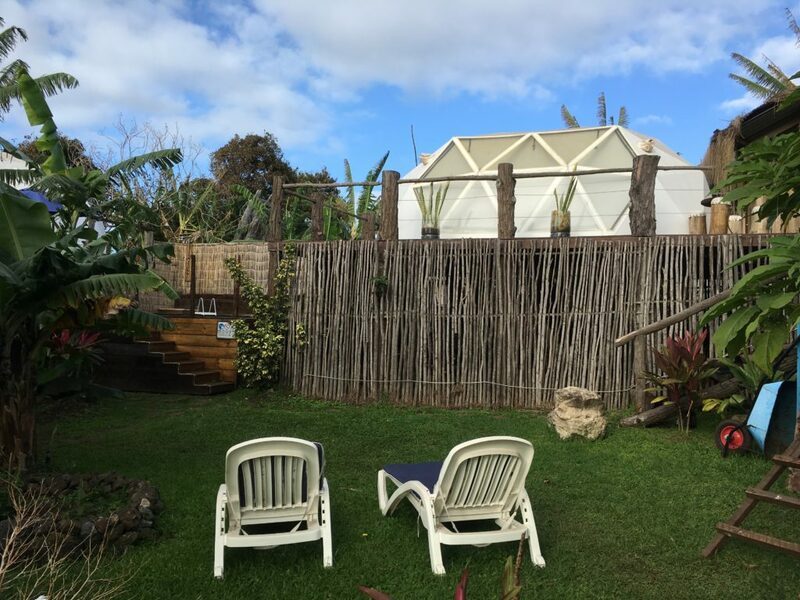 But first…breakfast at Mamma Nui Glamping. Short of buffets, it was one of the most elaborate breakfasts I’ve ever been served at a hotel: a platter of fruit, meats, cheeses, multiple kids of breads, toast, rolls, juice, fried egg…the list goes on and on! More than enough to fuel a day of adventure. 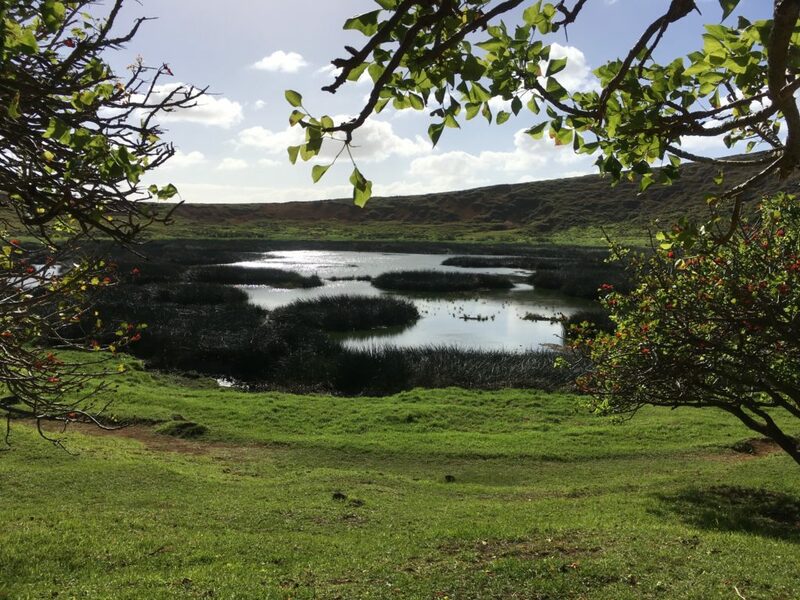 We had decided the next day would be the tours to see most of the island, so today’s plan was to wander around, try and find a tour, and just orient ourselves to things a bit. We hadn’t seen much of the town given we hiked straight out on the first day, so today was really all about exploring. 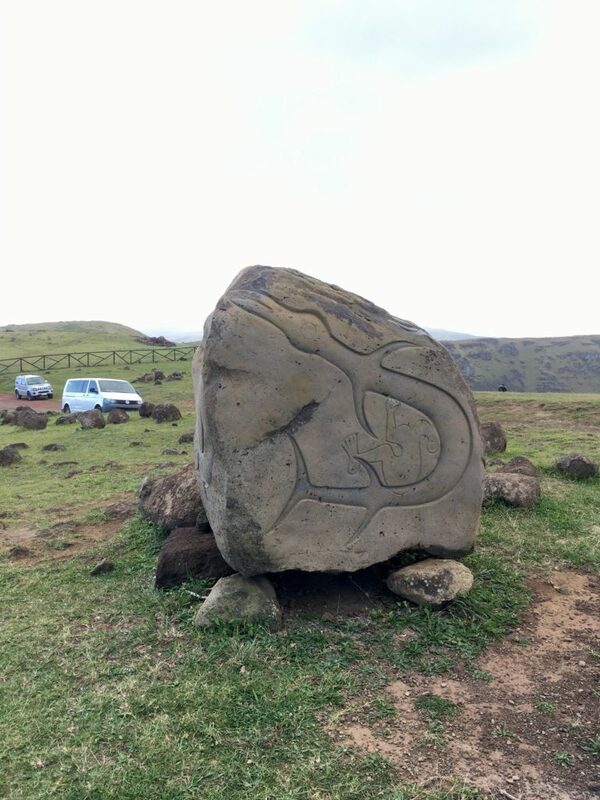 Some more restored sculptures on the northern side of town – you can see just how perfect the weather was! 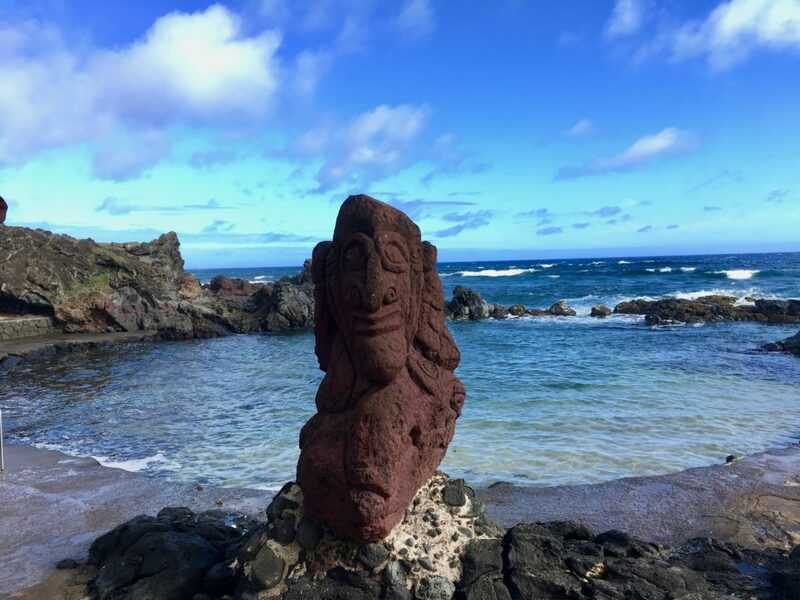 Crystal blue water, clear skies, and sculptures…pretty close to paradise! 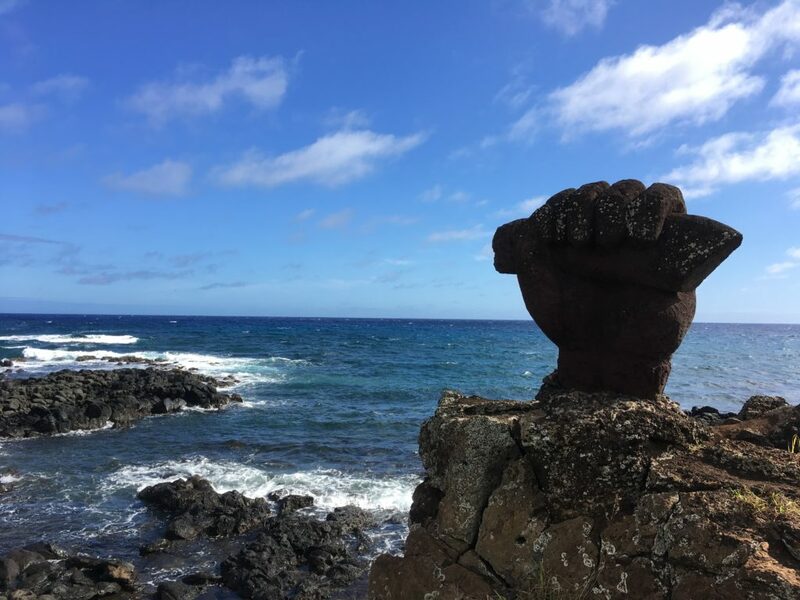 Not sure what this one was supposed to be….a fist gripping something…maybe a fish or weapon? By this point, we’d wandered several miles, and were starting to get hungry. The skies were also beginning to cloud over, so we decided to take refuge and get a small bite to eat. 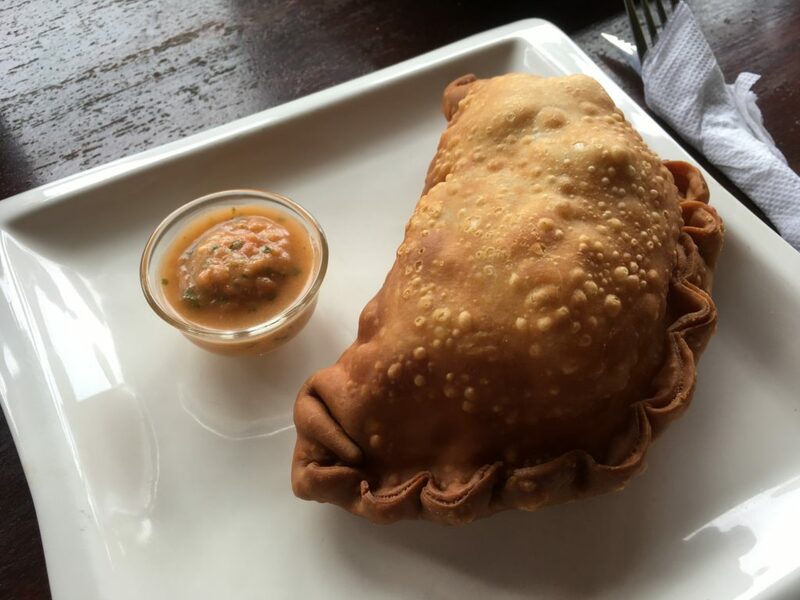 Pisco sours and tuna and cheese empanadas….how can you go wrong?! Just as we sat down, the skies opened up and very heavy rains started. We were sitting across from the local football / rugby field, and had a great view of the rugby practice that continued despite the heavy downpours. Personally, sitting drinking pisco sours, I thought we had the better way to wait out the rain! While having lunch, we attempted to figure out which tour company to go with. 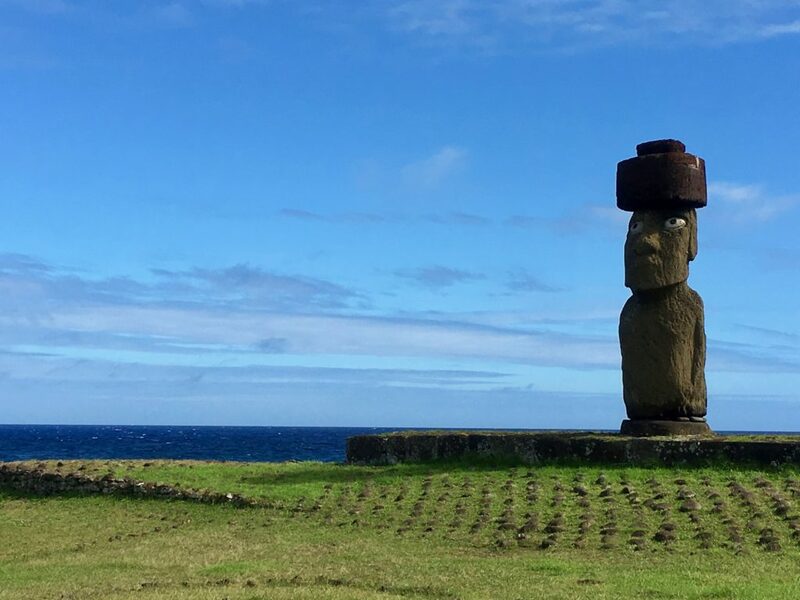 We’d seen great reviews of Easter Island Travel, but their office appeared closed, and when we sent them a message on WhatsApp we got no response. Strange for the highest rated tour company on the island. 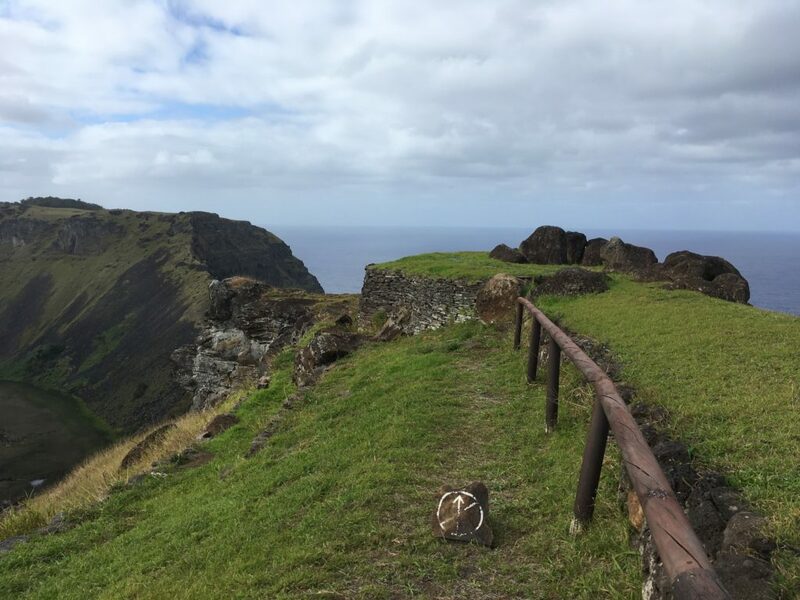 We later found out it was a public holiday – the Feast of Saints Peter and Paul (which we affectionately referred to as the feast of Peter, Paul, and Mary for the rest of the trip) and thus they were closed. 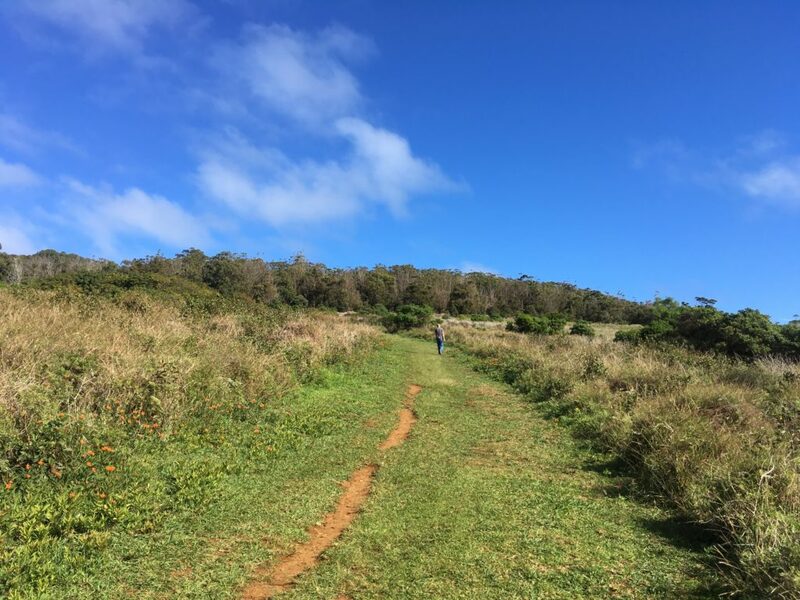 On the walk back, we walked into Mahina Tour which seemed to be doing good business, and had good reviews on TripAdvisor, and offered a full day tour of the main sights…and the price was fantastic…so we booked hoping for good things. It was pretty much a 9-5 tour the next day, but would let us see all the highlights. 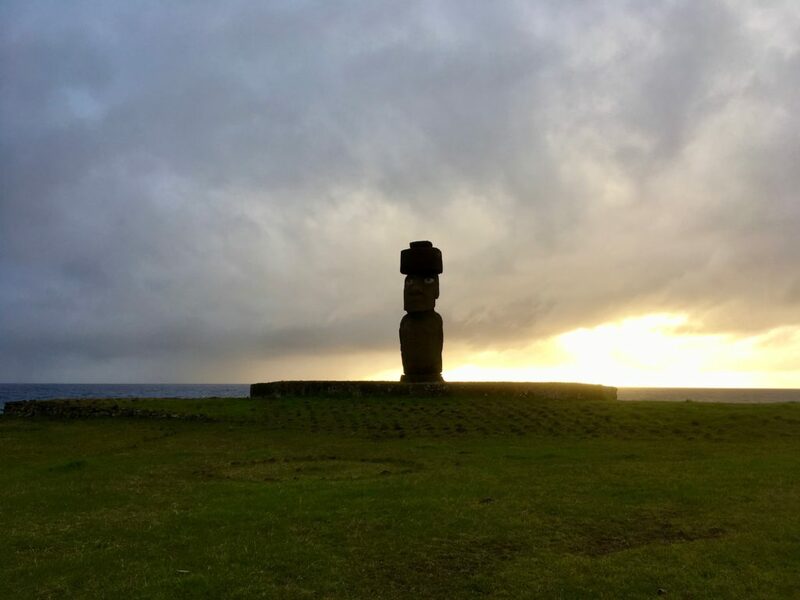 The moai of Ahu Tahai at sunset…unfortunately, it was a little too cloudy to get a great pic. There was also a super tasty desert, but that was consumed so quickly that I didn’t even get a picture of it. 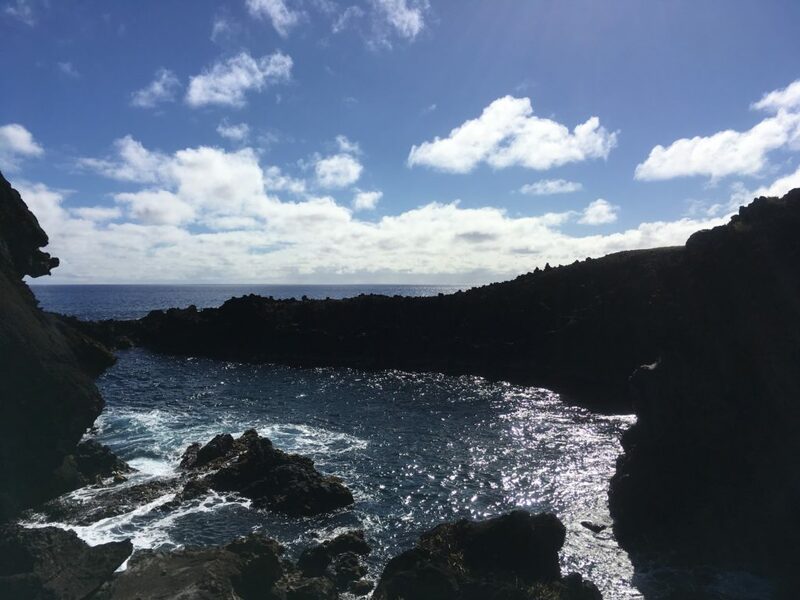 After dinner, we decided to head back to the Mamma Nui and walk off dinner, but there was one small problem: there was no light pollution at all on the island, and it was pitch black and we couldn’t see where we were going – even using iPhones as flashlights. After just a couple of minutes we decided to admit defeat and went back to the restaurant to have them call a taxi for us. It was probably only 1.5 miles or so back to Mamma Nui, and fortunately (unlike almost everything else) the price was extremely reasonable. 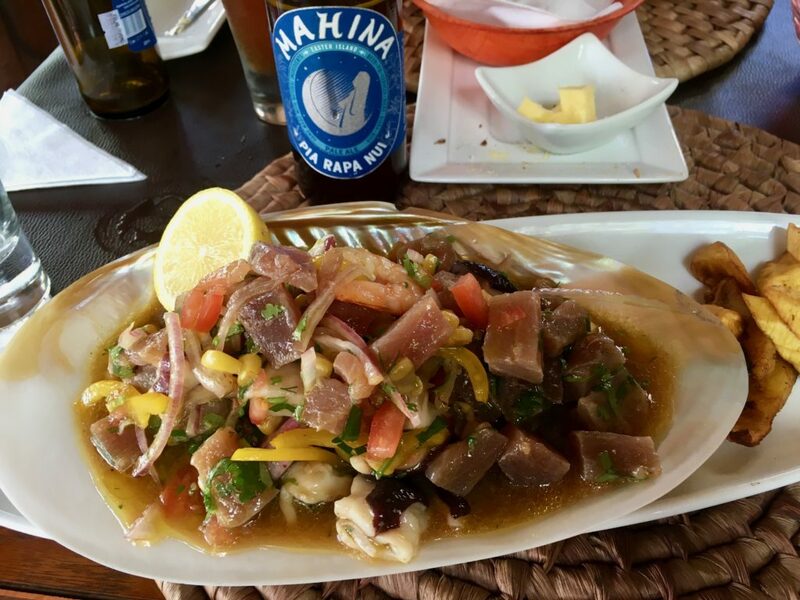 Bit of wine back at Mamma Nui’s restaurant, and off to bed – we had a full day of touring planned! Alarm went off way too early, but fortunately check-out was nice and easy, and despite the dubious legality of Uber in Chile our Uber showed up in two minutes and we were off to the airport. A fun fact that we discovered about Chile, which I think I’d previously since forgotten: if you allow hotels to bill your credit card in US Dollars instead of Pesos you don’t have to pay the approximately 15% VAT on lodging – a pretty sweet deal – especially since they bill in actual US Dollars quoted and not some horrid Dollars to Pesos back to Dollars exchange rate that lots of hotels try and pull. I’m pretty sure this only applies to foreign tourists, but still a nice benefit! 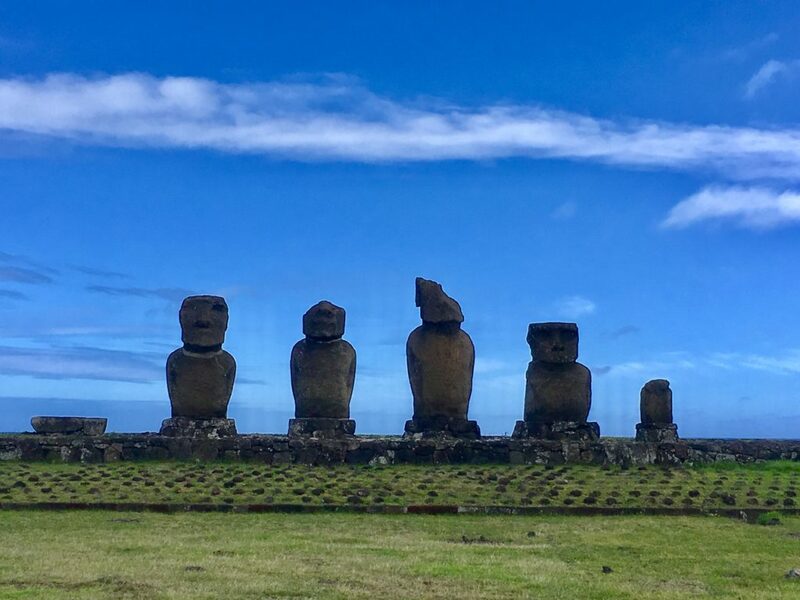 Got to Santiago Airport in under 30 minutes, and then were faced with an interesting question: is Easter Island from the domestic terminal or international? We couldn’t find a flight board to verify (nor a gate!) so decided to head to domestic security. 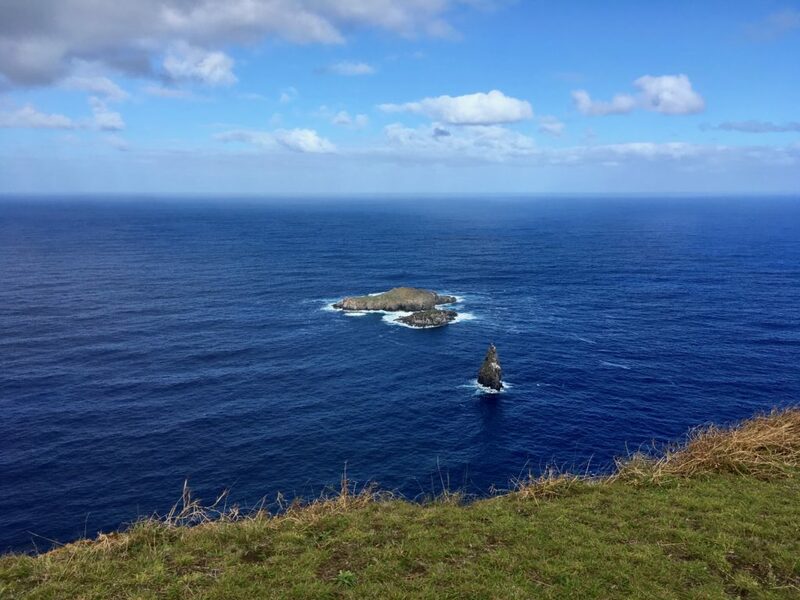 Lots of these far-flung island parts of countries can be considered international for customs/immigration purposes, so you can never be sure. 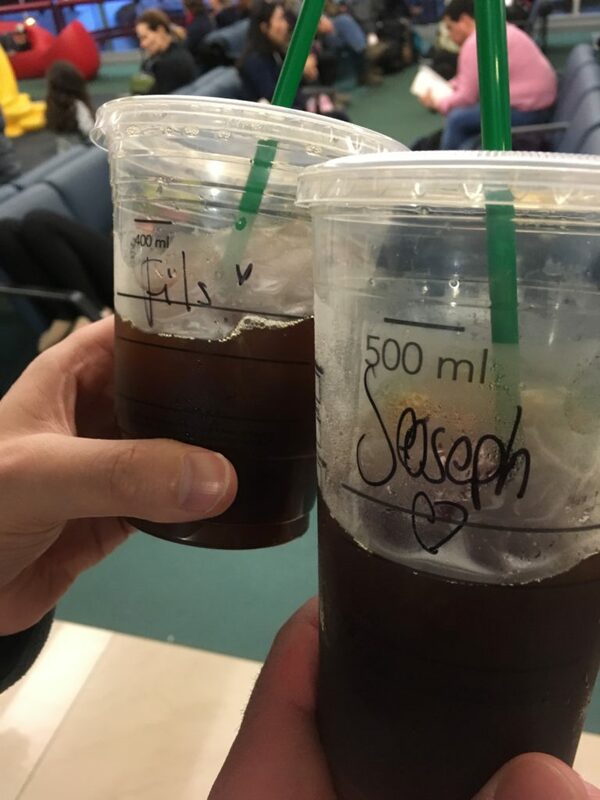 Fortunately, we were right, and right past security was Starbucks. 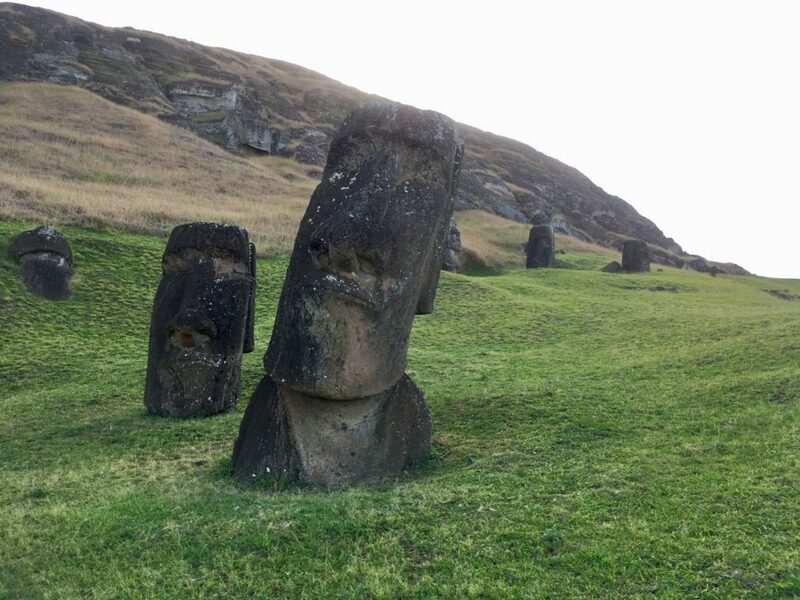 Looks like Fils and Joseph are off to Easter Island! 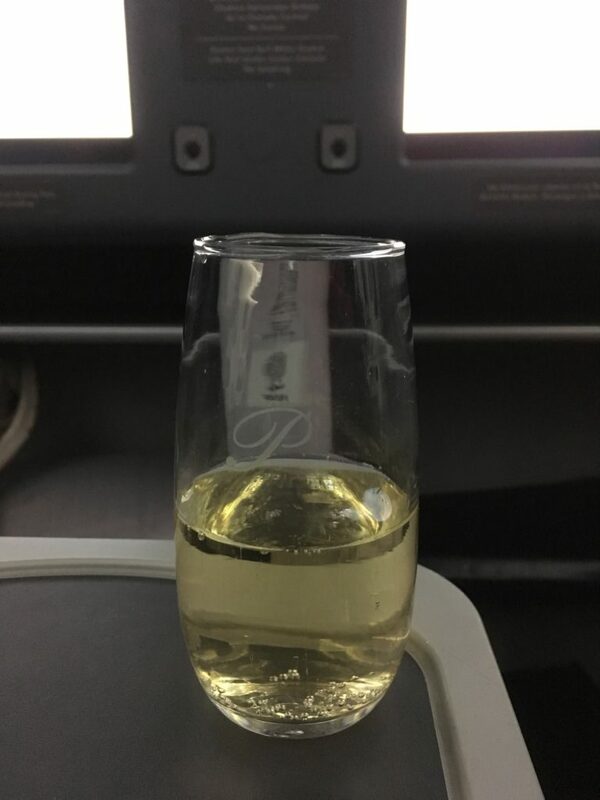 Flight was completely full in business class and about 80% in economy, but unlike Aeromexico there was nobody at all in the premium line, so we were able to be the first on board. 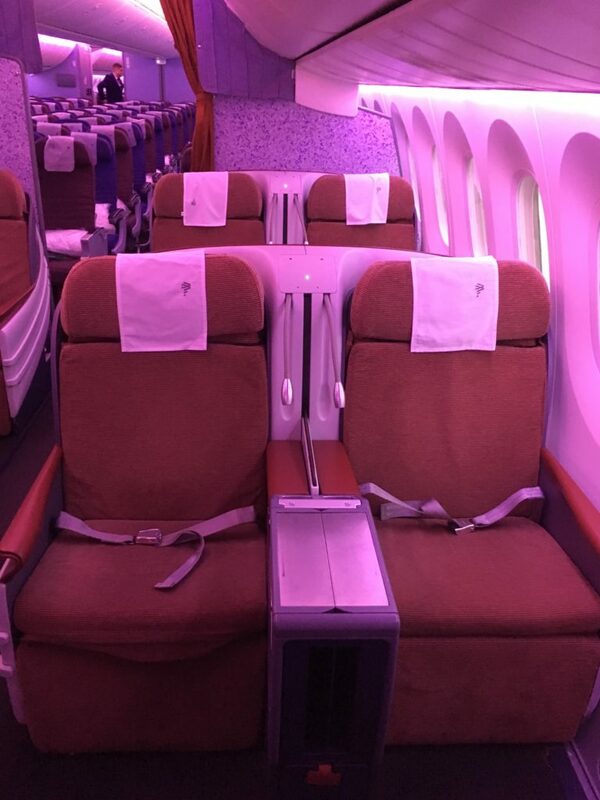 I am definitely not a fan of 2-2-2 seating and having to climb over people, but I did love how open the cabin felt. 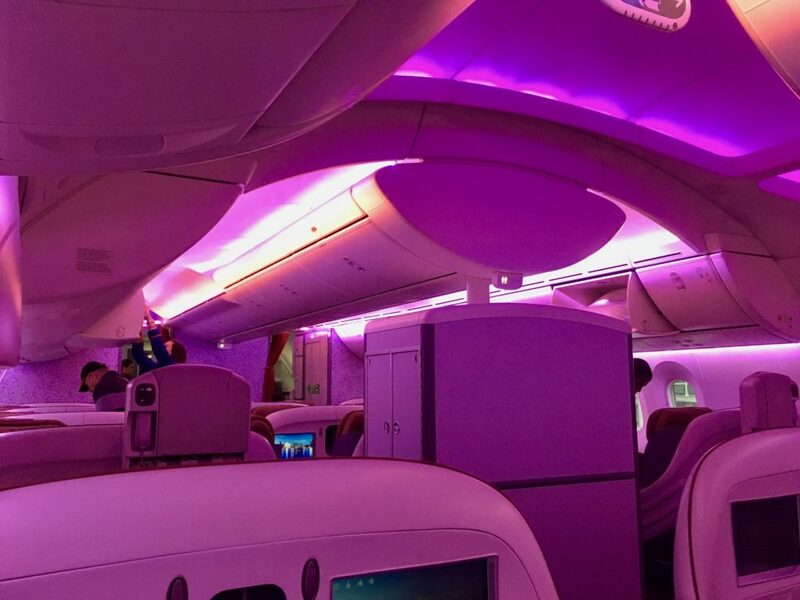 I might not have felt the same way on a nighttime flight, but for this daytime flight it was a really spacious feeling…or maybe that’s just the mood lighting…. 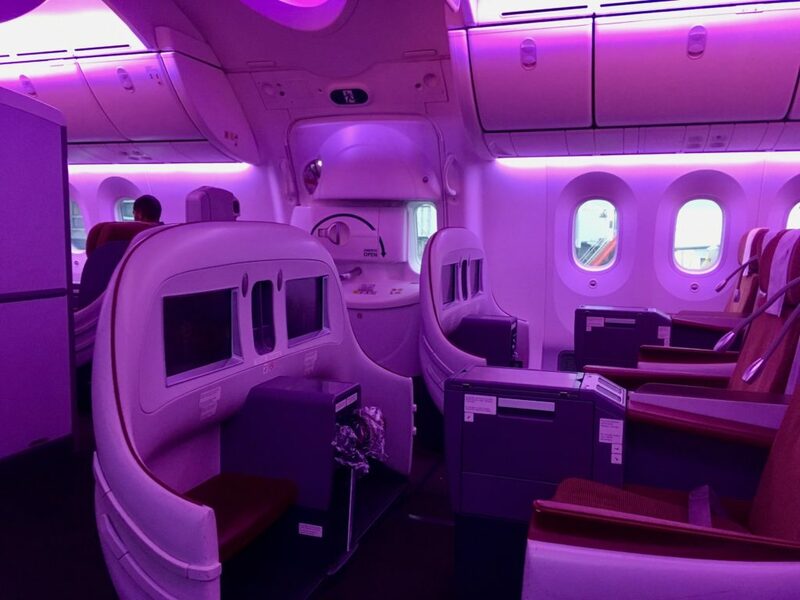 Another cabin view because…either I’m obsessed with the mood lighting, or I was impressed how roomy it felt. I never take this many cabin pics, so you can decide for yourselves. 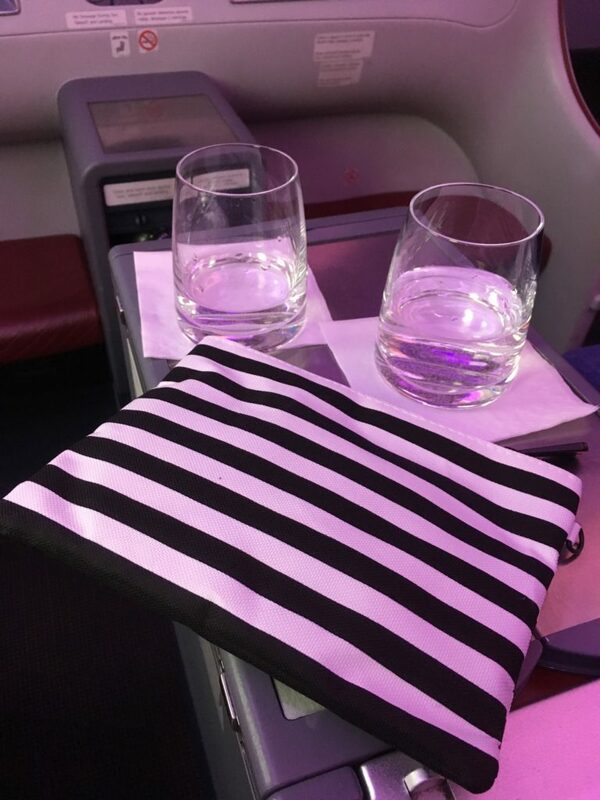 Pre-departure drinks consisted of water or orange juice, and a tiny amenity kit. Had the only thing I really wanted for a daytime flight (socks) so I was happy enough with it. Honestly on a flight this short I don’t expect an amenity kit during the day anyways. 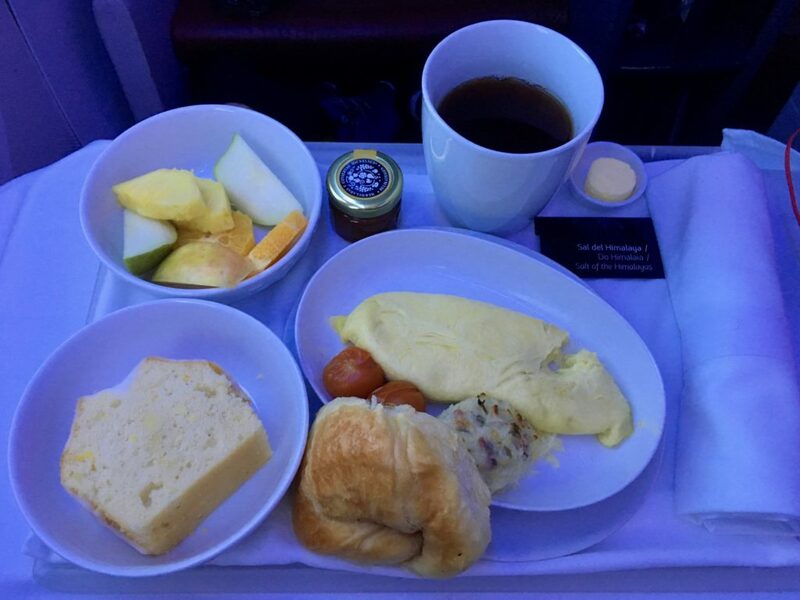 Breakfast was a rather uninspired omelette, some tasty, but meagre fruit (though I can’t remember the last time that I was given pear on a plane) and plenty of carbs to go along with it. The frosted lemon cake was delicious, and while I took the croissant for science, I’m happy to report it was properly buttery and flakey, and entirely consumed with a little marmalade. 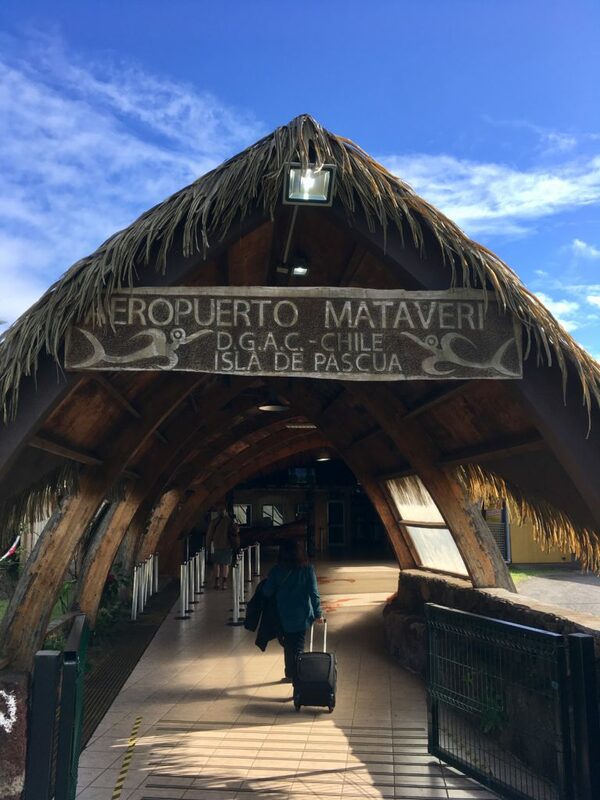 Thatched roof and all…we’re definitely in the South Pacific! 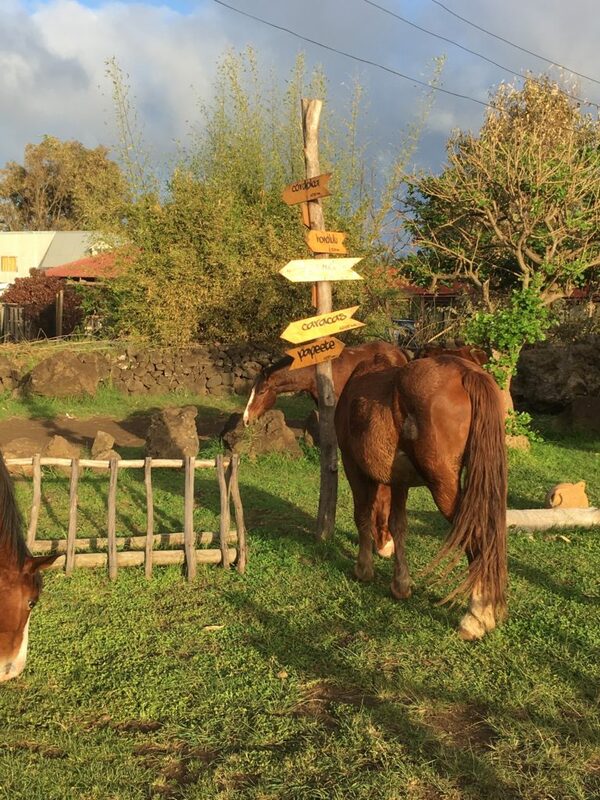 After purchasing our national park permits at the airport (available with US$, Chilean Pesos, or by credit card) it was out to the parking lot to wait for our driver. 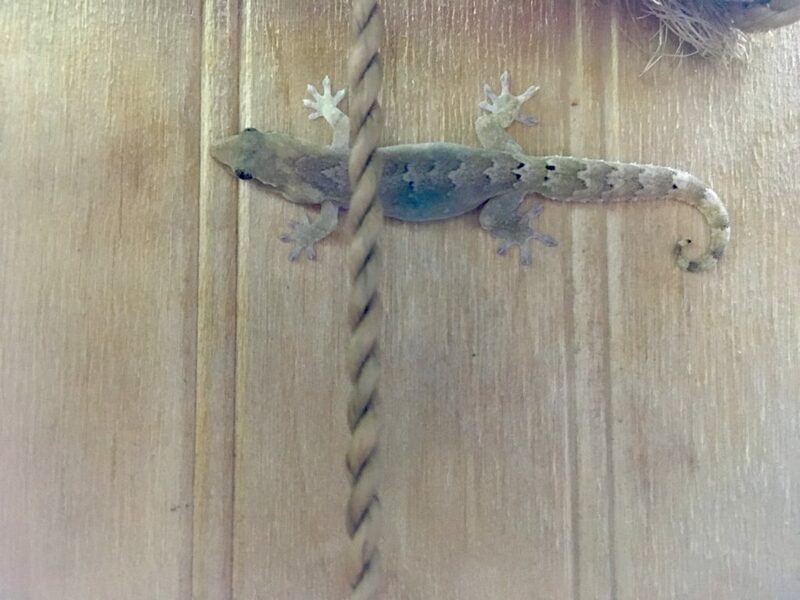 We were getting a little nervous when we didn’t initially see the sign, but right on Island Time we spotted him and we were off in the pickup truck to Mamma Nui Glamping. So, as anyone who’s read my reports for any length of time knows, I can be a bit of a princess and I like my accommodations comfortable. 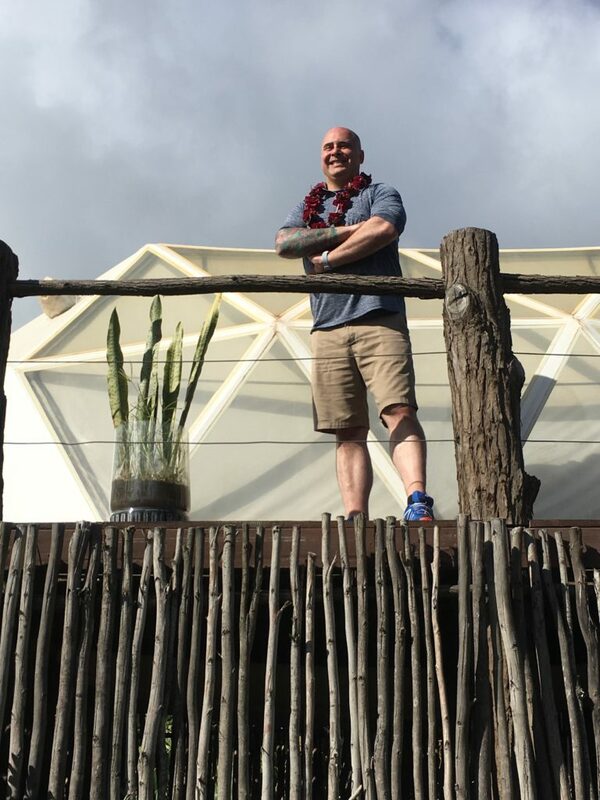 There was one high-end option on the island, but the price was insane and the location didn’t look great…so when I spotted the opportunity to sleep in a geodesic dome, well, I ran with it. This wasn’t for one night either, it was for a whole four nights! 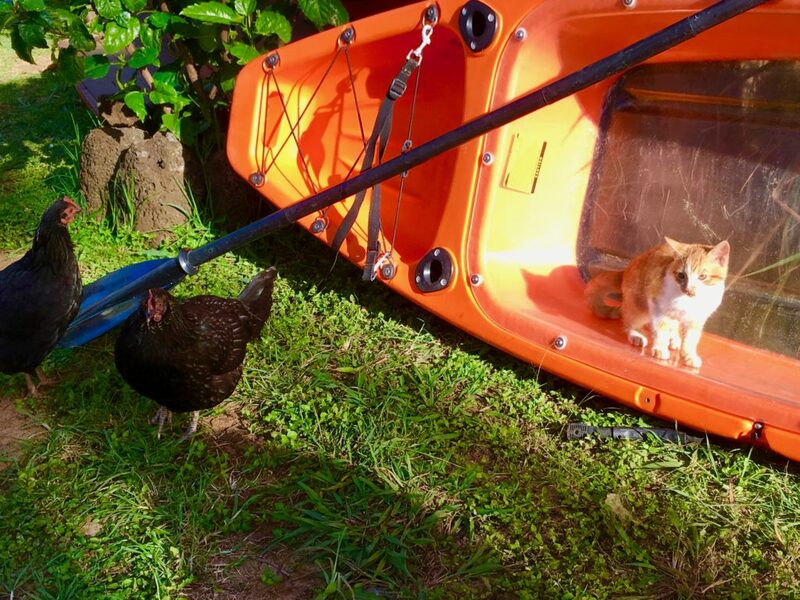 This was either going to be an adventure that I loved…or hated. Unfortunately, the cave art was closed because, well, the cave had apparently been collapsing over the previous months and was no longer safe to be inside. Oh well, it was a short detour, and rewarded with great views of the coast. 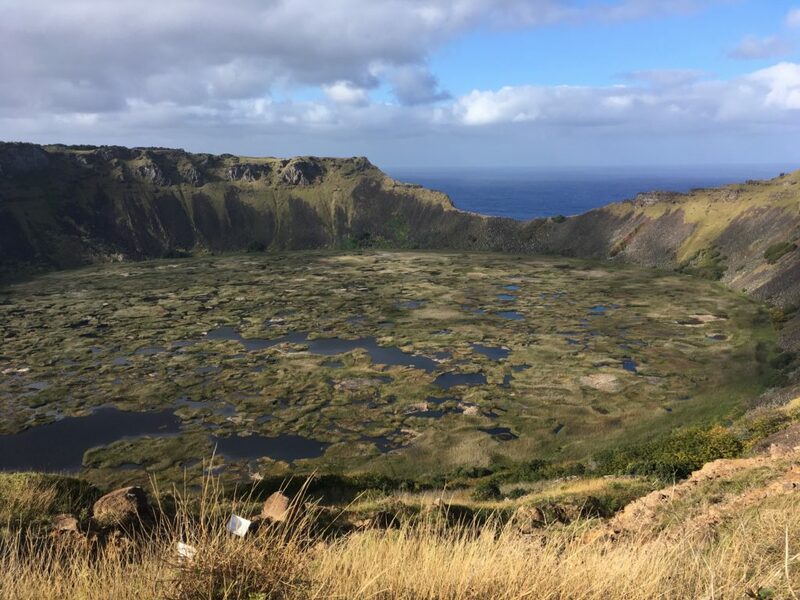 We knew that continuing the hike would take us to the old village of Orongo, but it wasn’t entirely clear how to get there…and we were pretty tired and jetlagged by this point so after a rest headed back down the volcano. Going down still took a while, but was so much easier than going up. 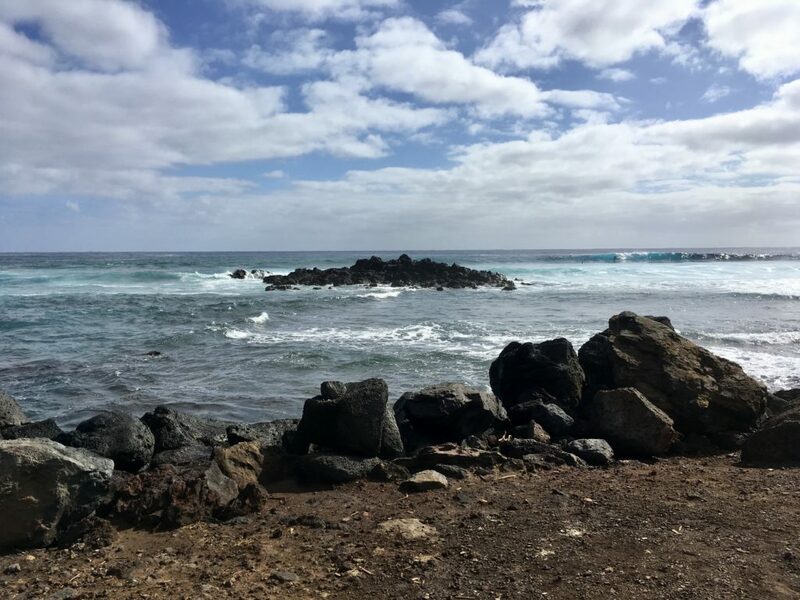 Great way to spend the first afternoon, and an even better way to get some exercise and walk off all the airplane food! Unfortunately, despite the outside temperature being around 22 degrees celcius, the temperature inside the dome from the direct sun hitting it was well over 30. 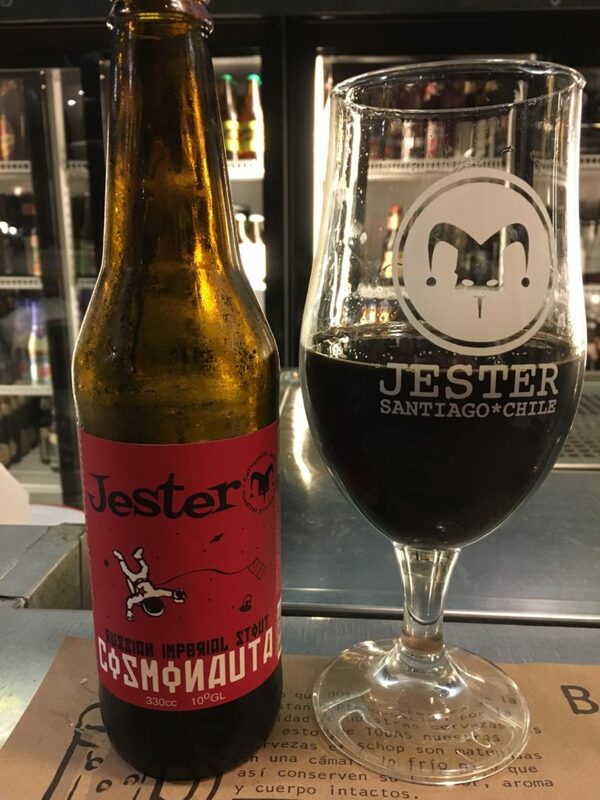 So, what better to do than to decamp to the attached restaurant for some pisco sours and eventually some delicious pizzas for dinner. Given it was our first night there, some relaxing was definitely in order, and we just hung around the restaurant for the evening playing with the resident cat and dog, and enjoying unwinding. We had absolutely nothing planned that we had to do the next three days, so for once, I was really looking forward to actually being on vacation! By the time we got back to the dome around 10pm it had cooled down nicely, and the outside temp was maybe 13-15 degrees and the dome was the exact same temperature – wonderful for sleeping! 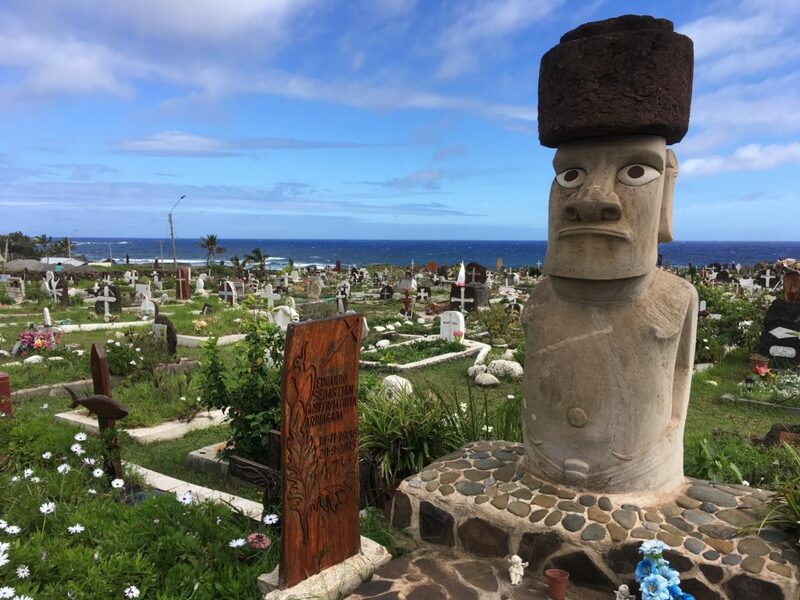 Managed a solid 9 hours of sleep in the wonderfully cool dome (thankfully I’d brought ear plugs, because the sound of roosters at 4am combined with dogs barking would have woken me up otherwise) and was ready to actually get out and explore Easter Island! After a great night’s sleep (but not nearly long enough) I woke up a little earlier than I needed to so that I could fulfil that most important morning duty: getting coffee. 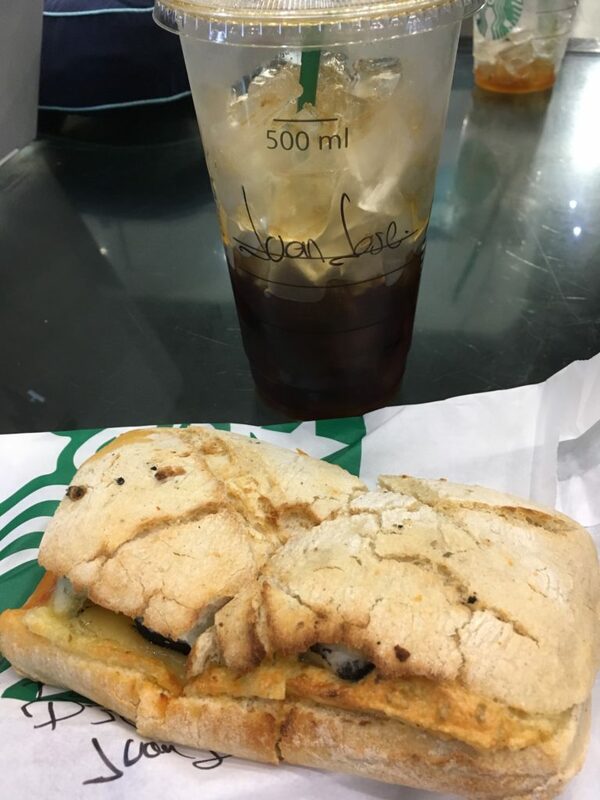 See, there’s a Starbucks attached to the Sheraton Maria Isabel, and it was advertised as opening at 7:00, so I showed up around 7:15, went inside…and there were no employees anywhere to be found. When one finally did emerge from the back room, she would only tell me they were opening “later.” Hmmm, ok…at least I knew the airport would have multiple Starbucks, so I would be saved as long as I could survive the un-caffeinated ride to the airport. Nice quick Uber ride to airport, under 20 minutes, and I got the honour of queuing to check in. When I say queueing, we’re talking nearly 45 minutes in line to get to an agent. Yes, this was the business class and elite check-in line, and it reinforced my theory of everyone on Aeromexico being an elite of some sort. When I finally got to the front, the agent pulled up my reservation (it had let me check in online from JFK to Mexico City, but wouldn’t allow me to check in to Santiago) and asked me if I was an Aeromexico employee. Uh, no? Apparently, somehow, something in my reservation mentioned stand-by status, despite not having this problem on the first segment. It was as simple as telling the agent this, and tap tap, click click, out came my boarding pass. Maybe a language gap? 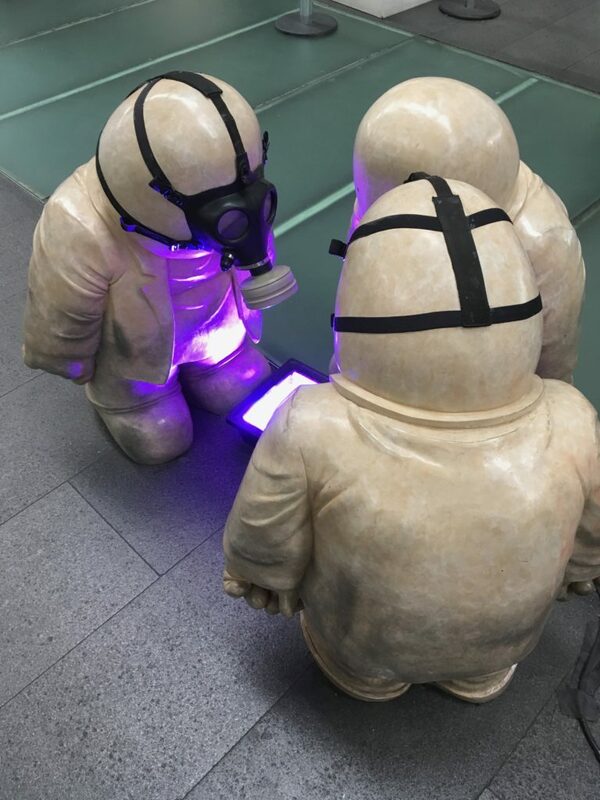 Onwards to security and the all-too-delayed Starbucks, and I came across this sculpture in the lobby. First the check-in issue, and now this…this airport was definitely doing everything it could to mess with my early morning un-caffeinated brain! Fortunately security took under five minutes, and the Starbucks was right there. Apparently Justin needs coffee too. 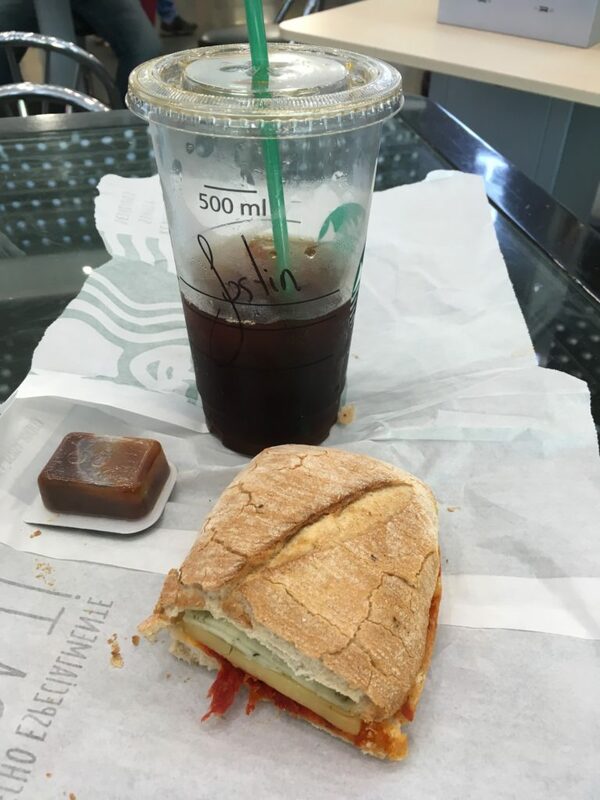 One of the downsides to all these Mexico City trips recently is that I got addicted to the Tres Quesos panini at Starbucks. Fortunately the airport location had it, and I was caffeinated, fed, and happy. Off to the American Express Centurion Lounge, which weirdly is up a rather long staircase, and from what I could tell had no way to access it by elevator. There may have been one, and I missed it. Found Phil who had arrived on the redeye flight from Los Angeles, and in we went. This lounge, unlike the lounges in the United States, is divided into two sides: a “regular” side, and a “centurion” side which is for Centurion cardholders and it appeared certain local bank customers may have also had access. It wasn’t at all crowded with maybe 10 people, and we were actually outnumbered by the staff I think. 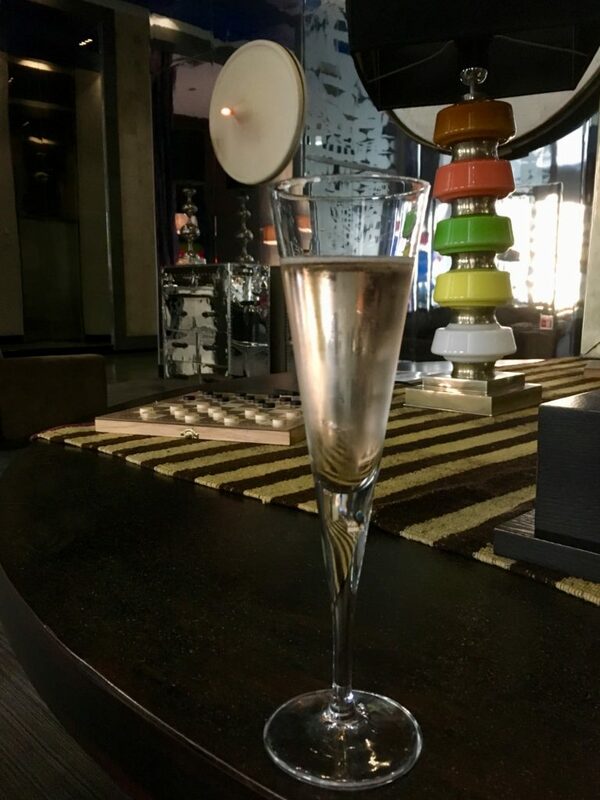 At the insistence of the staff we accepted a glass of champagne, since, you know, vacation! Unfortunately we only had about 30 minutes to spend in the lounge, then it was off to the gate for our flight to Santiago. Good thing we arrived relatively early, because once again there were 50+ people in line for priority boarding. That said, boarding was quick and efficient, and I was soon at my seat. 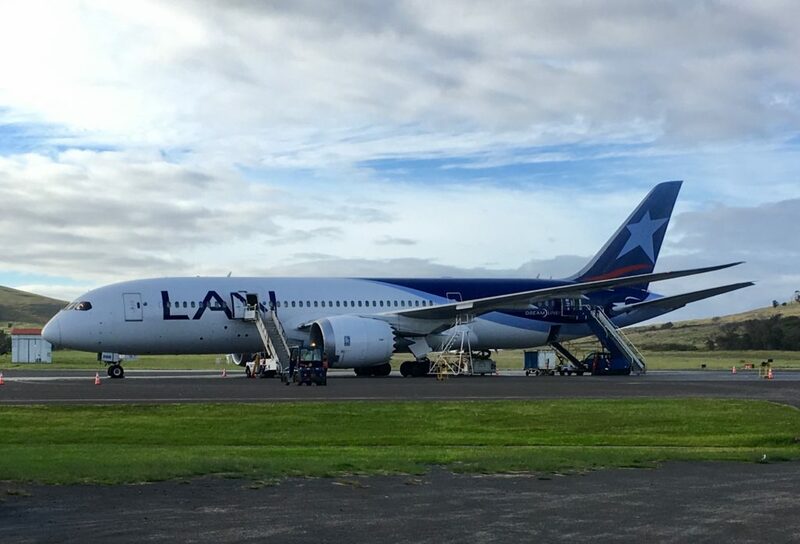 Overnight, the aircraft had been changed from a 787-8 to a 787-9 so that meant instead of 2-2-2 seating it was 1-2-1. Definitely a superior product, but it resulted in us being split up. Lots of people were in the same boat and trying to get seats together…or get a window seat now that they were single seats, and eventually we just decided to stay where we were…despite the gentleman who was coughing up a storm and seemed on the verge of sudden death between us. 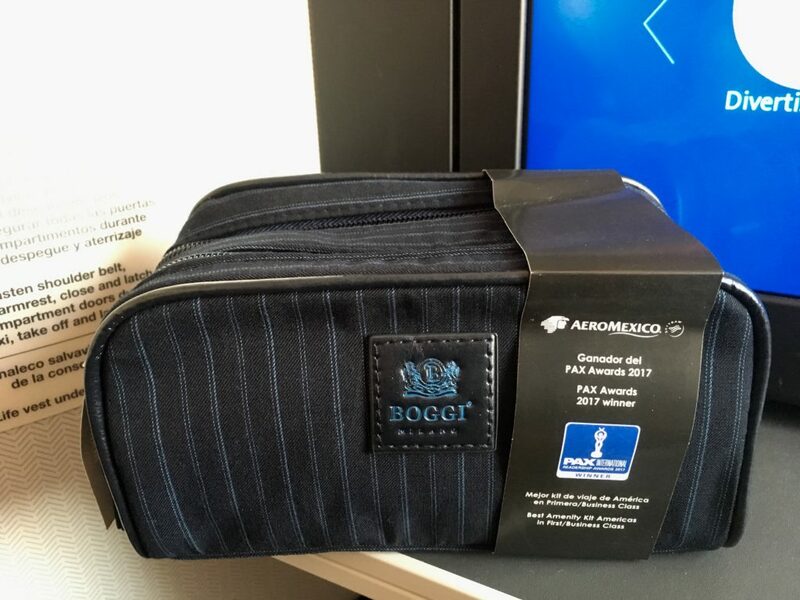 For those who like such things, the Boggi amenity kit. It was functioning and had all the things I normally want, but wasn’t cool enough that I decided to keep the bag to reuse later. 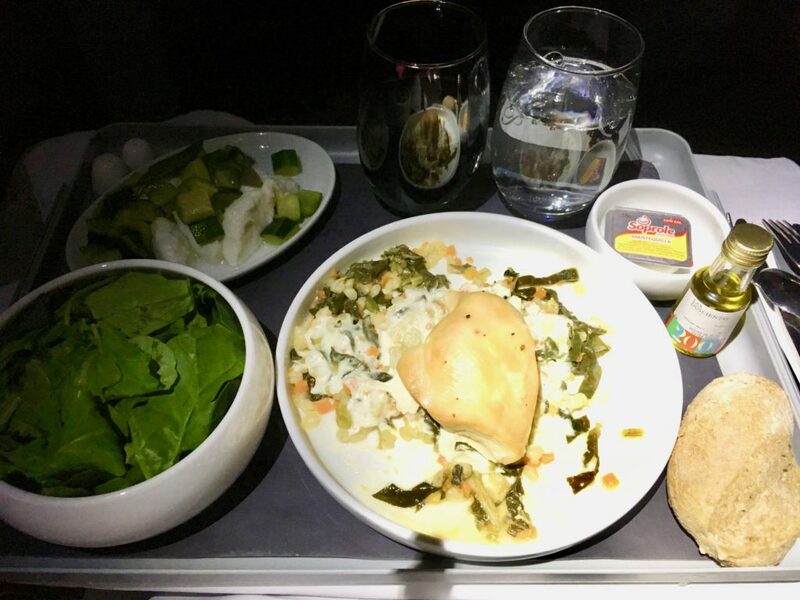 Meal service was definitely strange on this flight…and was listed as a “refreshment” right after takeoff, and then “lunch” 90 minutes before landing. Hmm, ok. There were two refreshment choices, a “BLT Sandwich” or “Mushroom tamale with green sauce.” Of course, by the time they got to Row 5 there were no tamales left, so it was sandwich, sandwich, or sandwich. To be fair, it was a pretty tasty sandwich, but in no universe whatsoever can it be called a BLT sandwich! 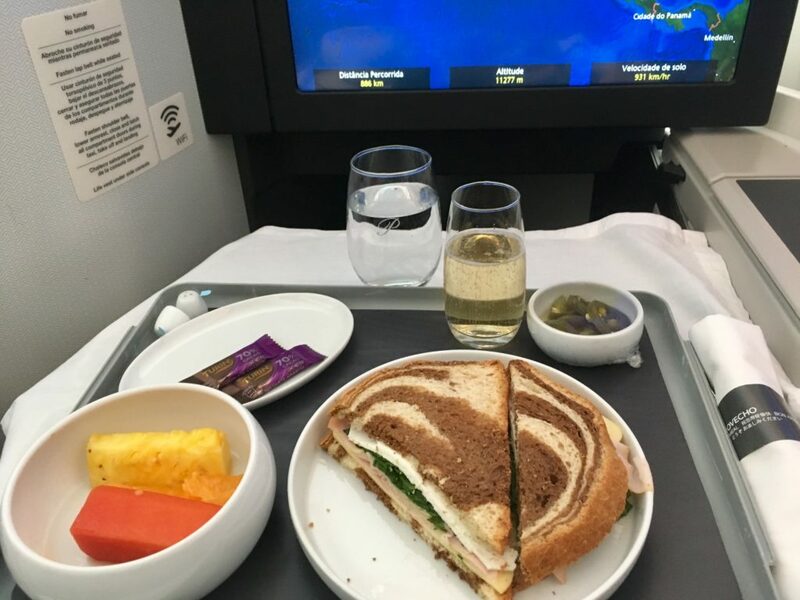 There wasn’t even bacon on it…but there was a tasty little bowl of jalapeños to add to it…and when prompted the flight attendant begrudgingly opened a bottle of Jacquart Brut champagne. The next five hours passed as predicted. 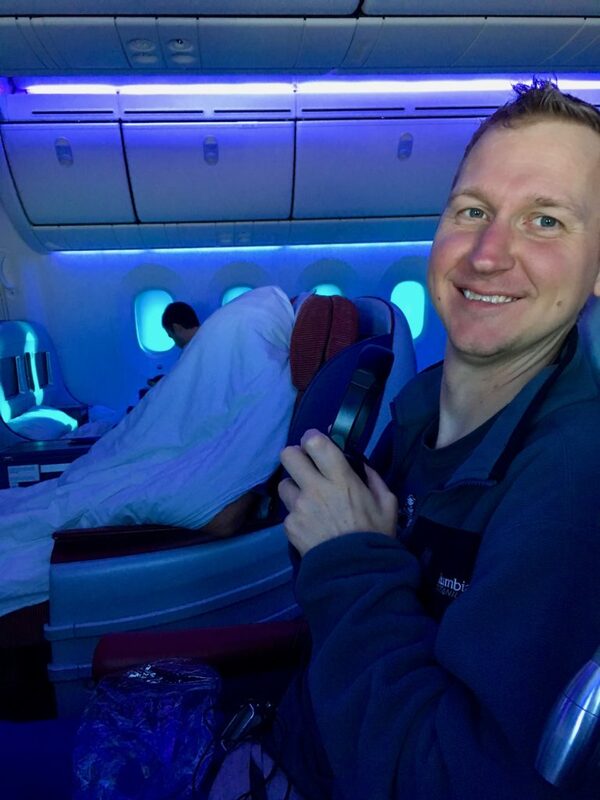 The flight attendants dimmed all the windows and LOCKED them in the dark position (one thing I dislike about the Dreamliner) in order to encourage people to sleep. They also turned up the heat pretty high…ugh. So, I spent five hours in forced darkness watching tv on my iPad…and only once did they come around offering drinks. Not the best in the service department. Another glass of the Montes Alpha Cabernet (which was actually pretty tasty), and a chocolate mousse bar for desert. 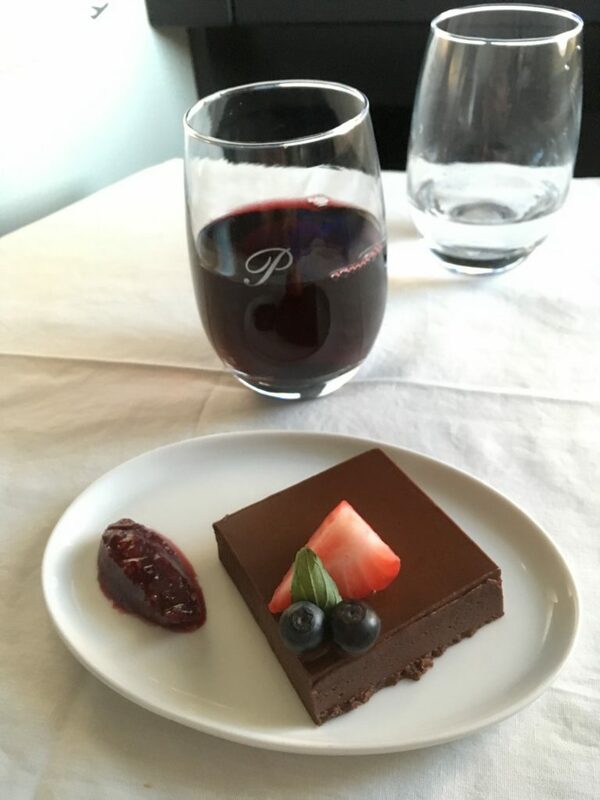 You really can’t go wrong with a glass of cab and chocolate mousse! 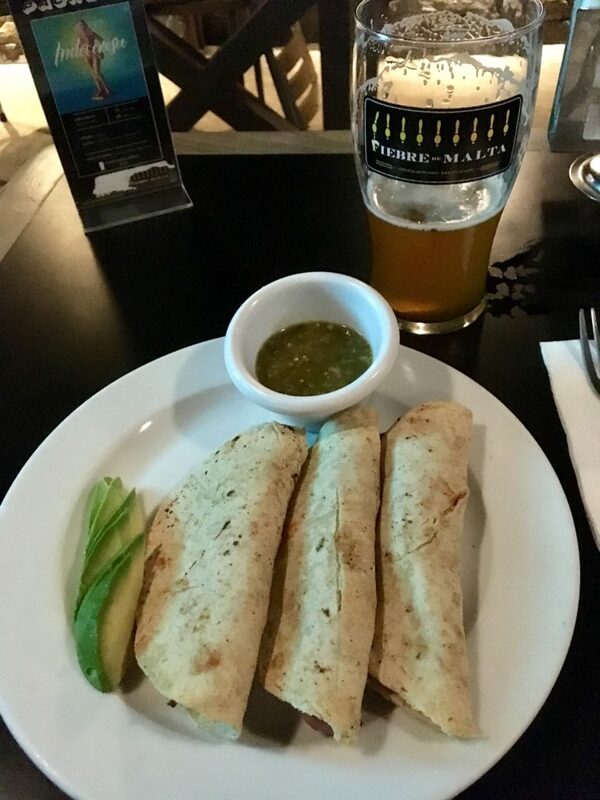 The perfect pairing! Landed about 30 minutes early, no line for customs, and we were pretty quickly in a taxi to the Four Points. Since it was just a short overnight we didn’t see the value in a nicer hotel, so opted for the Four Points thinking it would be nice enough. Well, it would have been, except for torrential rain and multiple accidents on the highway, which made the drive to the Four Points take just over two hours. Ugh. What should have been 30 minutes took four times as long, and by the time we arrived it was much later than hoped. 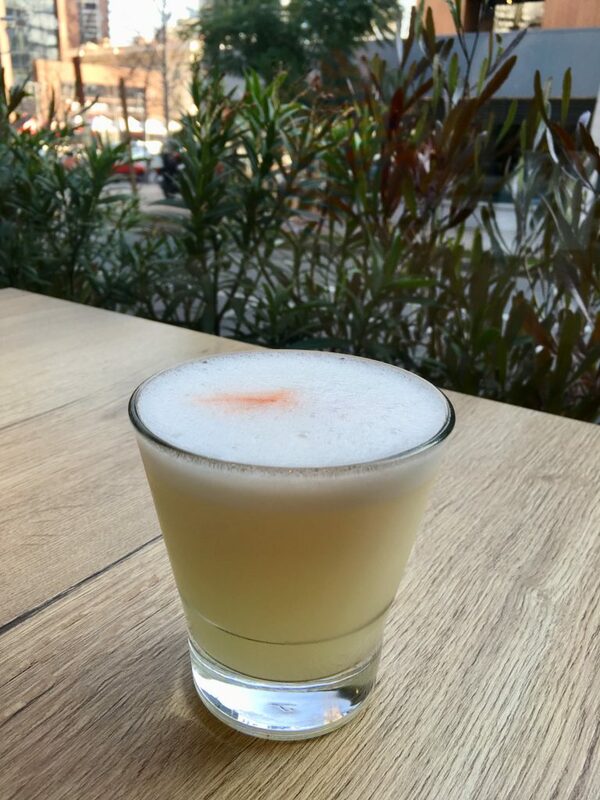 The Four Points was nice enough, however, to give us a couple of drink vouchers for the tiny lobby bar, where we were able to enjoy welcome pisco sours while figuring out next steps. Fortunately, there were a couple of bars and restaurants near the Four Points. We weren’t terribly hungry after the flight, so opted for a small snack at a place called Sacramento. 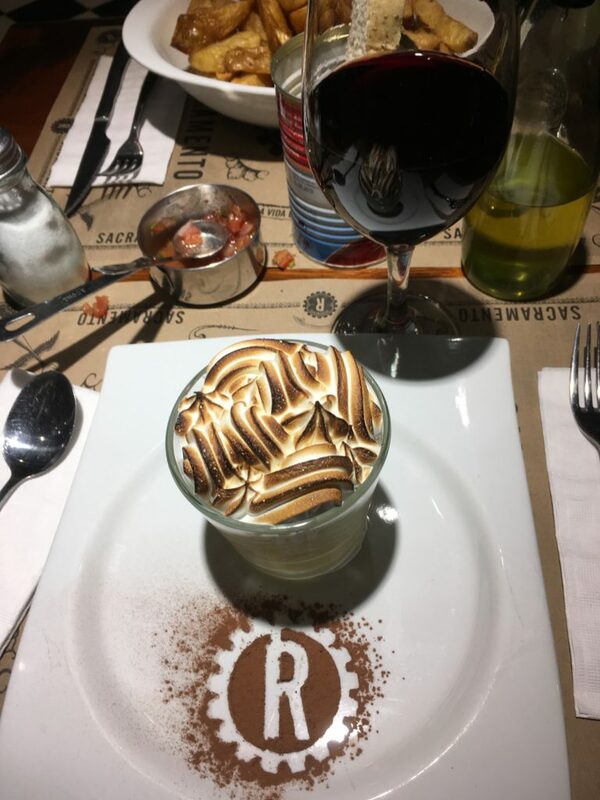 A delicious tres leches for desert and a glass of Carmenere was just what I needed. On the wander back to the Four Points we ended up stopping at some rather trendy restaurant called Piso Uno for another drink. 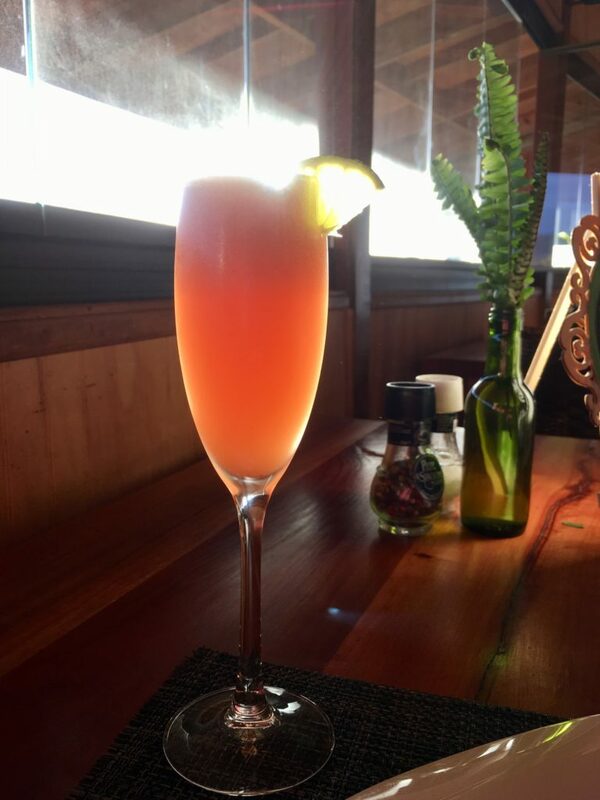 The best way to describe would be to say it was sushi, craft cocktails, and most of the bartenders were heavily tattooed with appropriately hipster manicured facial hair. It made for fascinating people watching while we enjoyed a couple of drinks, but was definitely mildly uncomfortable not being dressed for such a place. However, to their credit, they didn’t seem to care at all, and it was a fun way to end the night. 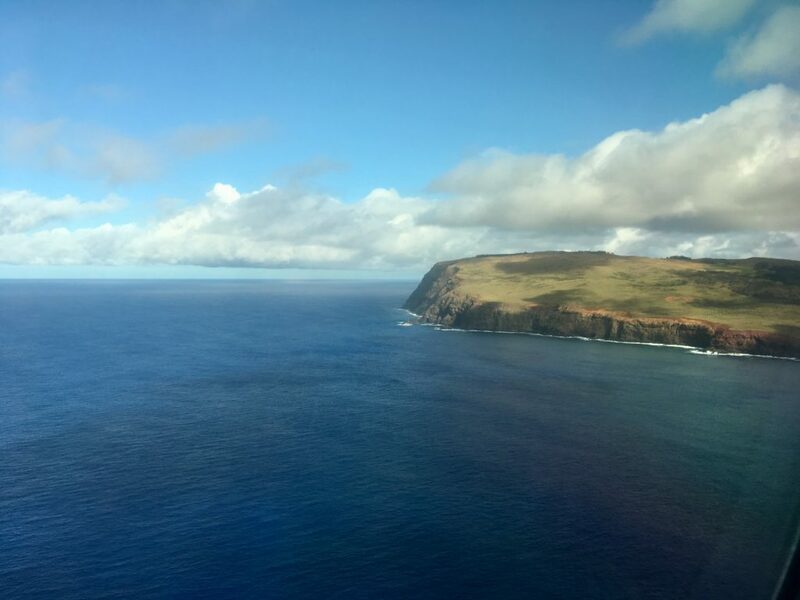 Back to the Four Points, off to get some sleep, and a very very early morning start for our flight to Easter Island! So, a bit of a background. 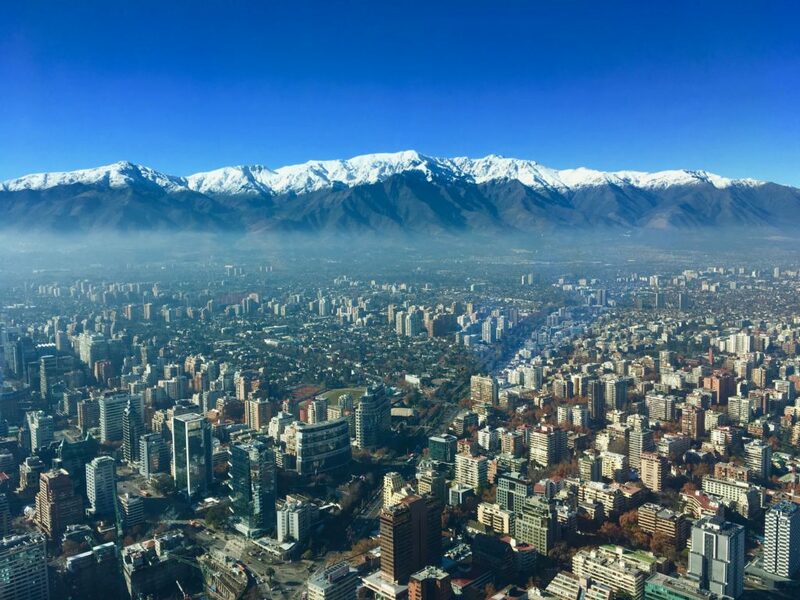 First, as I’ve mentioned before, this trip came about because of an incredibly good business class fare from New York to Santiago, Chile. Two things that make that noteworthy: first, I had to find a way to get up to New York to start and end the trip. I debated trying to fly standby, but with a paid ticket on the line, I decided it wasn’t worth the risk…so bought a one way up to JFK on Delta, and home on American. Why? Because the timing worked best with a 2:30 to 3:30 layover in New York. Other options would have been too close to risk, or so long it was ridiculous. Easy enough. Now, two years ago, when I finished going to every country, I always felt a bit bad about Mexico. I’d probably been to Mexico 5-10 times, but always daytrips to Tijuana or Nogales…although I once spent a three day weekend in Ensenada which is actually like 20 miles into Mexico, so I didn’t feel like I’d totally cheated. That said, I also didn’t feel like I’d “seen” Mexico. 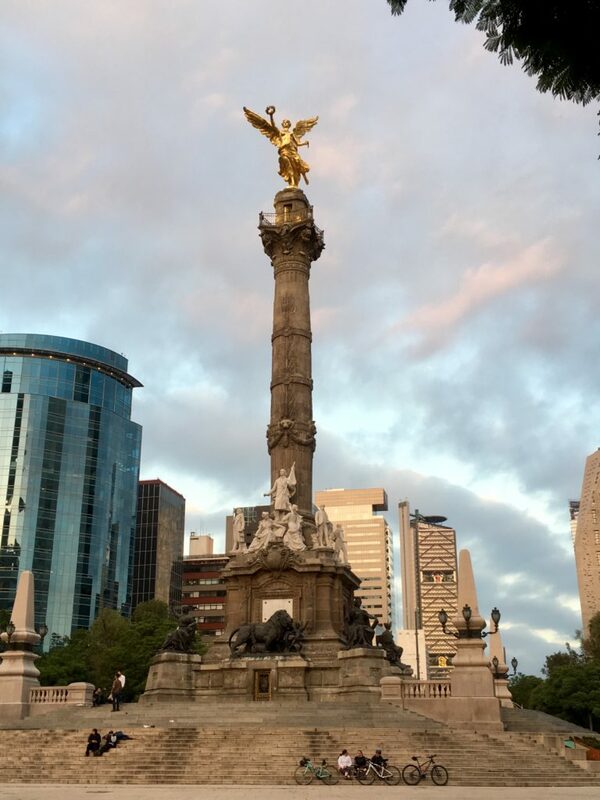 So, I was looking forward to an overnight in Mexico on this trip to see a tiny bit more…but then a couple weeks after booking, I ended up with a five day trip to Mexico City for work, which gave me a couple of full days to explore the city. 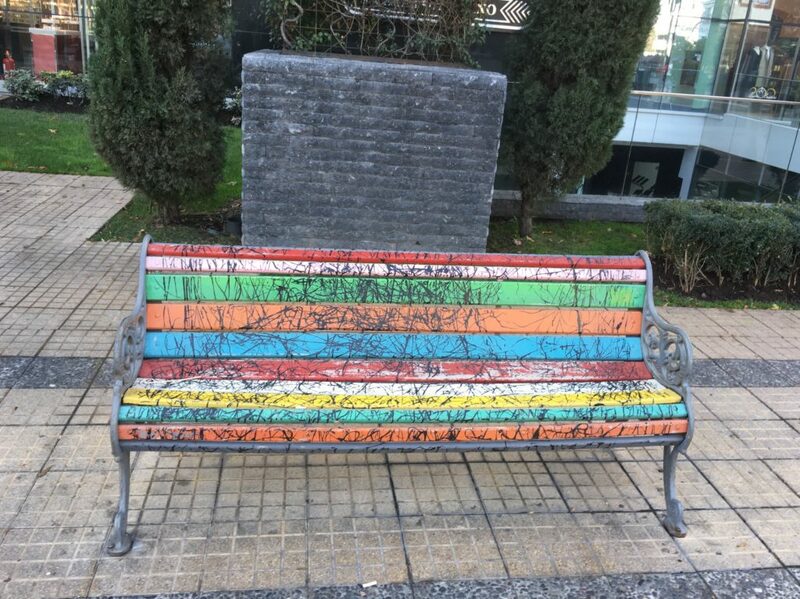 Then, a week before leaving on this trip…another last minute trip back to my client in Mexico City, meaning I would be flying BACK from Mexico City on a Wednesday…and then flying right back on this trip on Thursday. Yes, twice 24 hours apart. Life has a funny way sometimes of surprising us. Right, so, not much to say. Off to National Airport, no real lines, and boarding right on time. 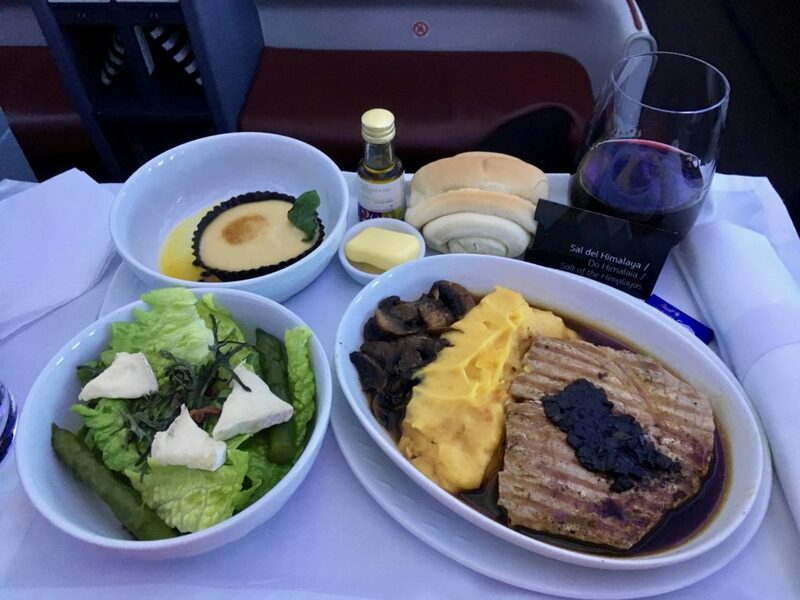 I had decided to risk the upgrade for the short flight rather than pay Delta the extra $150, and I was surprised three days before when my first class upgrade came through. Nice little surprise…until I woke up the morning of the flight to see that Delta had downgraded me again…the usual DCA issue of Federal Air Marshalls taking your seat at the last minute…although they’ll never really admit that’s what happened. 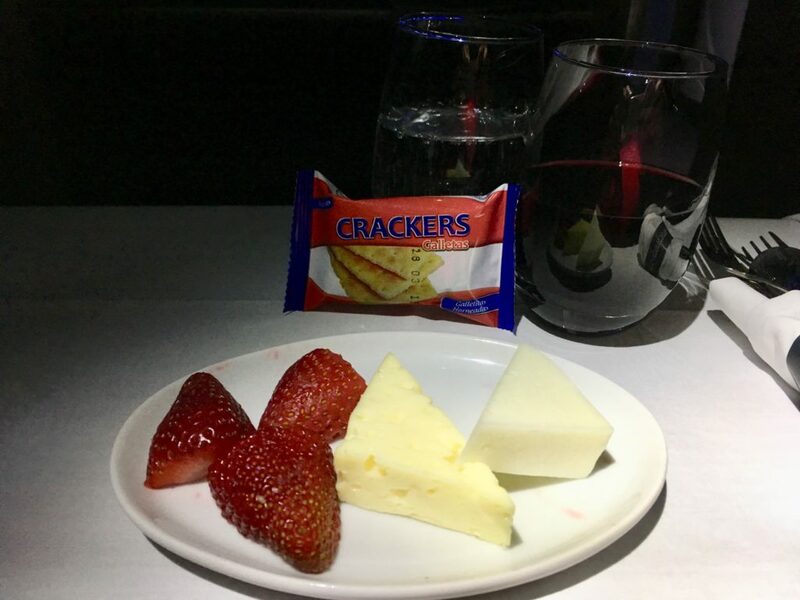 10,000 miles later, Delta had done the right thing – I only hope the government is compensating them for all these clusterfucks…I’ve seen it happen at DCA way too many times. Quick flight, no taxi/takeoff delays which is very unusual on a DCA-JFK flight, and soon we landed in JFK. I’ve never flown Delta through JFK before, so apparently I was destined for the complete experience. Landing and parking at Terminal 2, taking the “JFK Jitney” bus over to Terminal 4, and then walking pretty much to Connecticut to the rather remote Delta SkyClub. Of course, the Aeromexico flight was at the far end of Terminal 4 from the SkyClub, so I promptly left Connecticut, and undertook the rather long walk to New Jersey. Stopped at Peet’s Coffee on the way (ok, so maybe I don’t hate Terminal 4 quite so much now) and was greeted with a 100+ person long queue for priority boarding at the Aeromexico gate. I was beginning to get the impression that everyone must be “elite” in Mexico, but no big deal..there would be plenty of overhead space. Unfortunately, Mexico had just lost to Brazil in the World Cup, and my flight was packed with fans coming off the Aeroflot flight from Moscow who were all in a rather dejected mood. 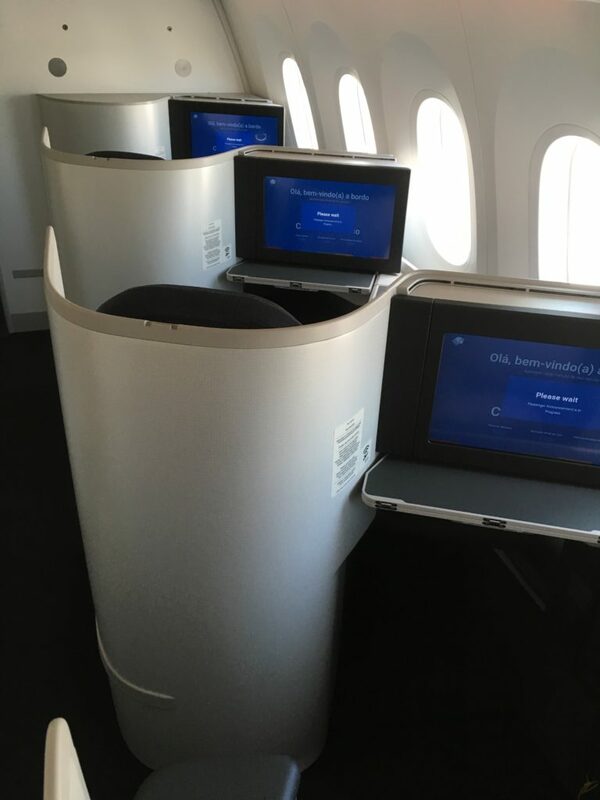 First impression of the seats on the Aeromexico 787-9 was fantastic! Roomy, and quite private. Impressed from the other side too – the walls are high enough you can’t see the people, and the way the seats are angled to the window you’re not looking at the person across the aisle either. Plus, the seats were nice and wide. What a fantastic product! 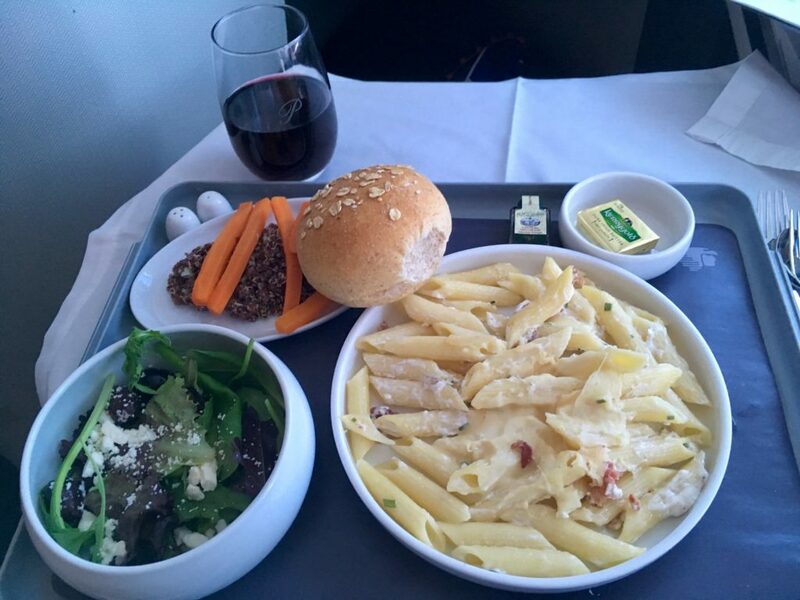 Once up in the air, lunch service promptly started. 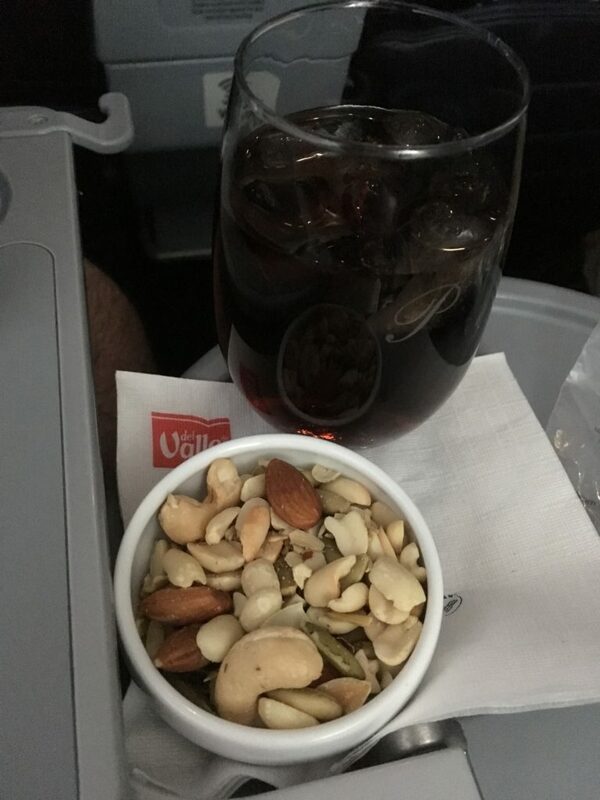 I’m pretty over the mixed nuts that seem to start off every international business class meal, and Aeromexico was definitely out to impress. 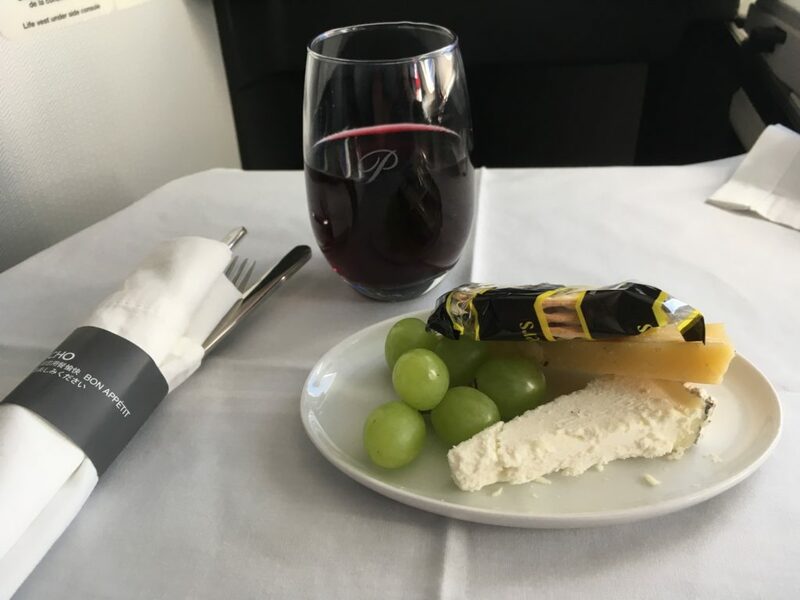 Cheese as a starter pre-meal with my wine? Aeromexico, I think we’re going to get along just swimmingly! I can’t remember the time I went with the pasta option for a main, and I regret doing it now. 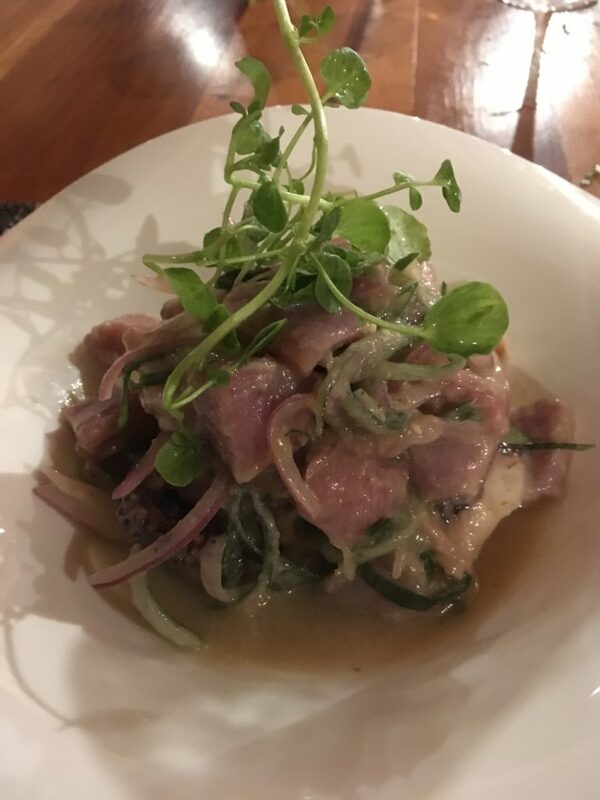 Bland, flavourless, and the quinoa salad was pretty terrible as well. This meal had so much potential…just a bit more bacon on the pasta, maybe a bit more cheese, and a little more cream to the sauce and it would have been wonderful. Unfortunate, because after the cheese starter I had such high hopes! 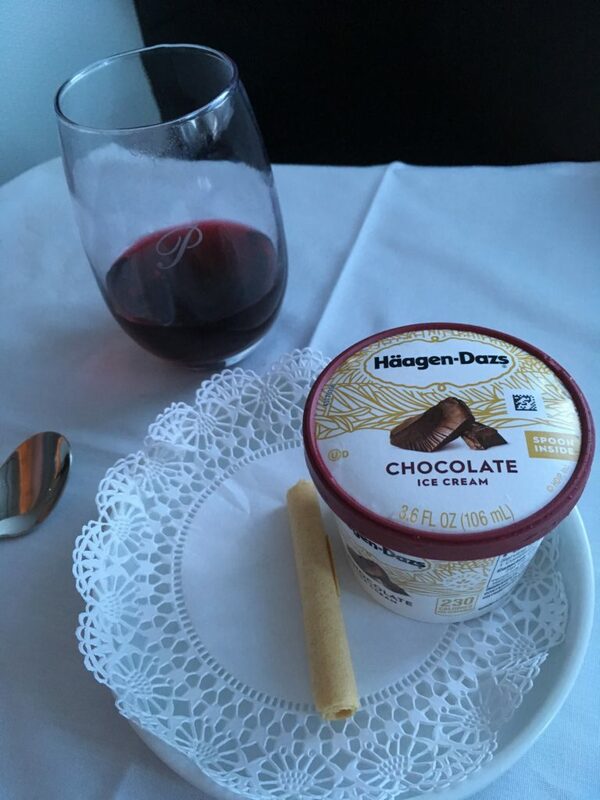 I know lots of people whine about “packaged deserts aren’t appropriate in business class” but give me some delicious ice cream any day to some dried out piece of cake. 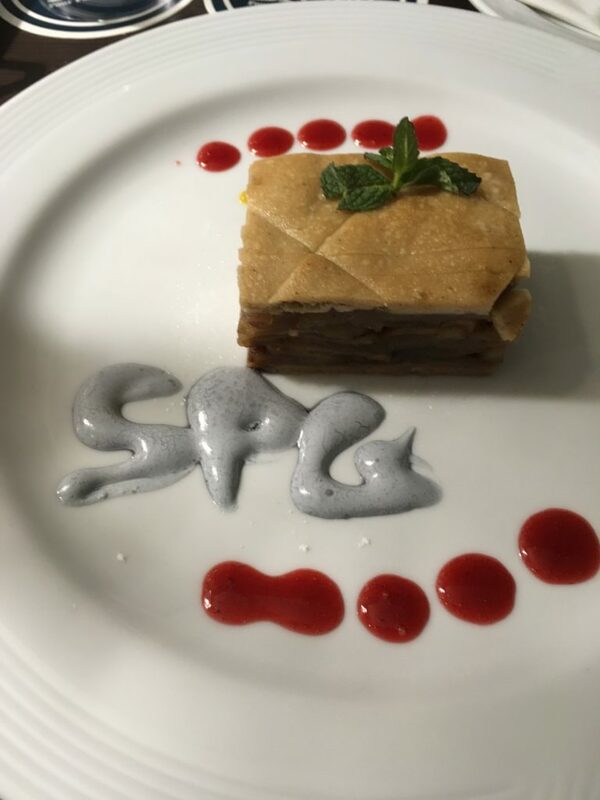 Simple is best when it comes to desert in the air! Landed about 30 minutes ahead of schedule, no line at all for immigration, and soon I was in my taxi. 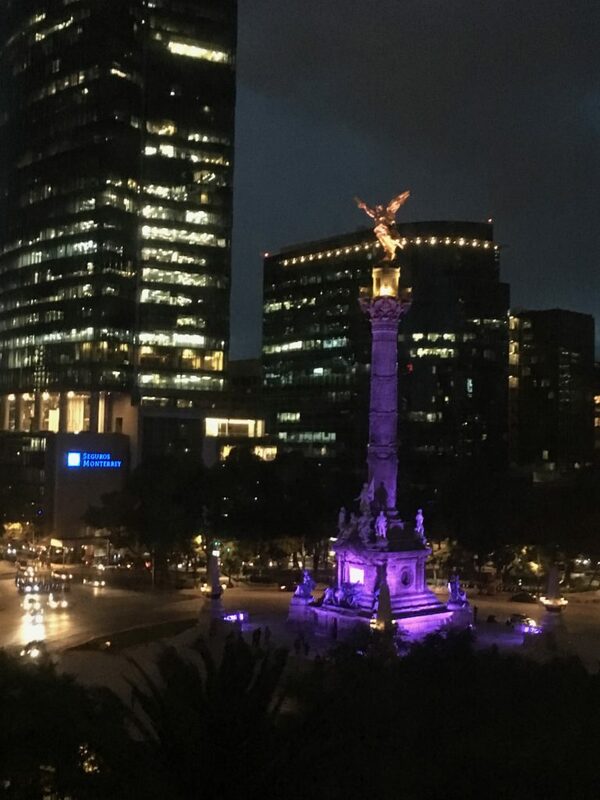 It was absolutely pouring rain outside, but there was no traffic at all (how can that be at 7:30pm in Mexico City?!) and in less than 30 minutes I was at the Sheraton Maria Isabel Hotel. 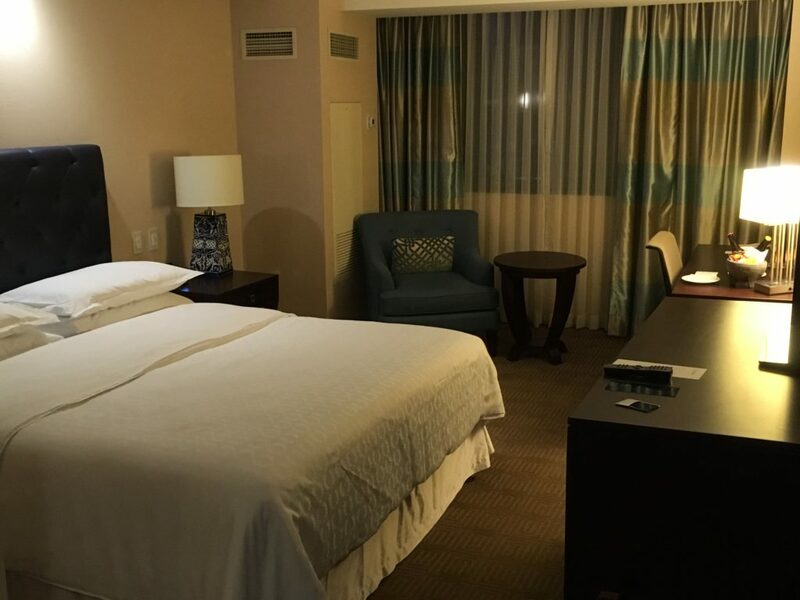 On my previous trip when I had a weekend “downtown,” I chose the Le Meridien, which I found very disappointing. Not a great location with much going on around it (though very convenient for my Historical Center walking tour), and old rooms that loud rattly air conditioning. Add to that a very disappointing and shabby bar, and I wasn’t keen to try it again. 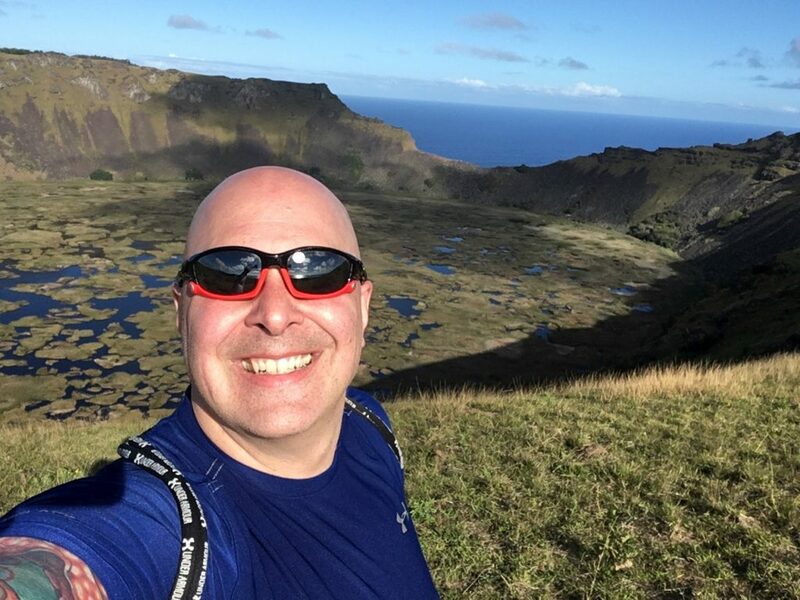 Either my Spanish is getting better, or the staff at the Sheraton wasn’t too keen to practice their English, so I think I managed my first every check-in completely in Spanish, complete with a discussion about all the platinum benefits they offer. Not bed! 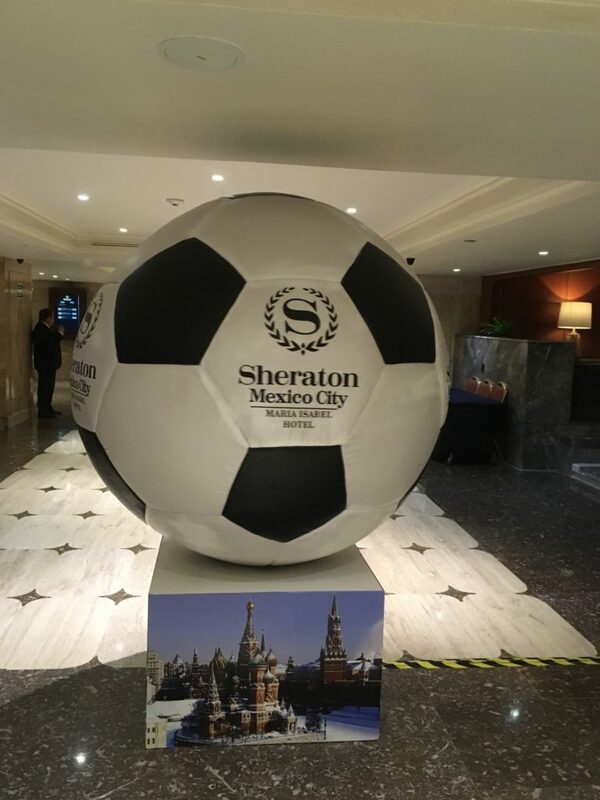 Lobby had a giant soccer ball in it in honour of the World Cup…only sad that Mexico had just been eliminated. Sleeping area was pretty generic Sheraton-standard, but ice cold air conditioning was very welcome! 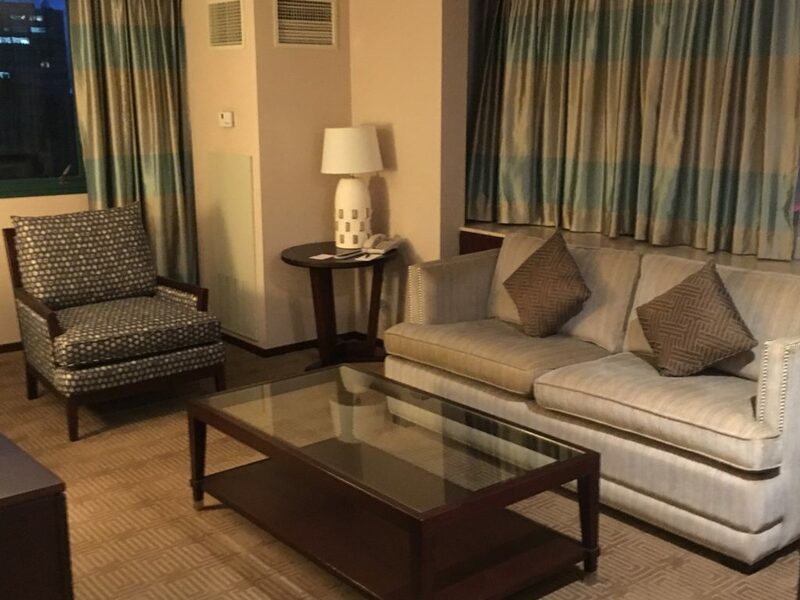 Second room of the suite…you could have a party in this room it was so big! 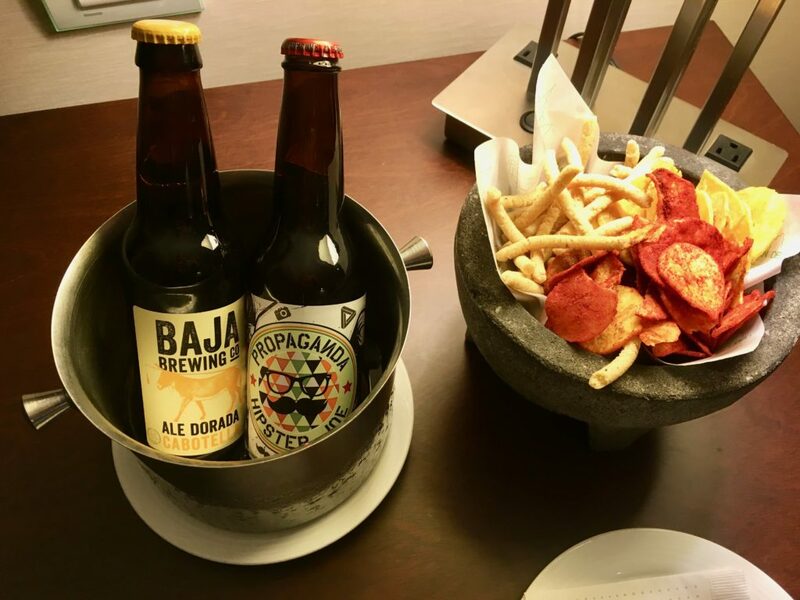 …they must have known I was coming, because a couple of craft beers and some snacks were waiting for me in the room. 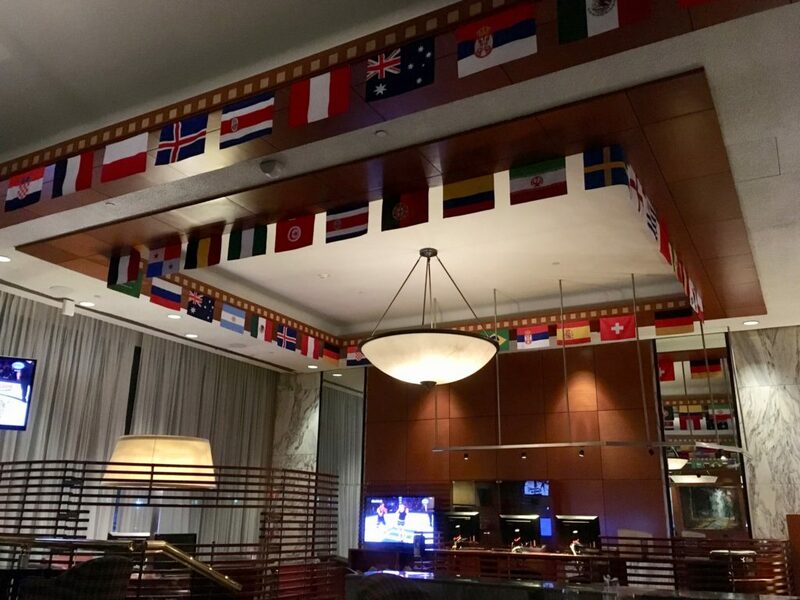 Back to the Sheraton, I still wasn’t tired, so decided to have a Patron margarita and enjoy the World Cup decor in the lobby bar. MUCH nicer than the lobby bar at Le Meridien. The margarita showed up, and was clearly made with fresh-squeezed lime and was delicious. This stay couldn’t have been more night and day compared with my stay at the Le Meridien, and there’s no doubt I would stay here again. I had such a nice stay that I think I need to return again for a 3-4 day weekend and explore the city a bit more in depth next time.